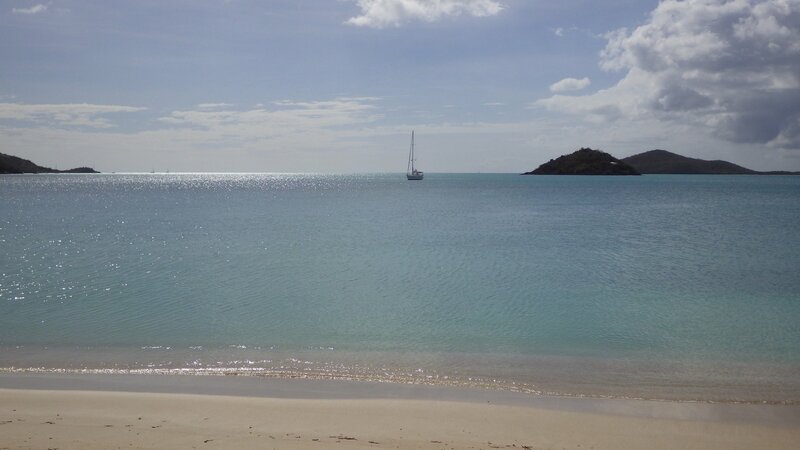 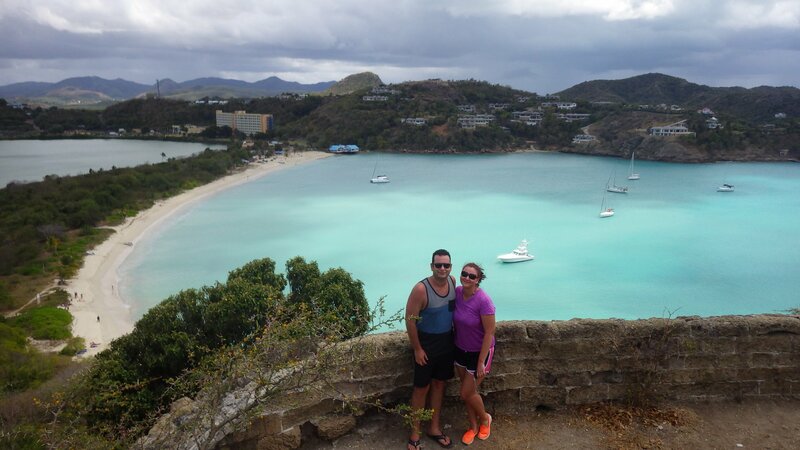 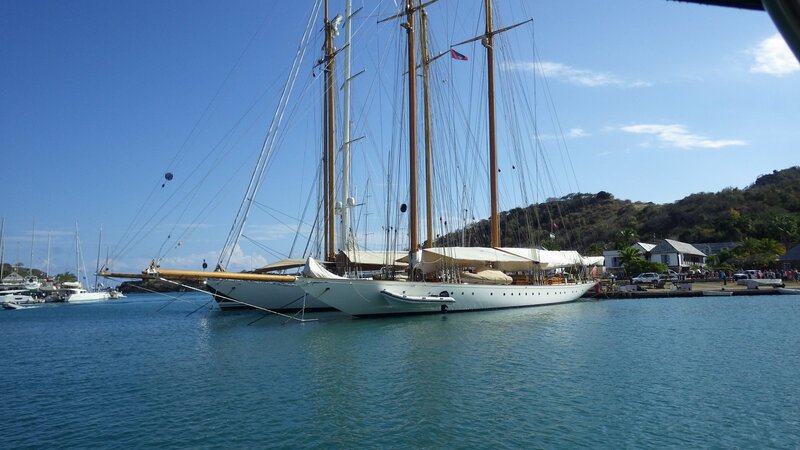 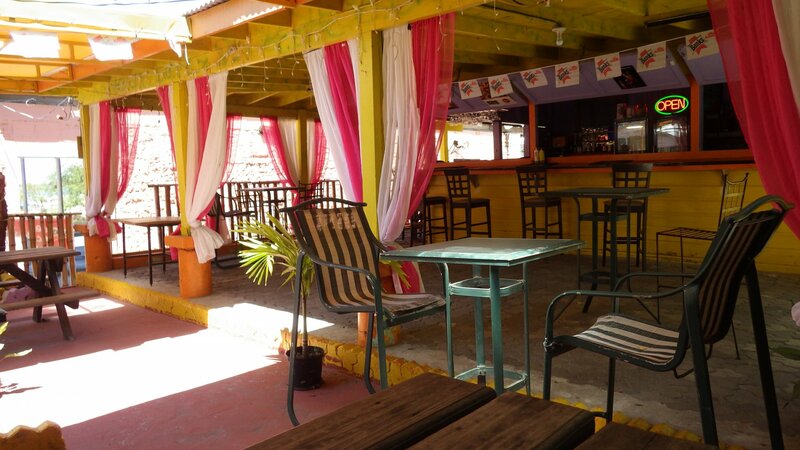 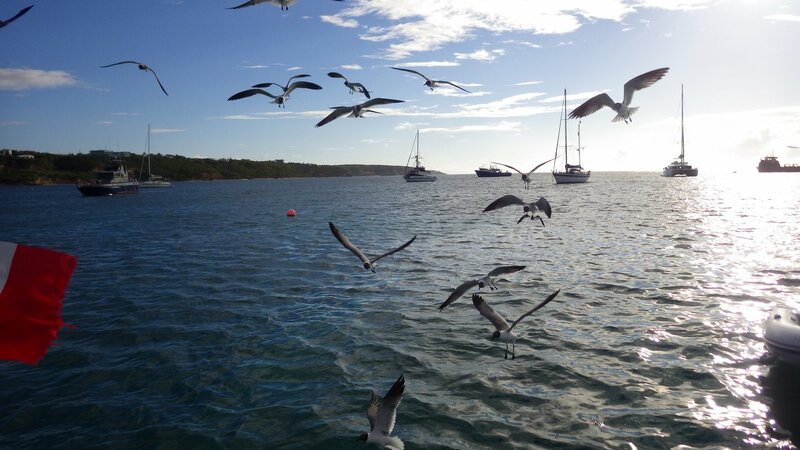 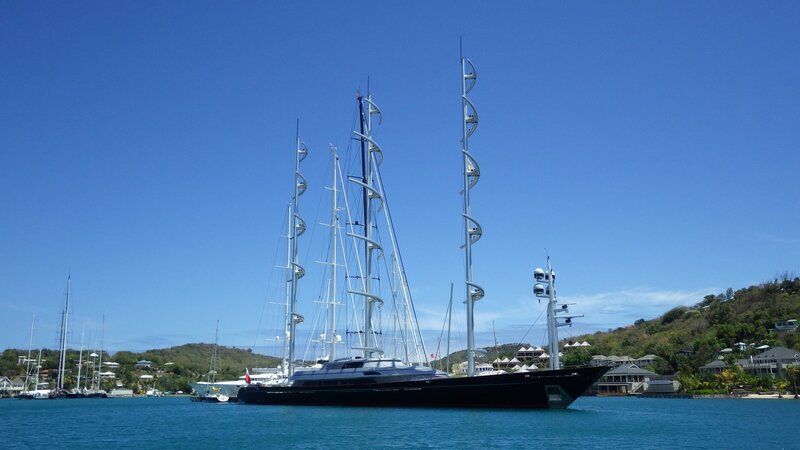 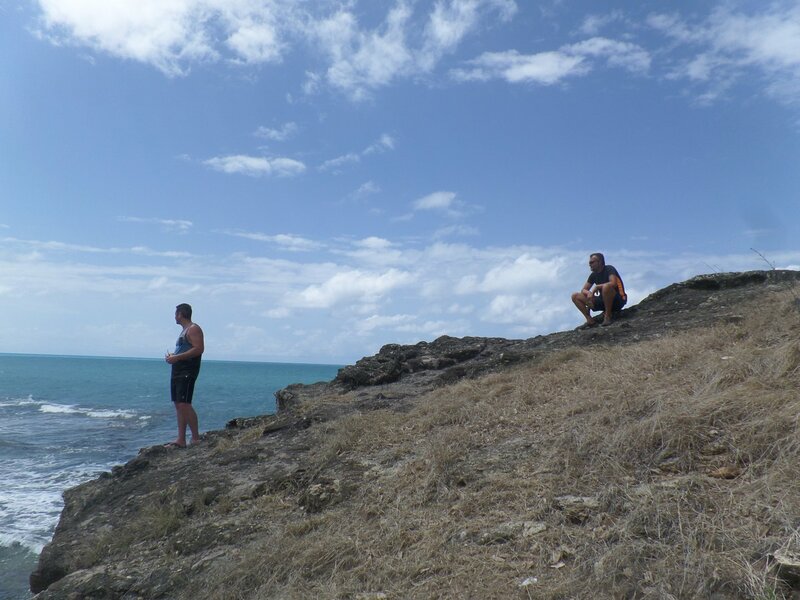 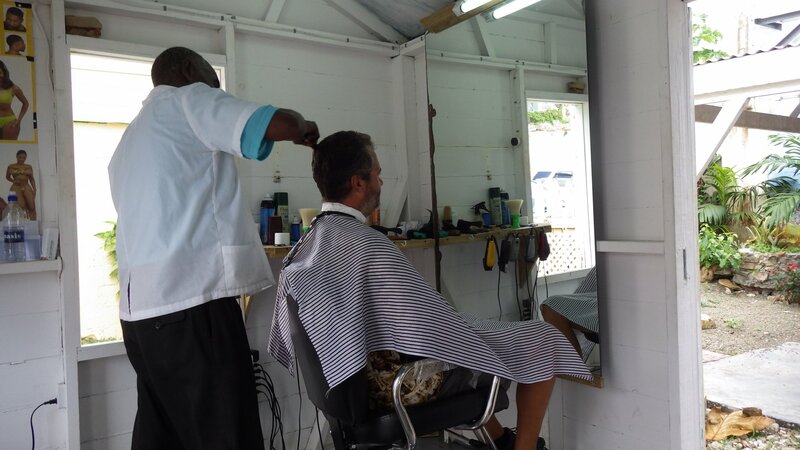 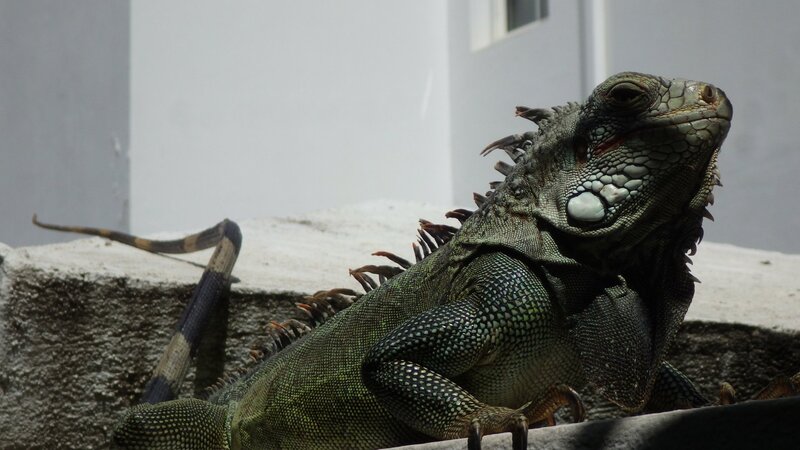 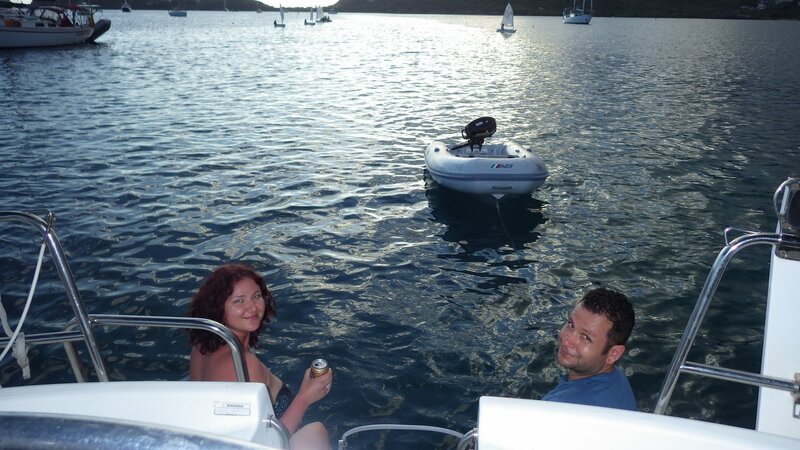 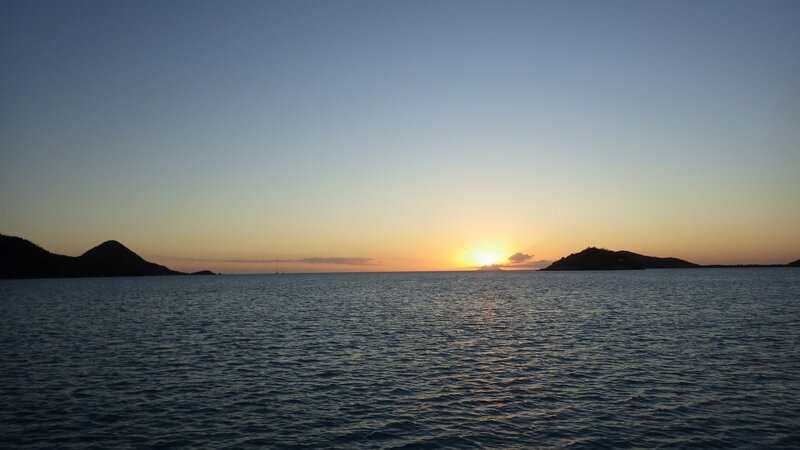 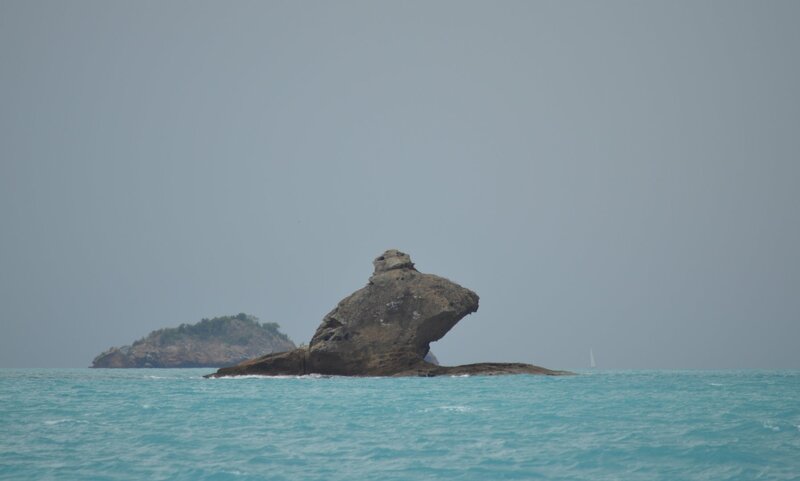 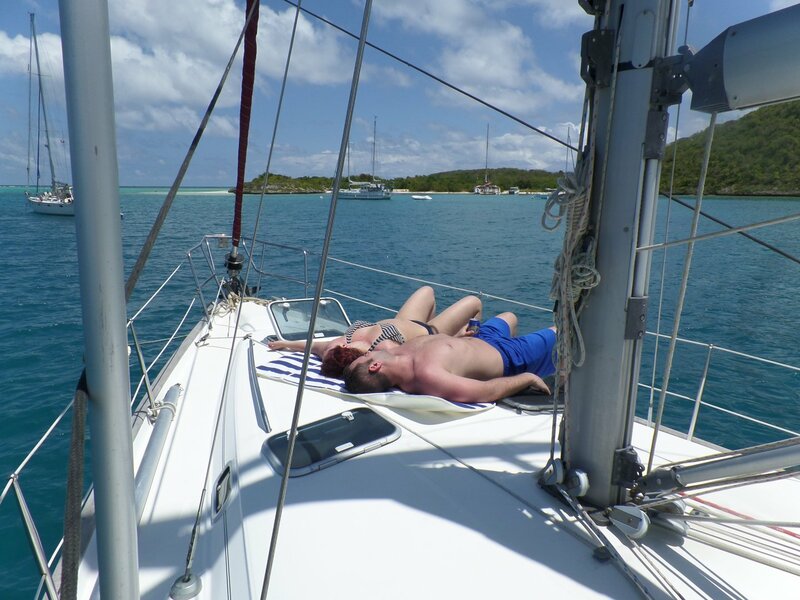 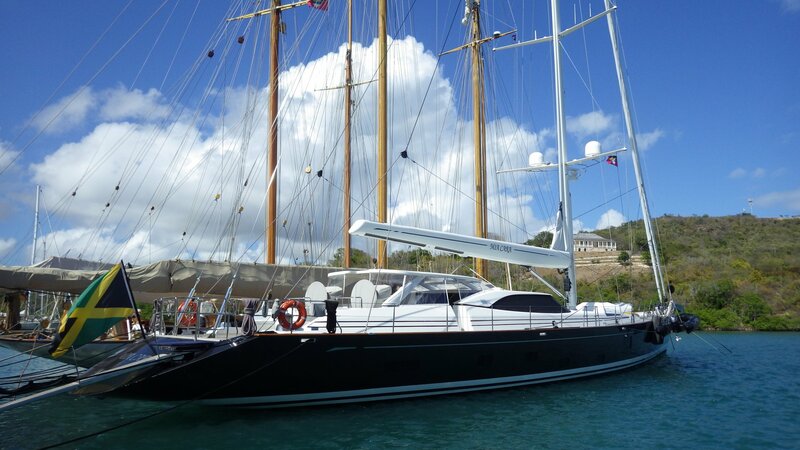 This was our first visit to Antigua. 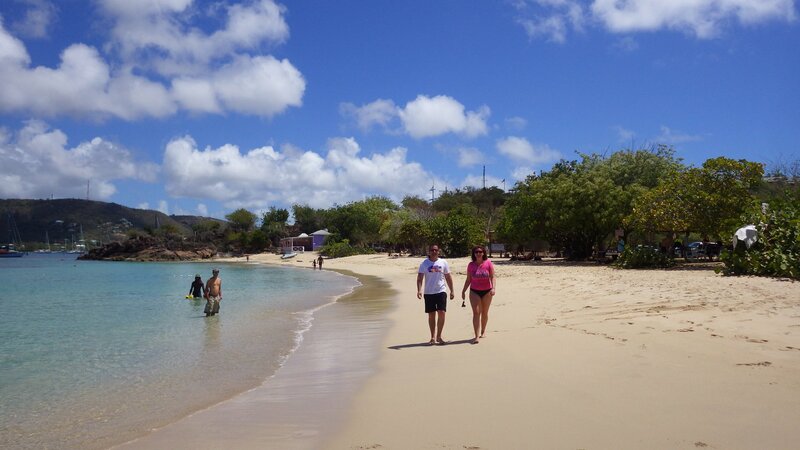 Our daughter with her boyfriend joined us during one of the weeks we were here. 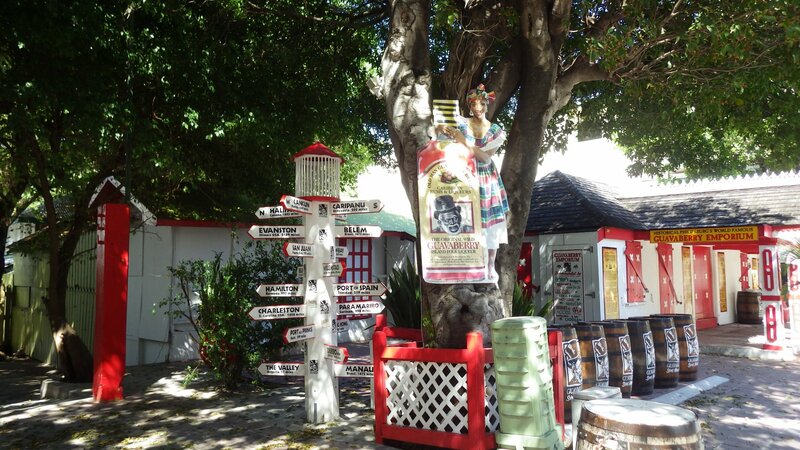 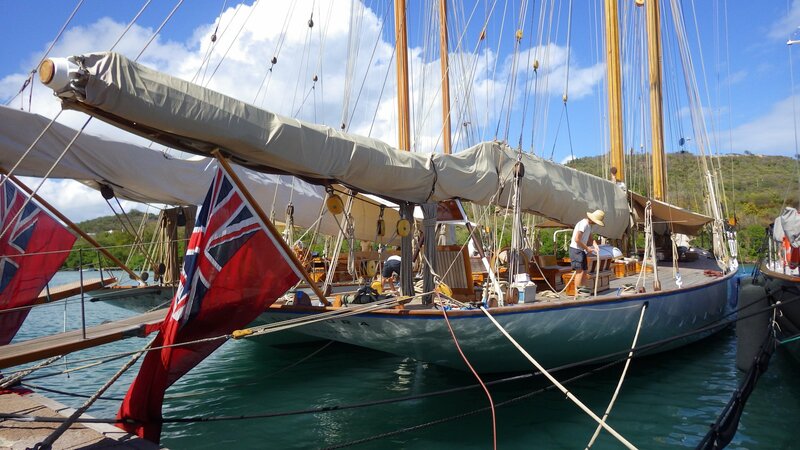 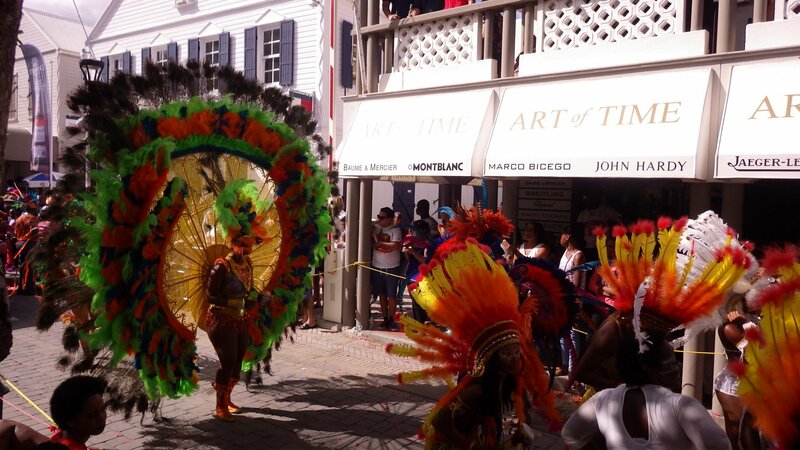 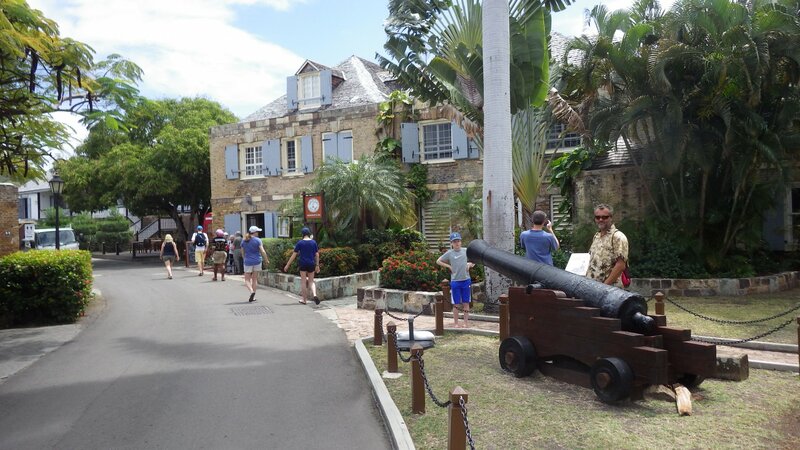 Antigua definitely shows its British heritage. 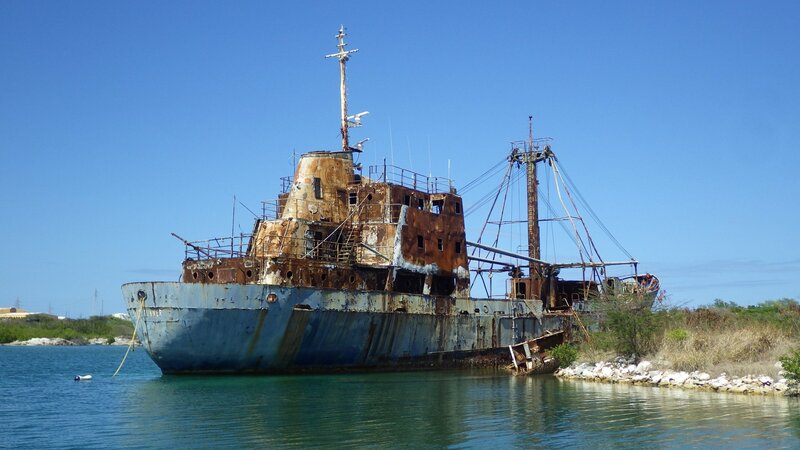 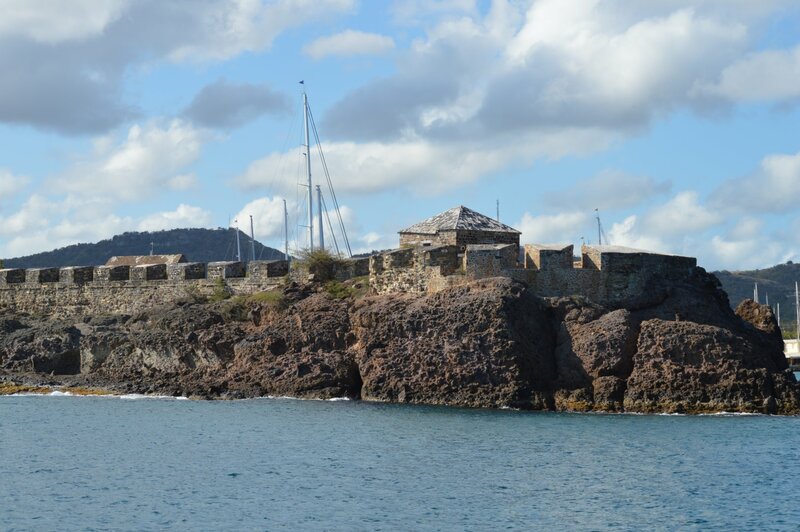 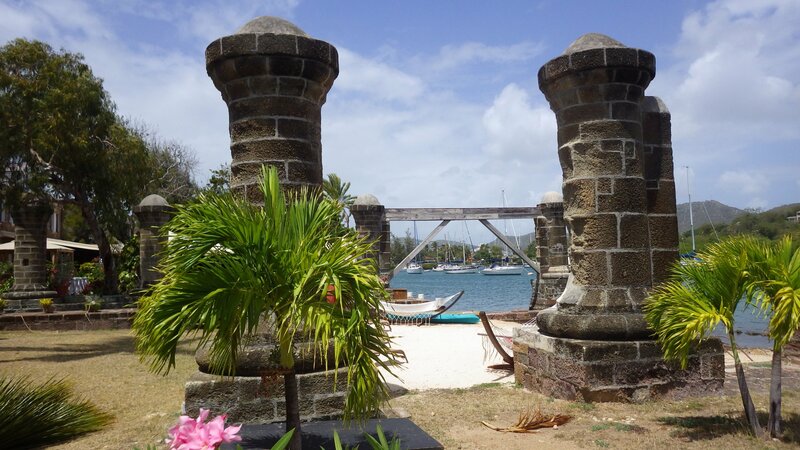 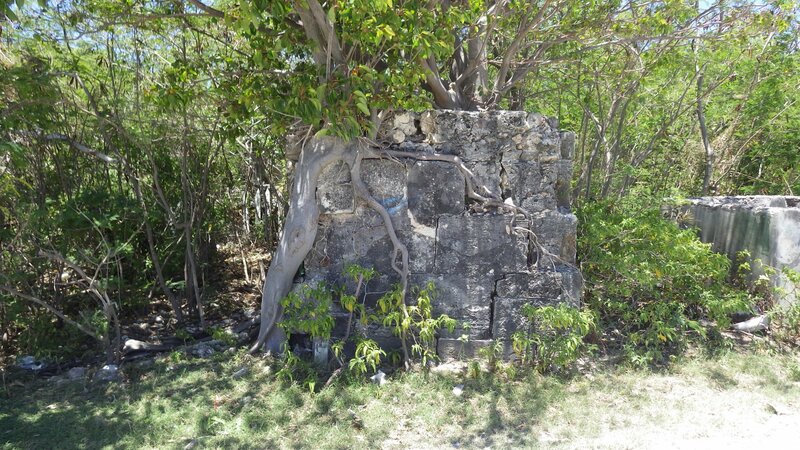 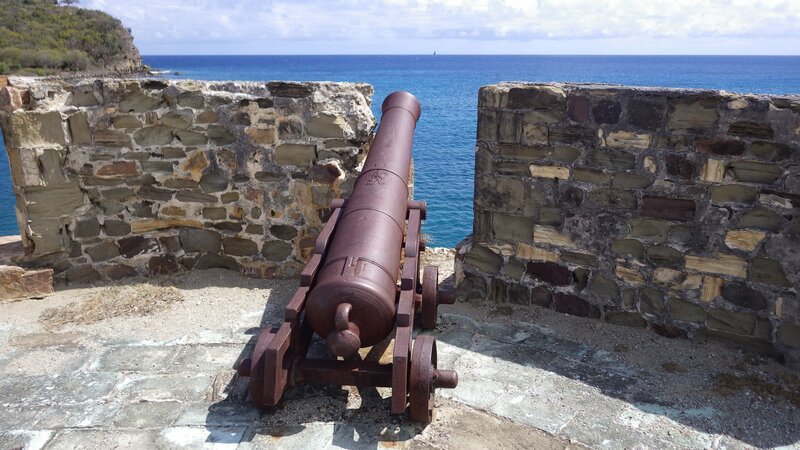 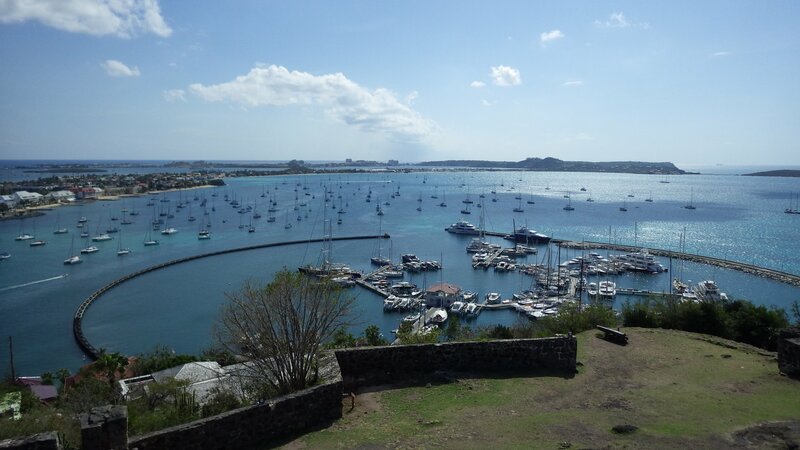 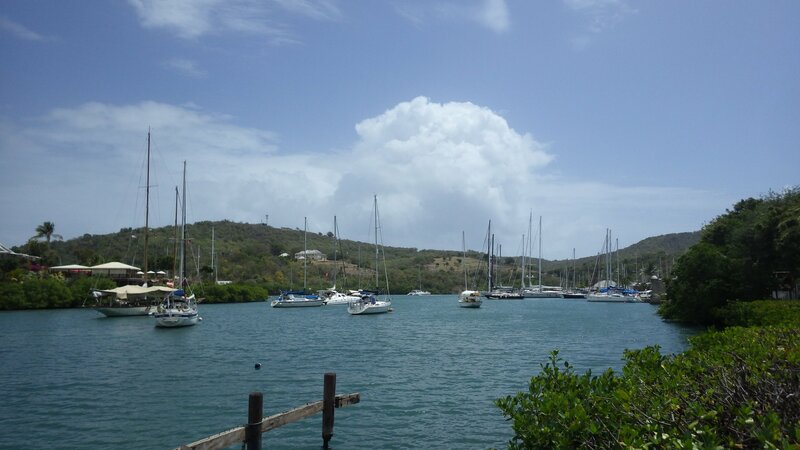 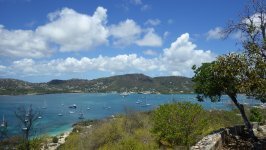 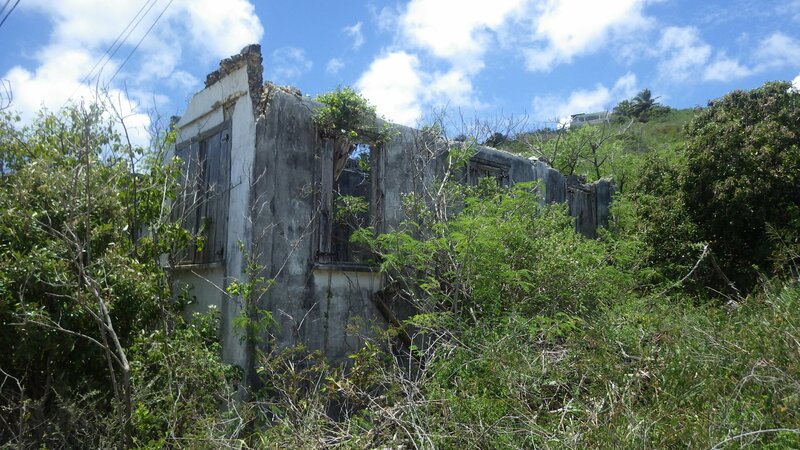 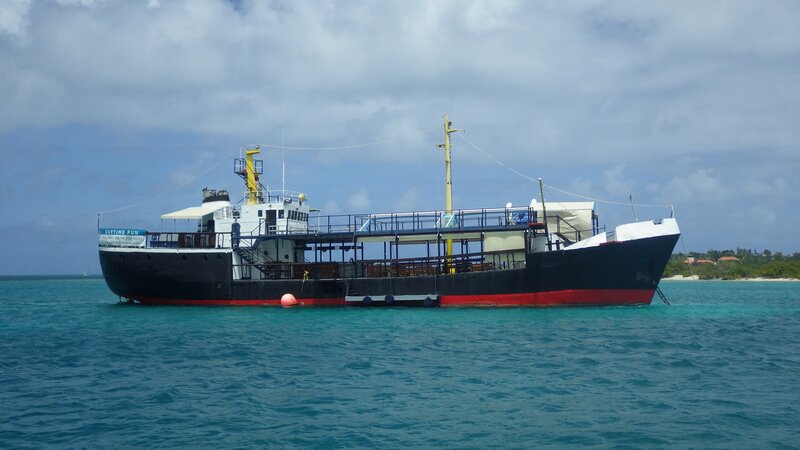 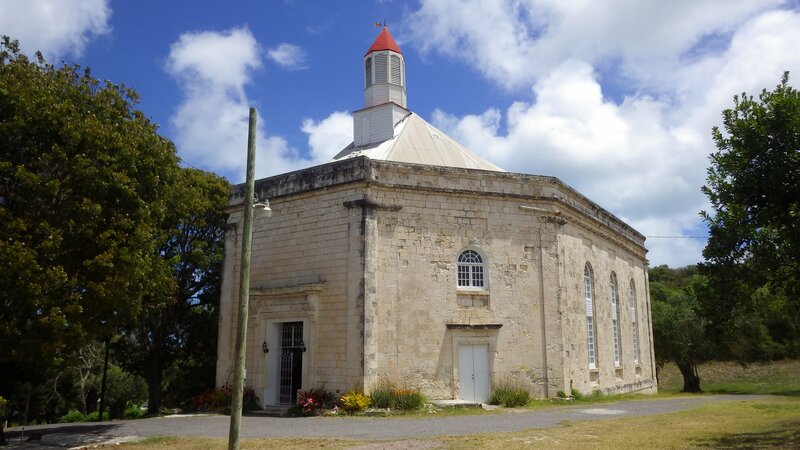 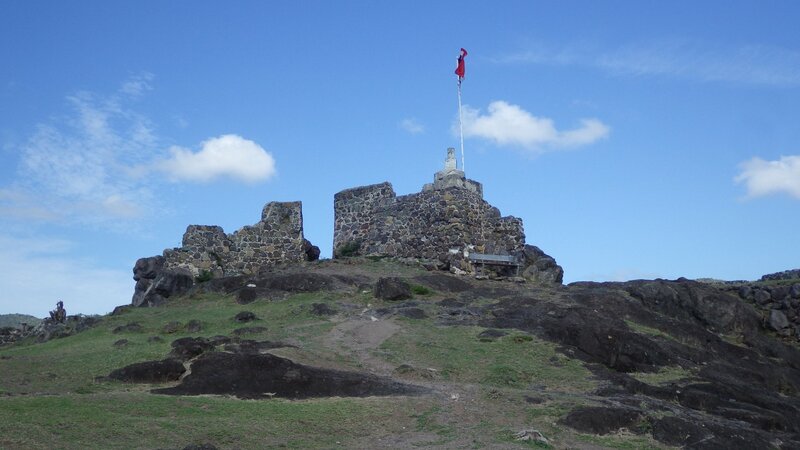 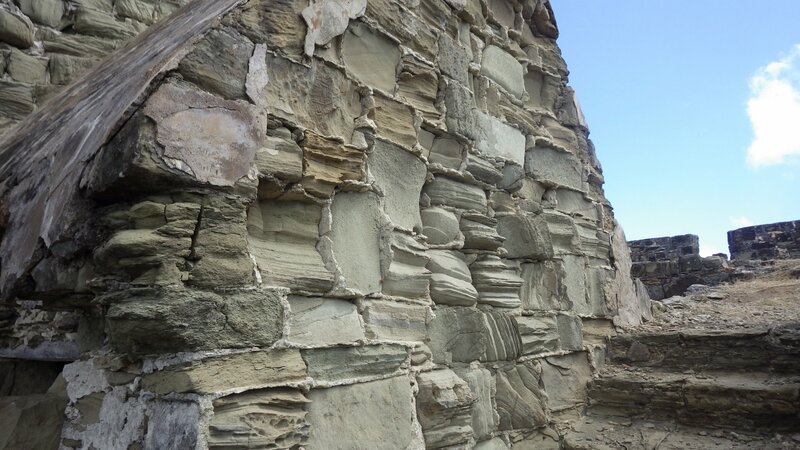 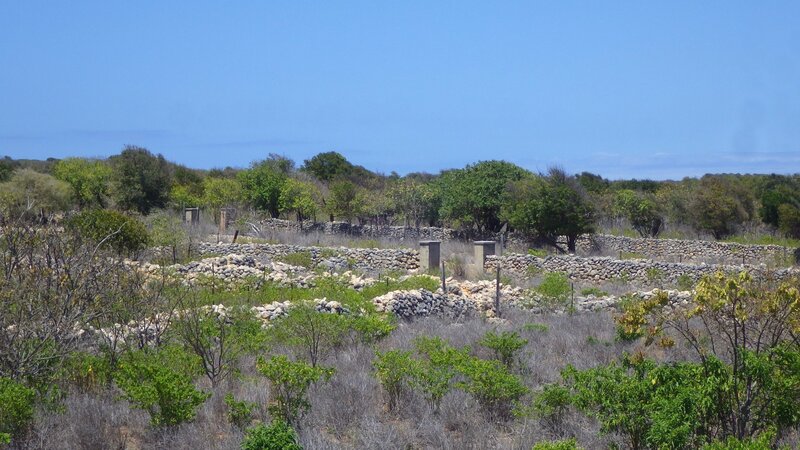 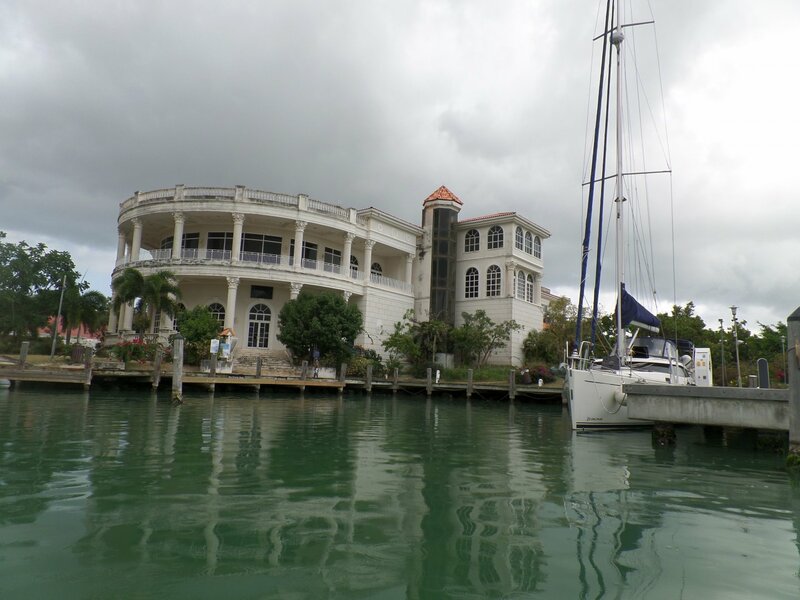 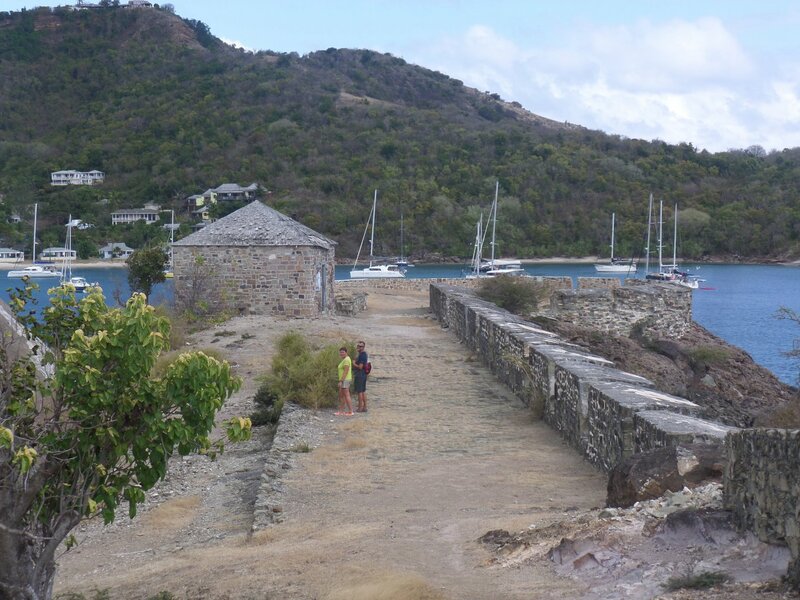 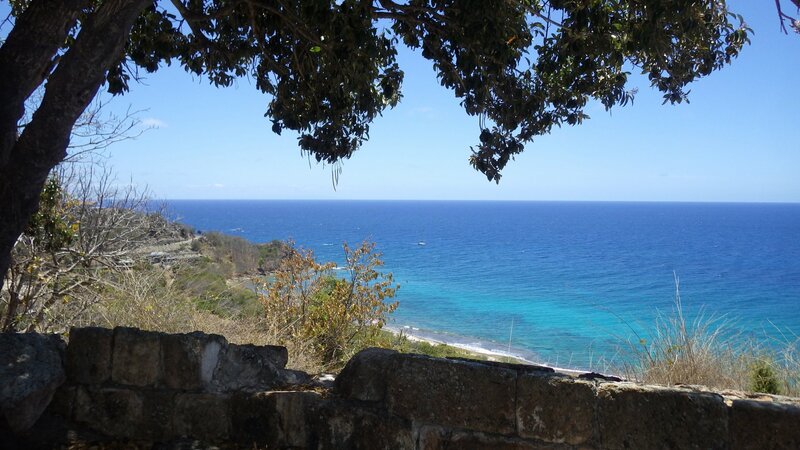 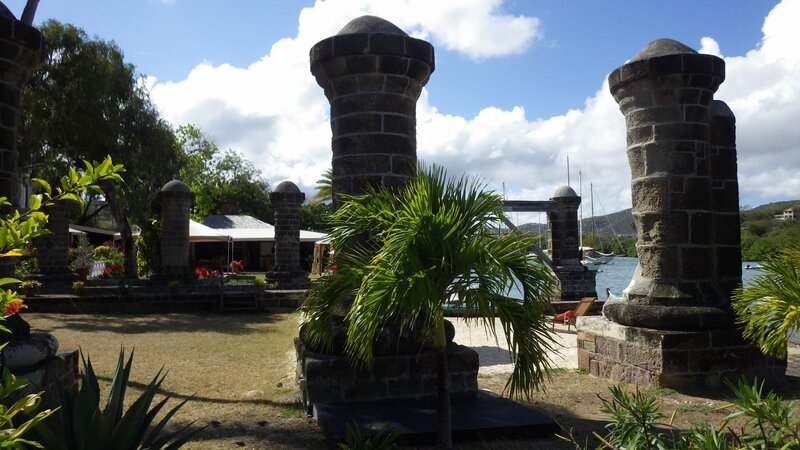 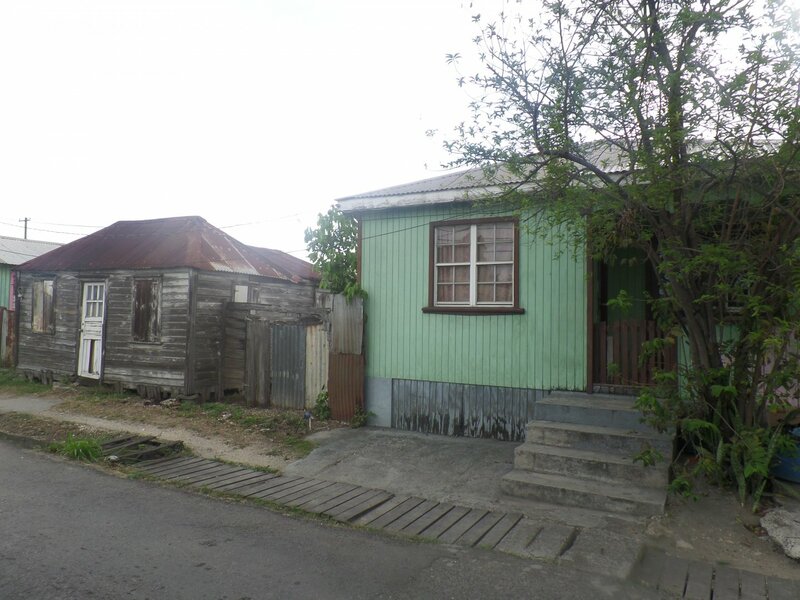 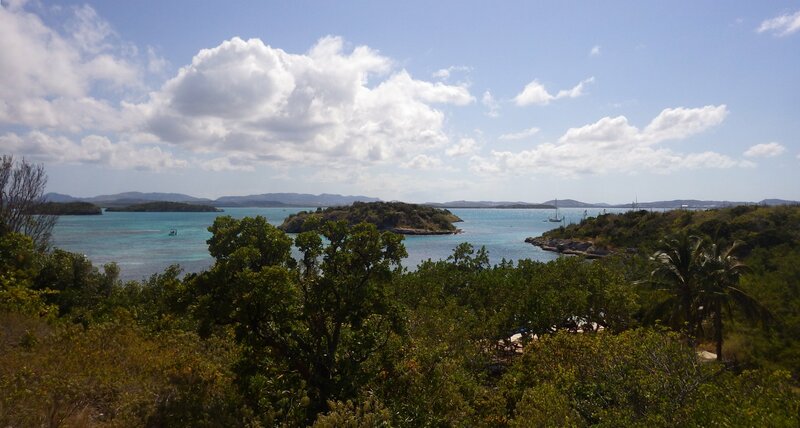 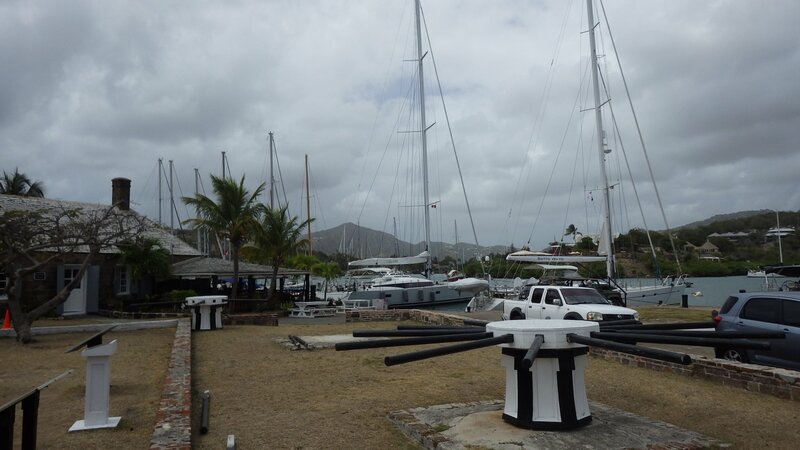 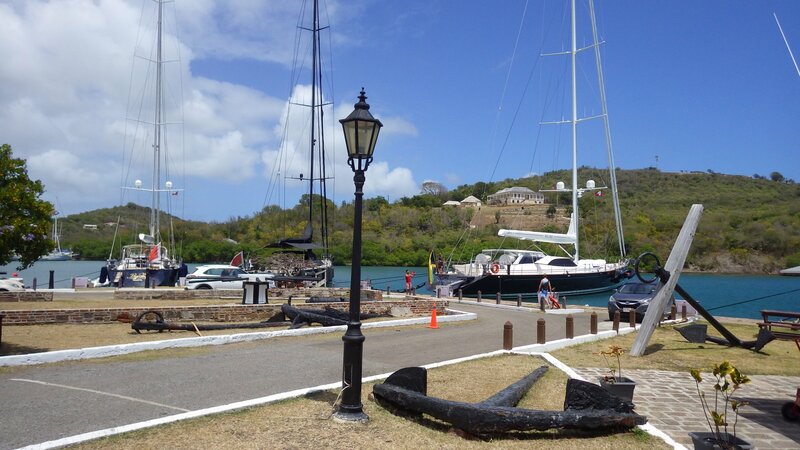 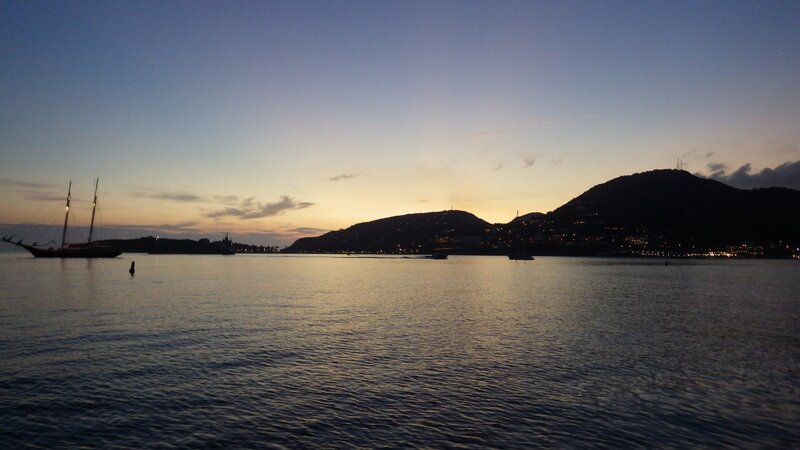 There are many historical places, like Neilson Dockyard and several forts protecting harbours. 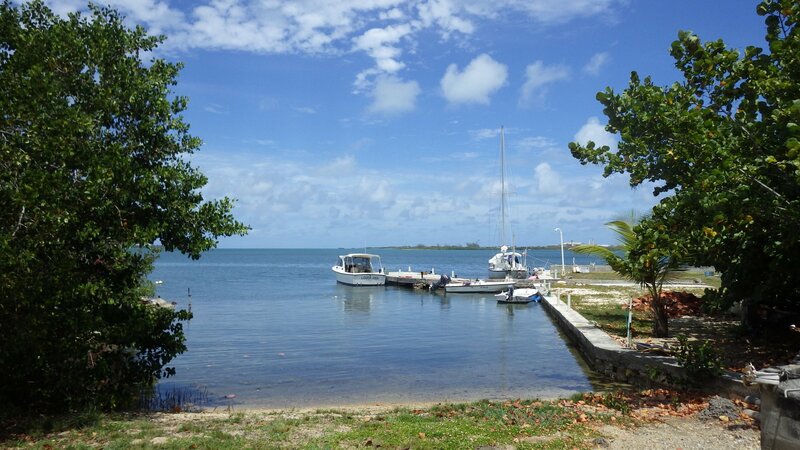 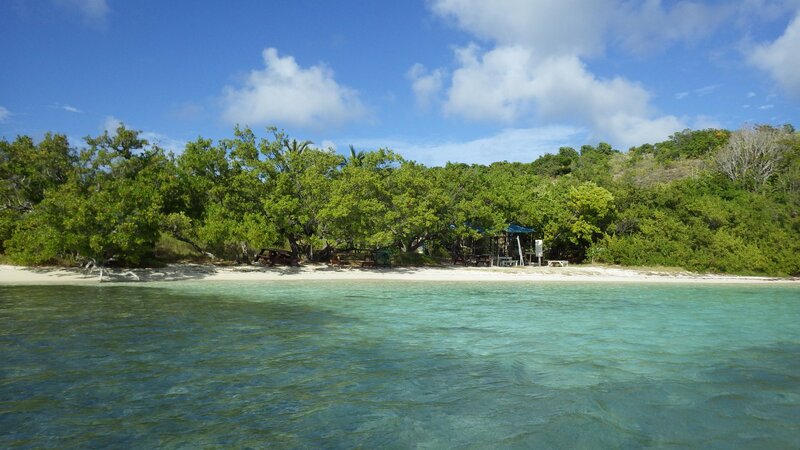 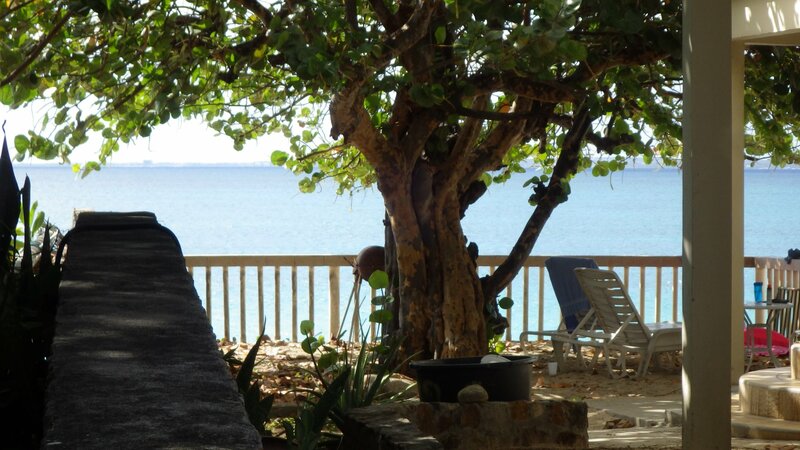 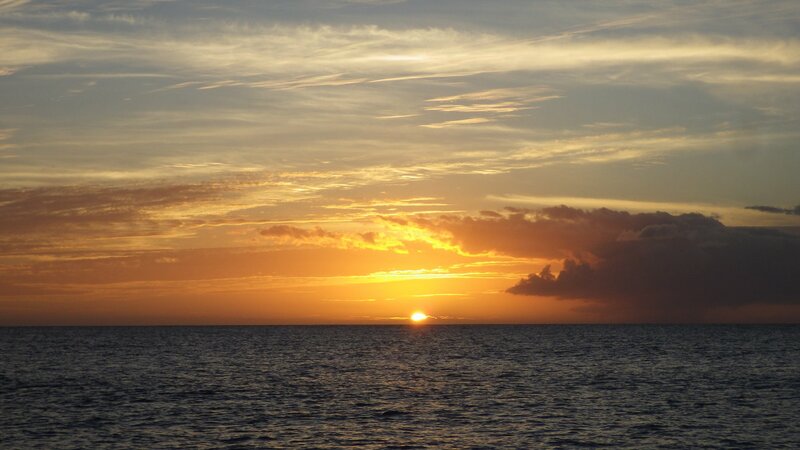 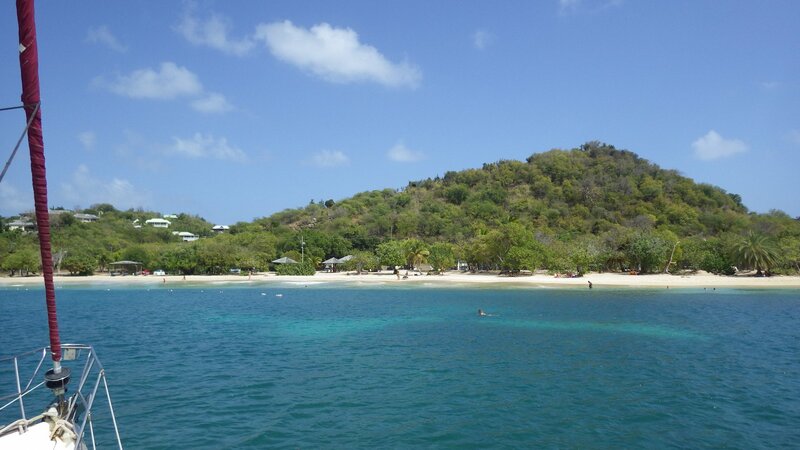 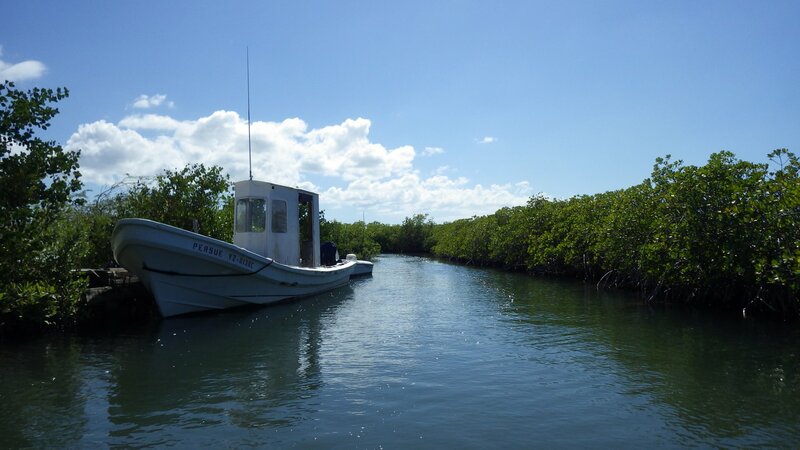 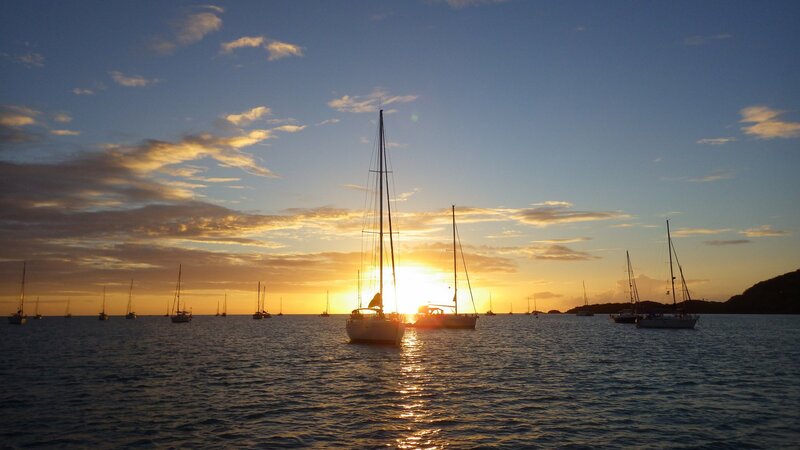 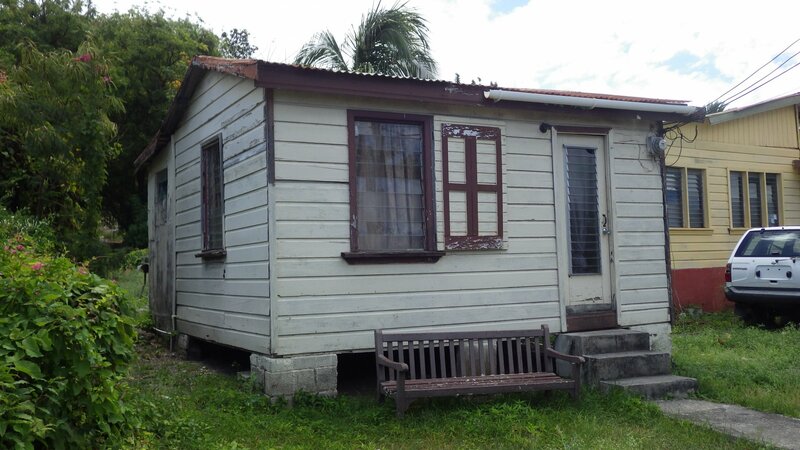 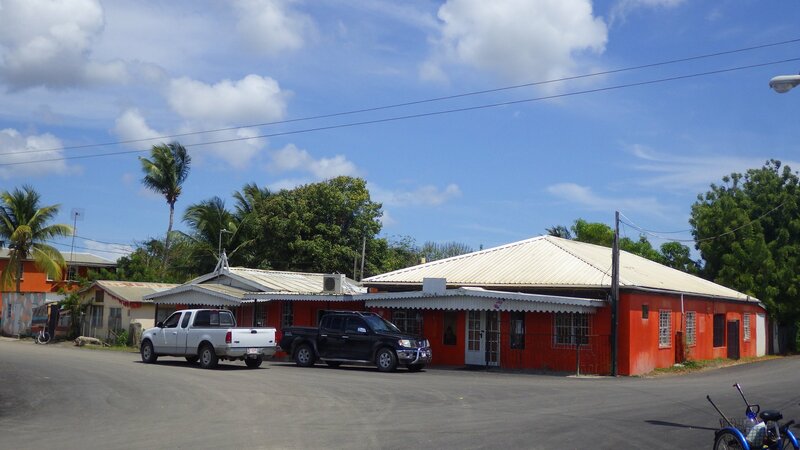 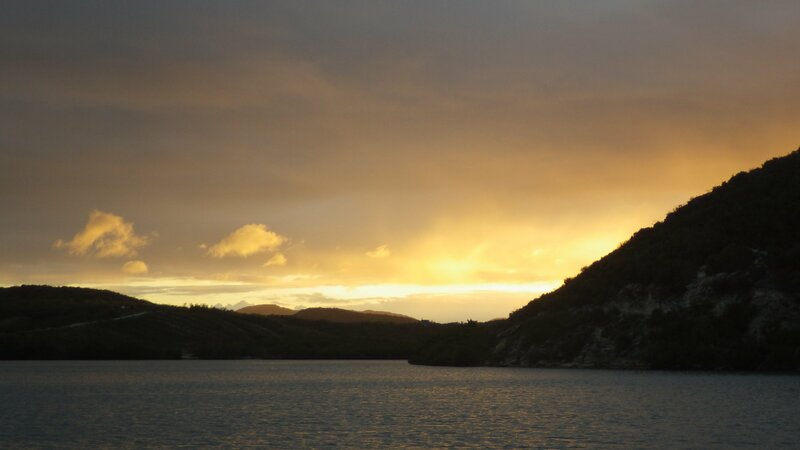 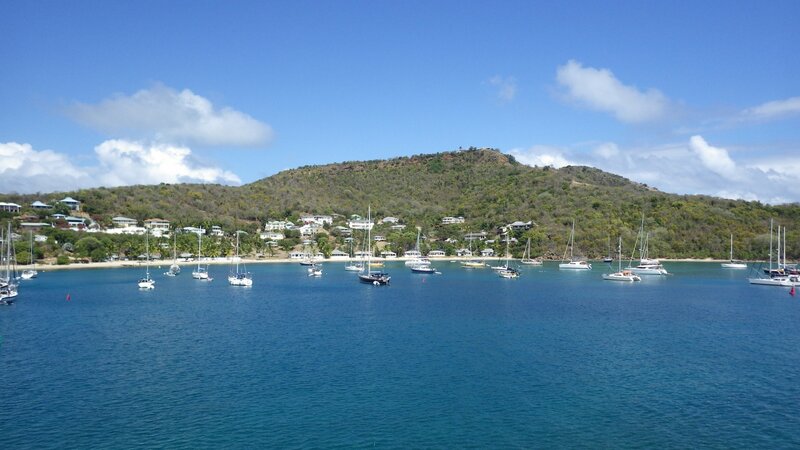 Anchorage range from busy local towns and touristy places, to quiet and secluded beaches and small islands. 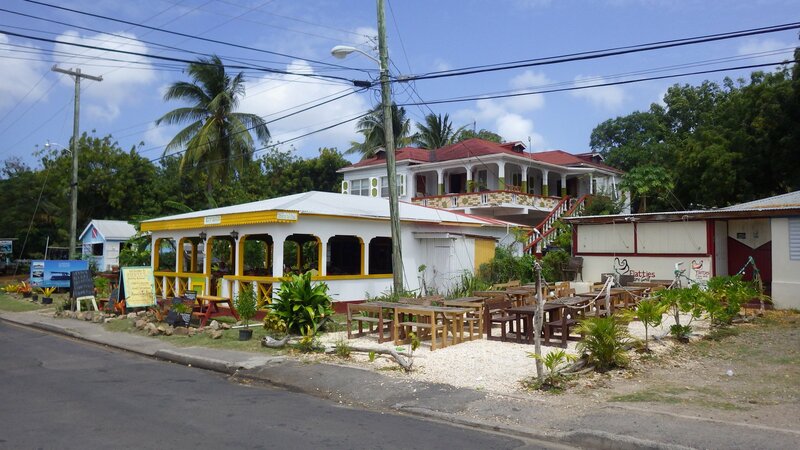 Riding local commute buses around the island is cheap and fun. 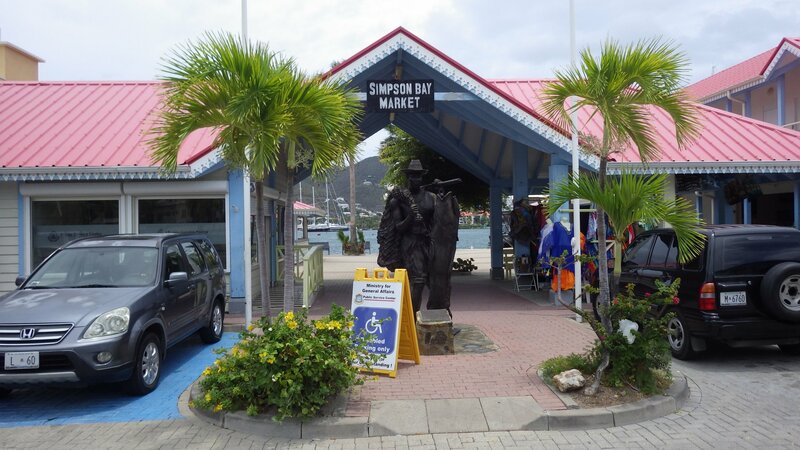 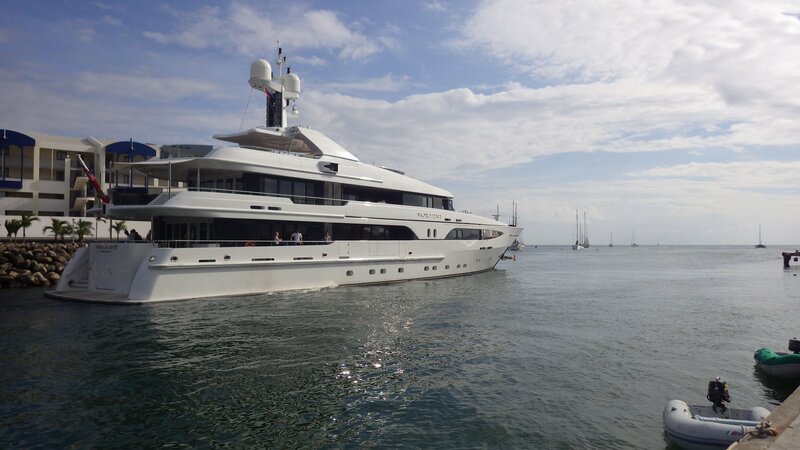 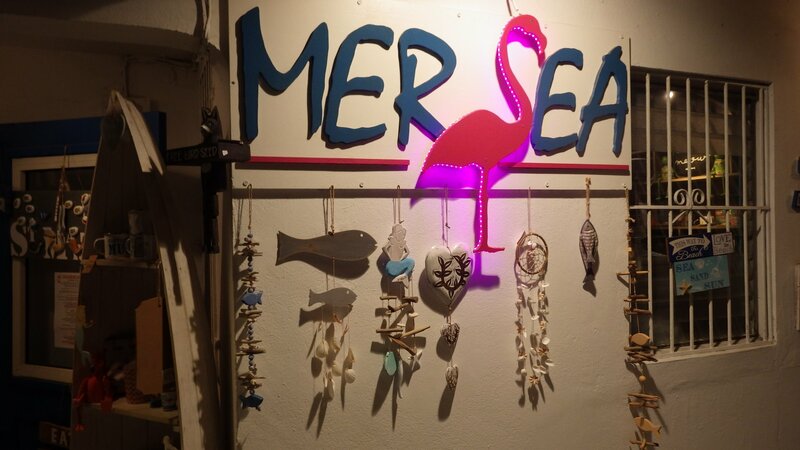 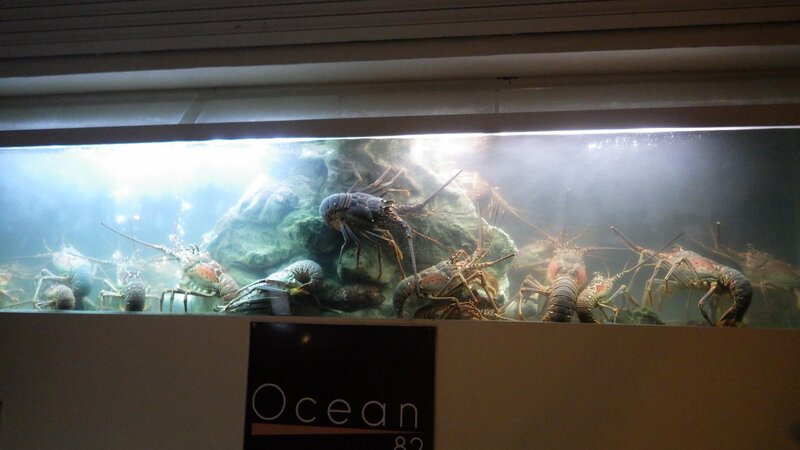 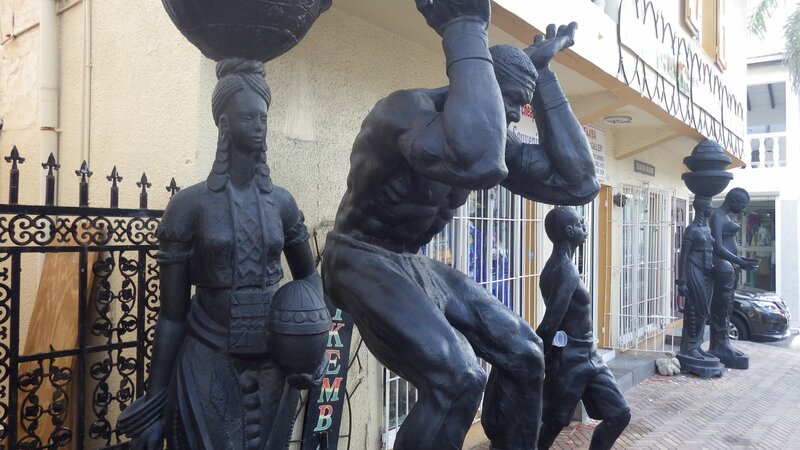 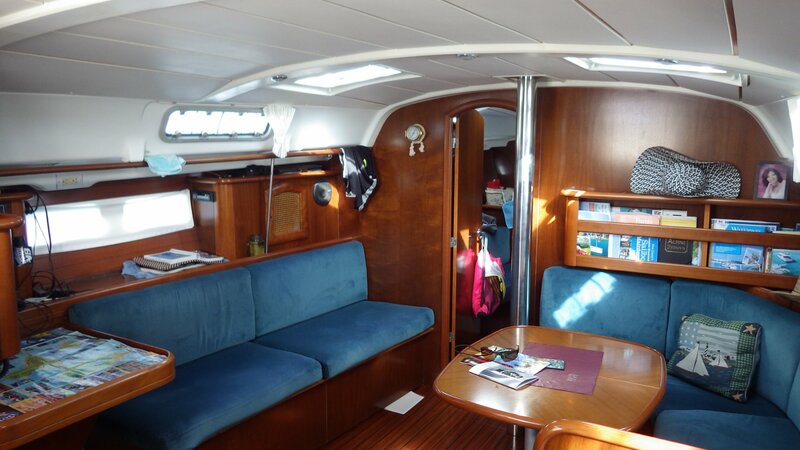 Marine services and shopping is good. 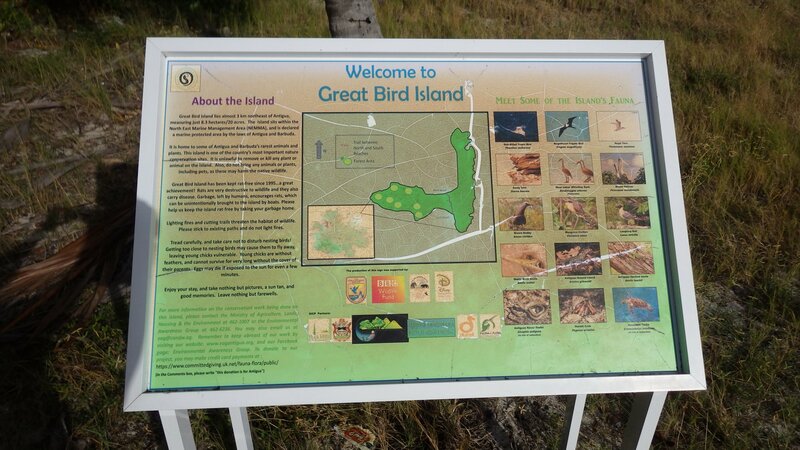 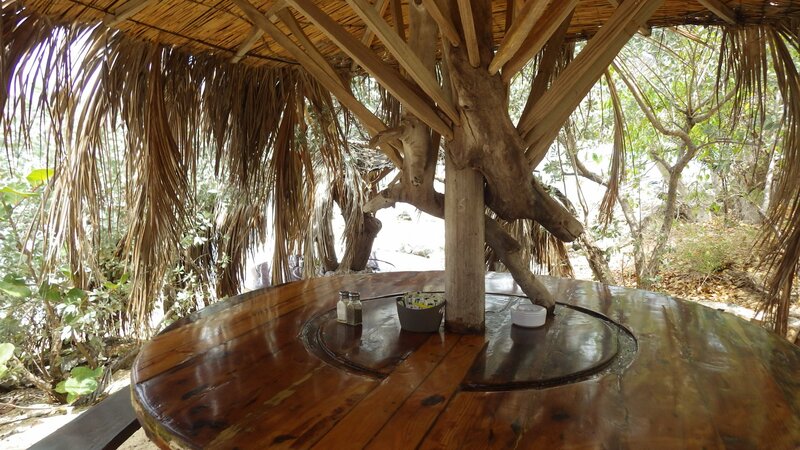 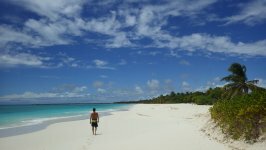 There are also some fairly secluded places, nature reserves, mainly in the North and East. 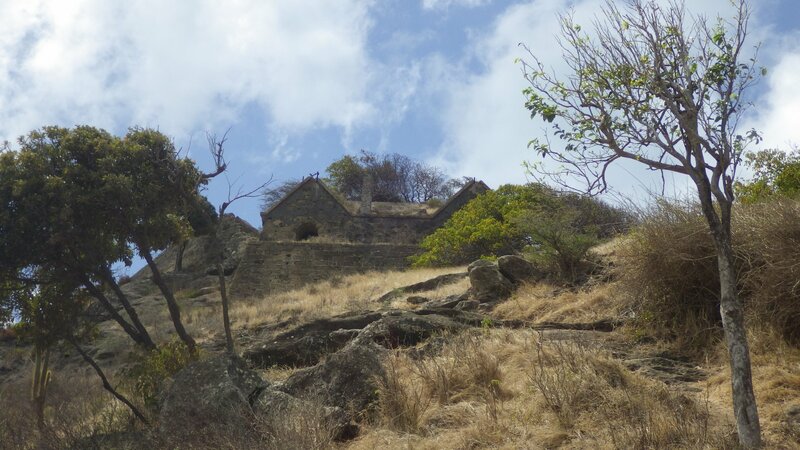 We couldn't visit one of them, Devil's Gate - there was a movie crew filming scenes there - it occupied the entire place and did not allow us go and explore it. 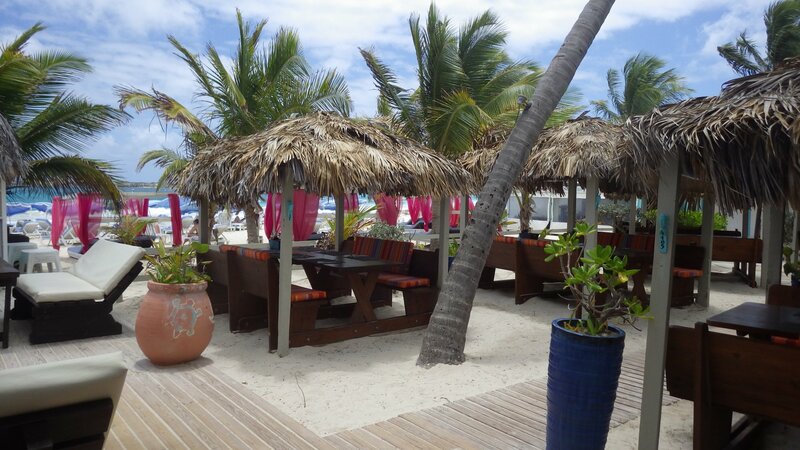 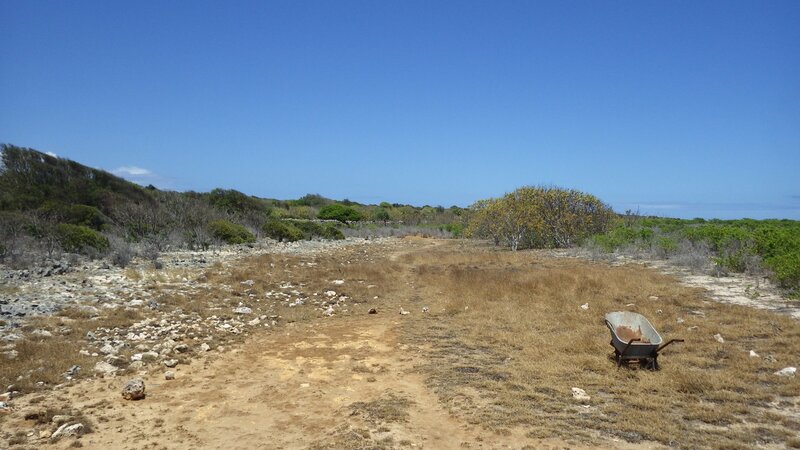 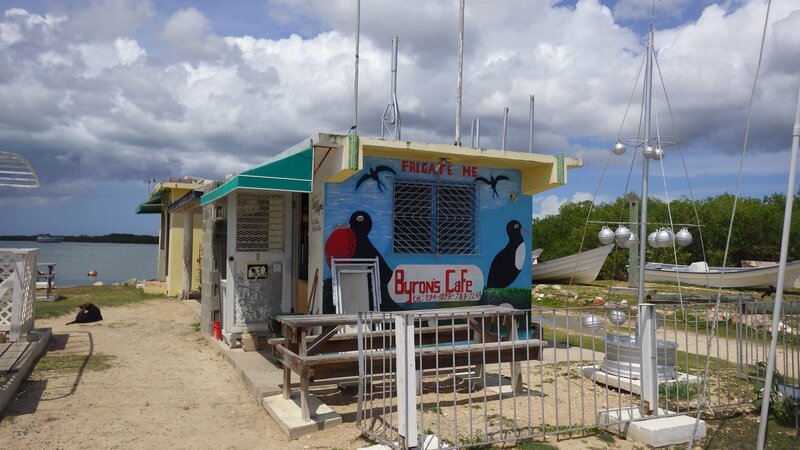 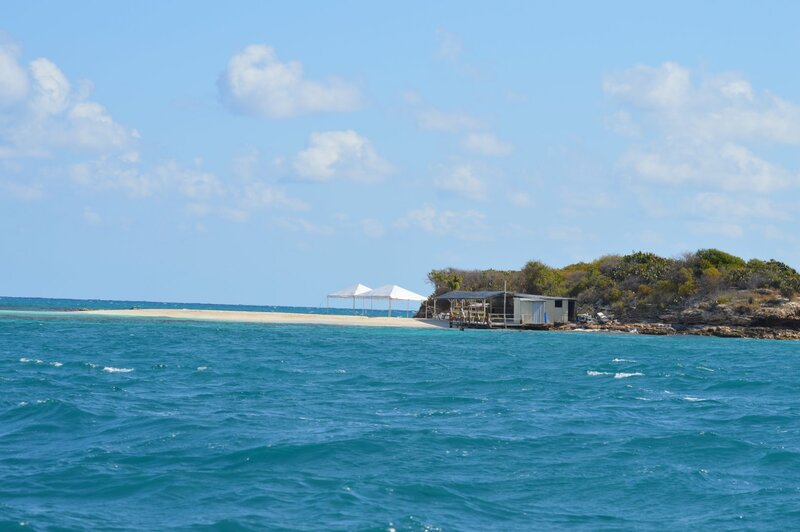 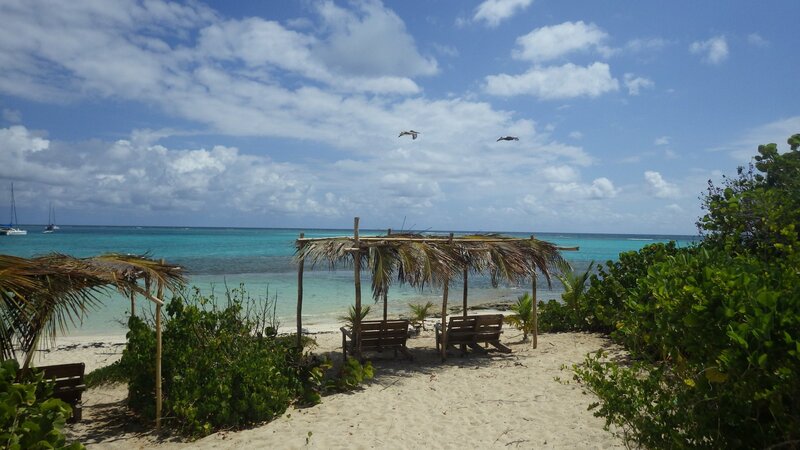 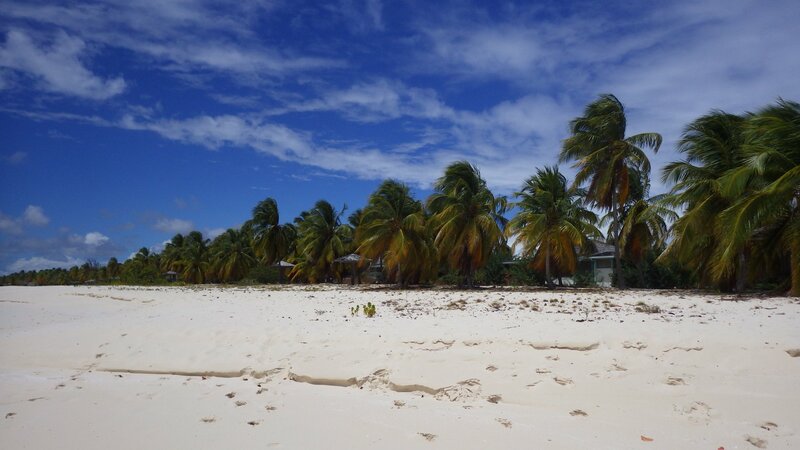 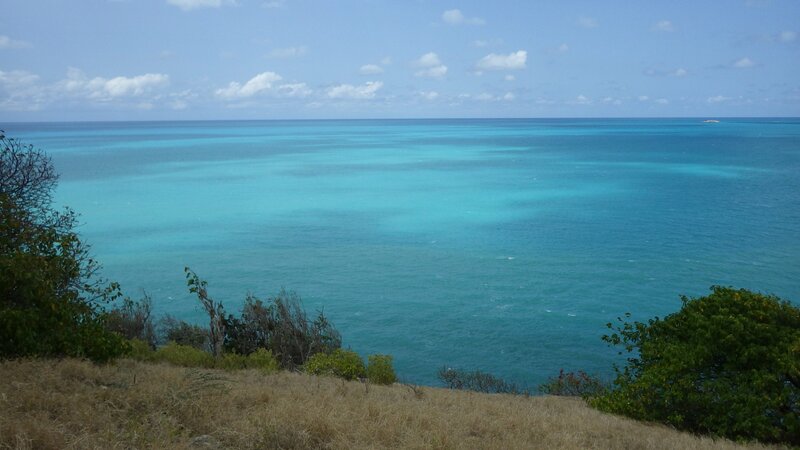 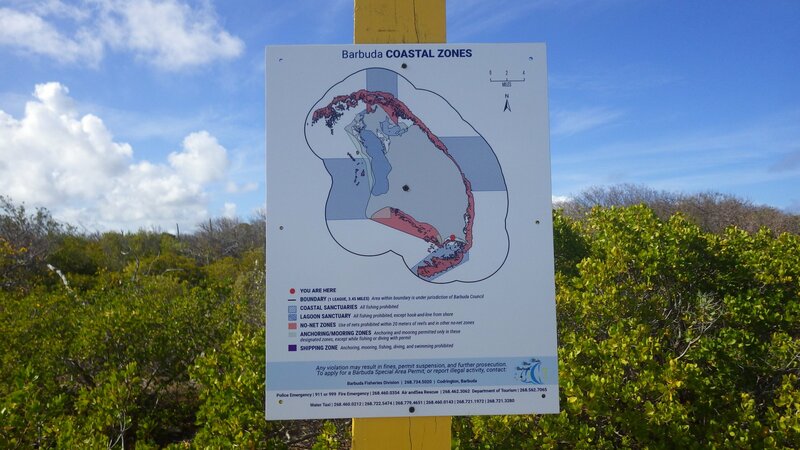 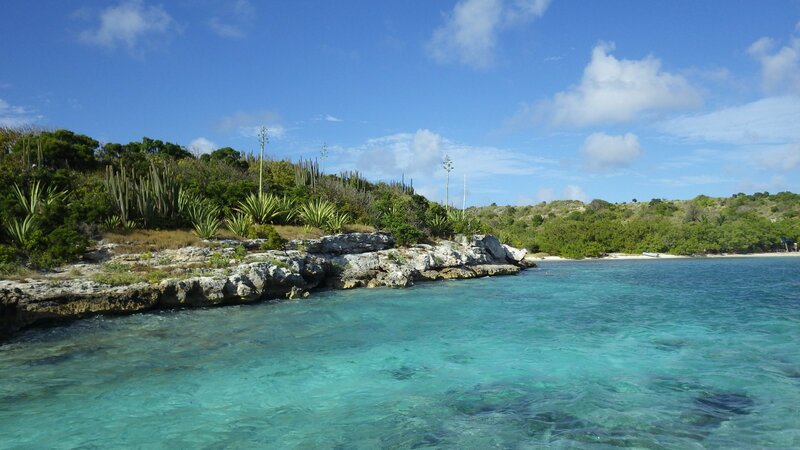 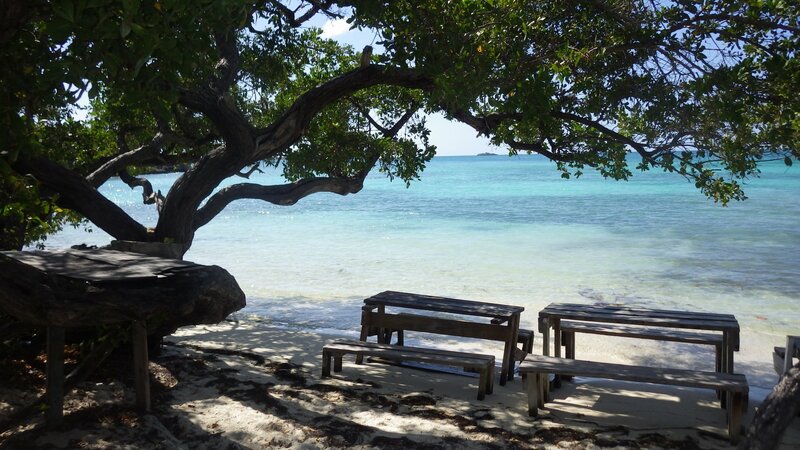 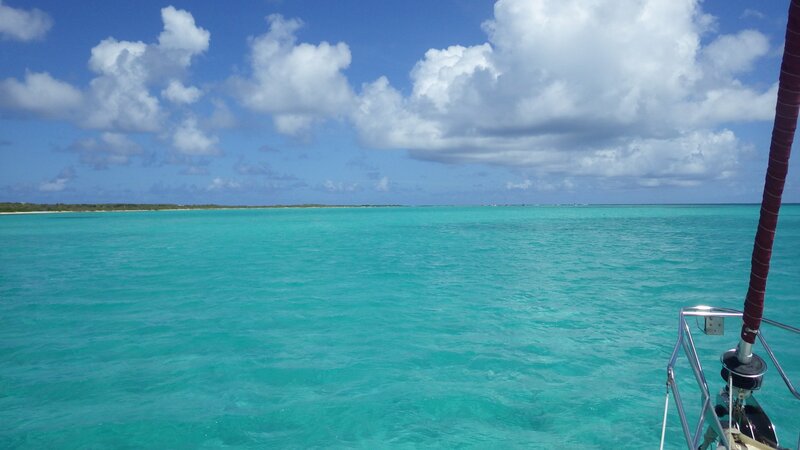 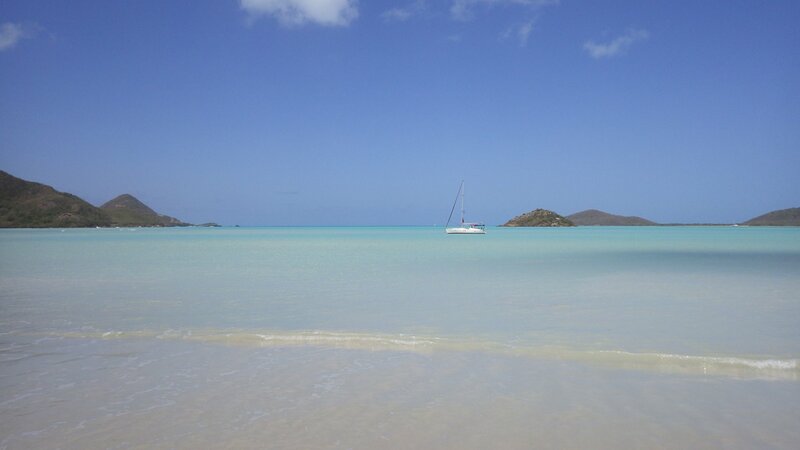 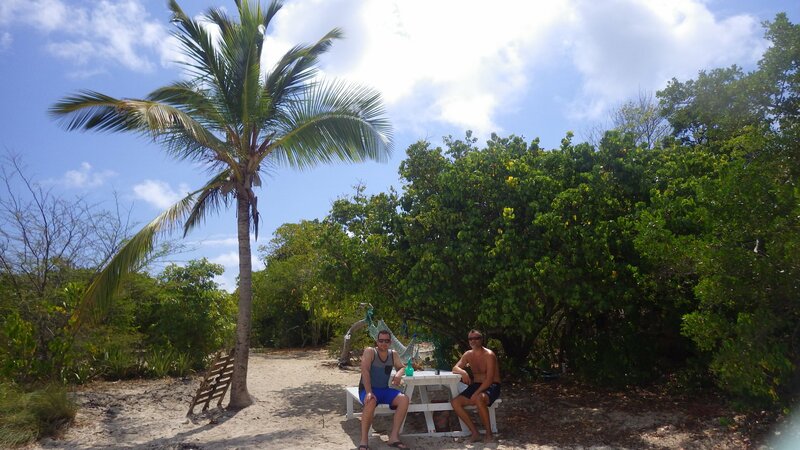 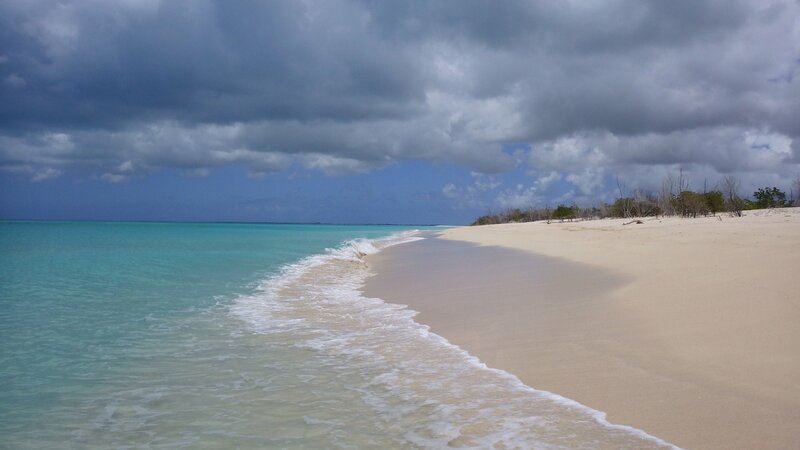 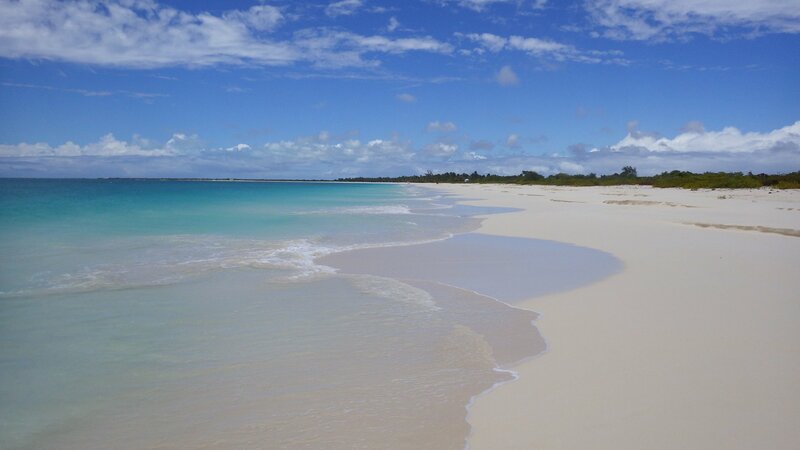 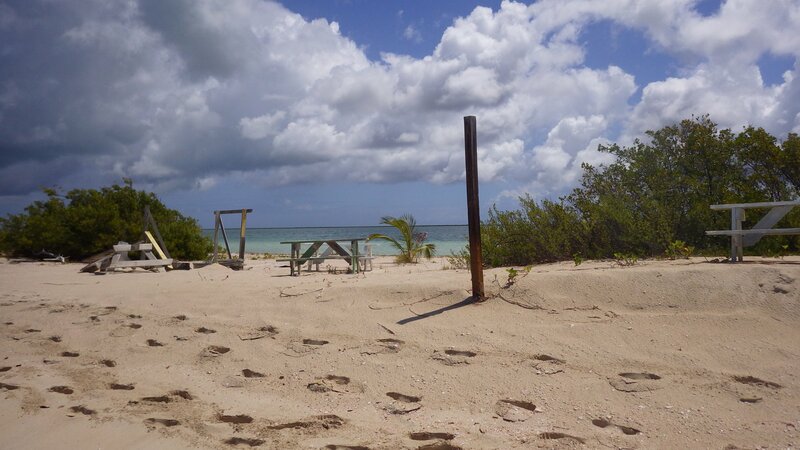 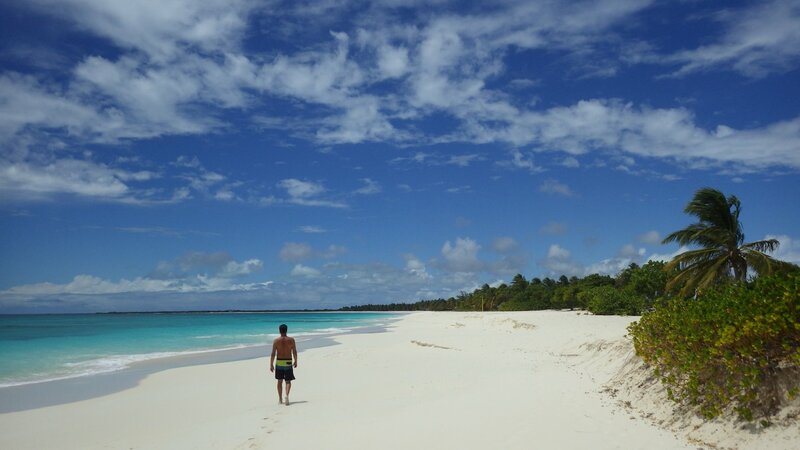 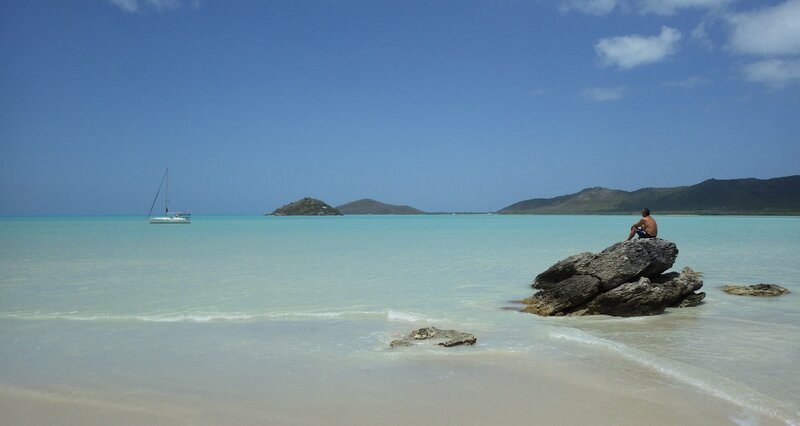 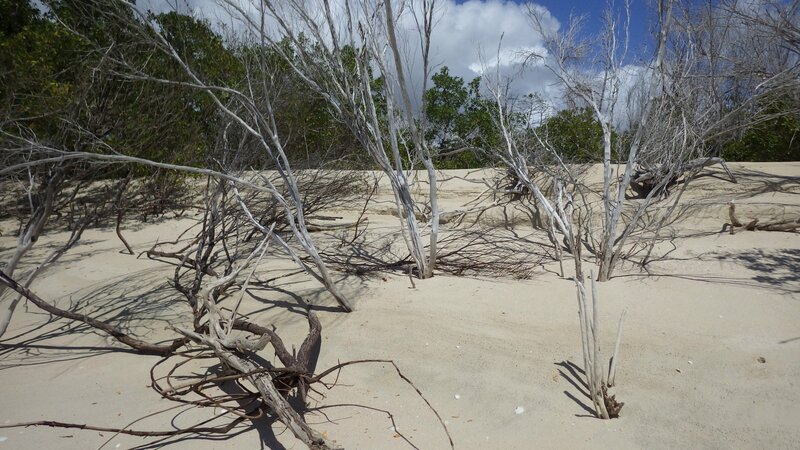 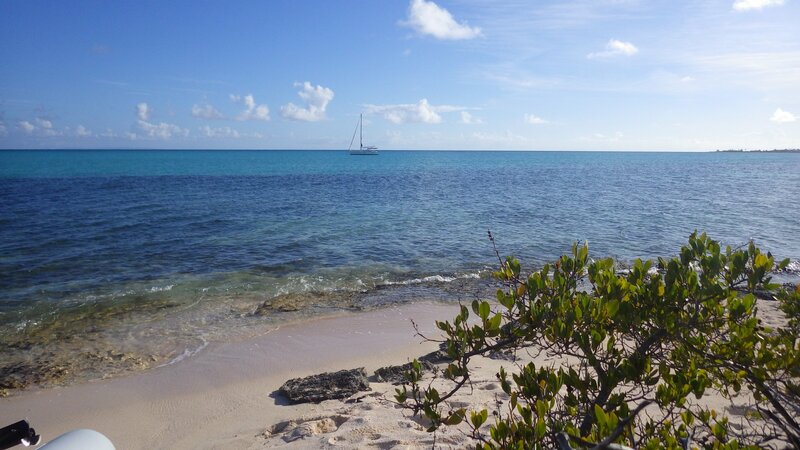 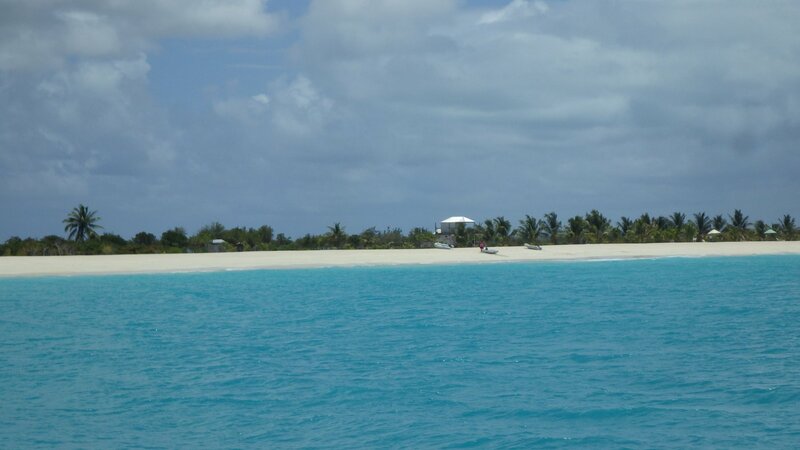 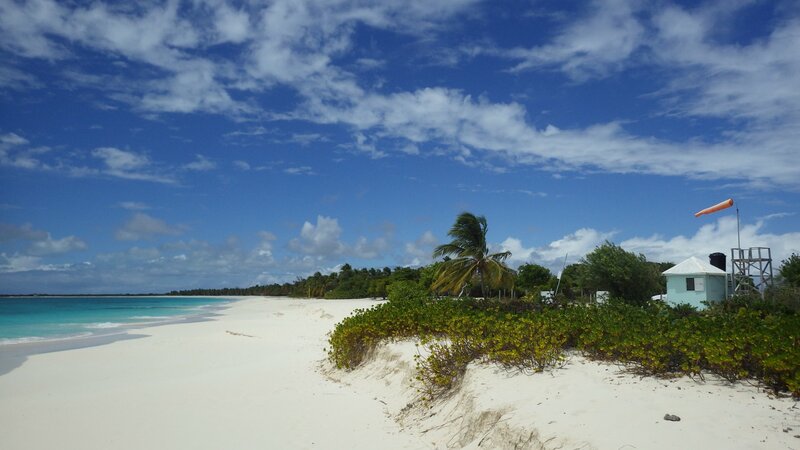 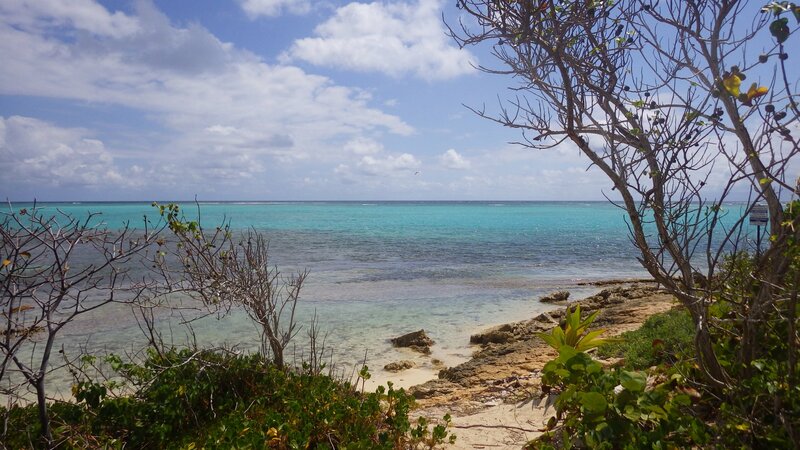 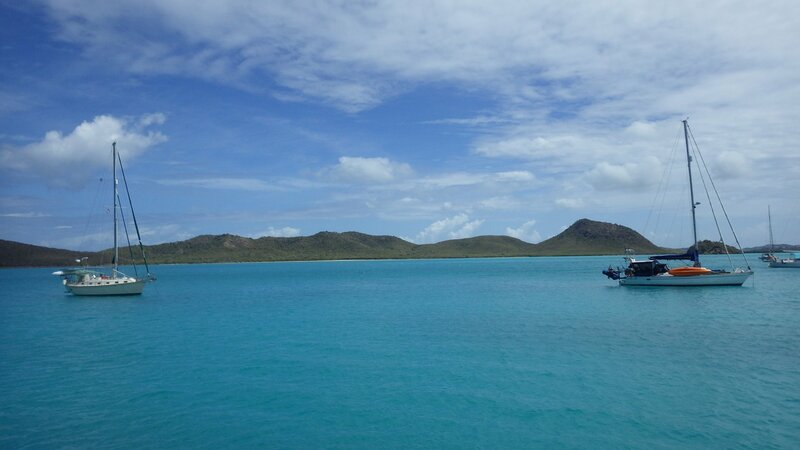 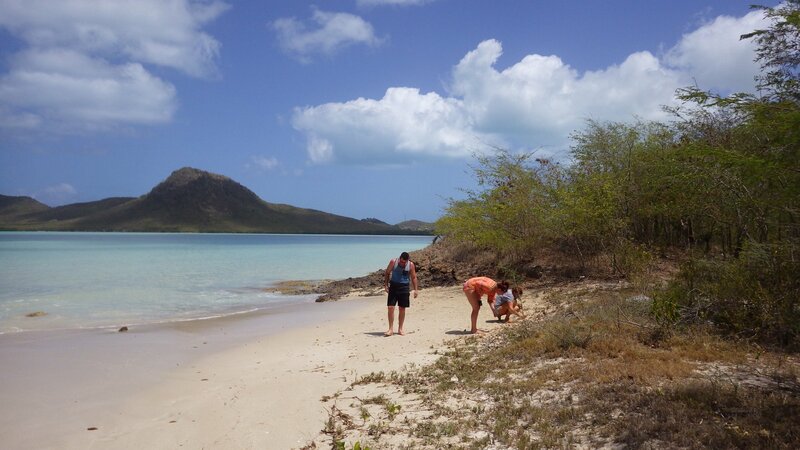 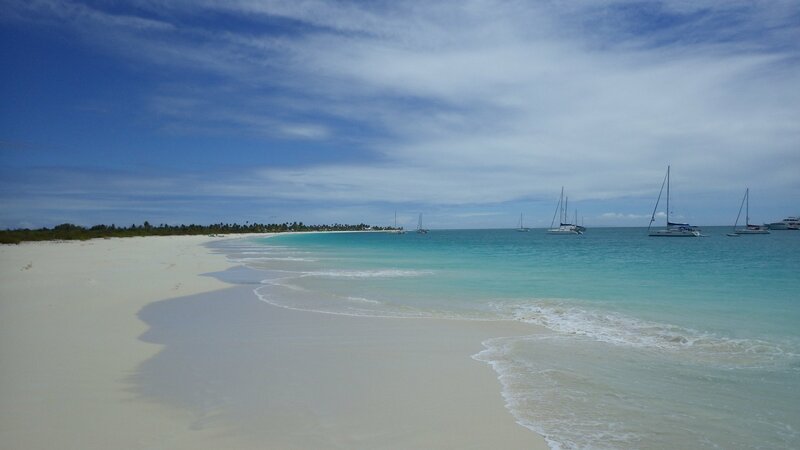 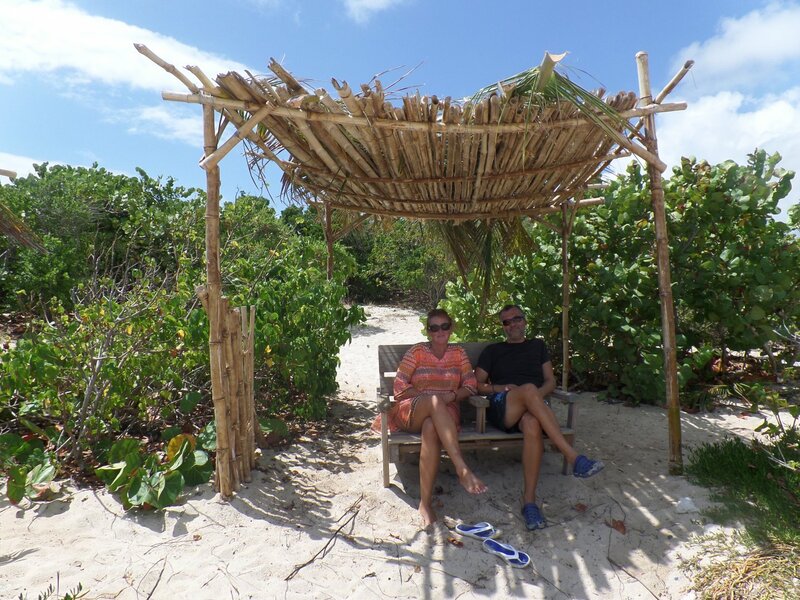 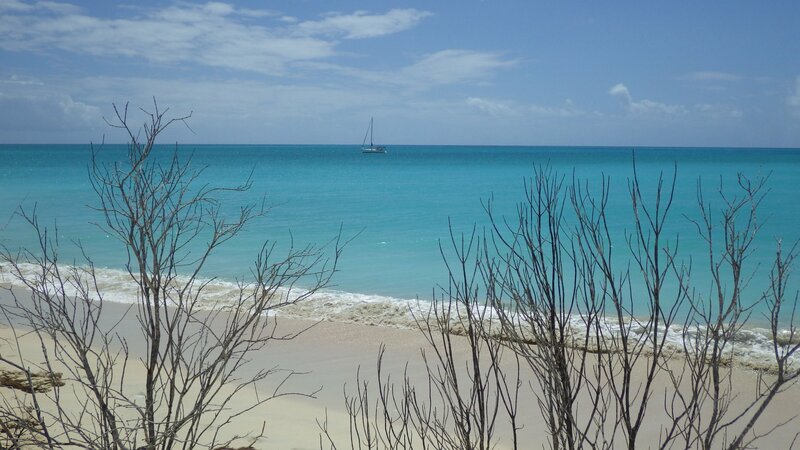 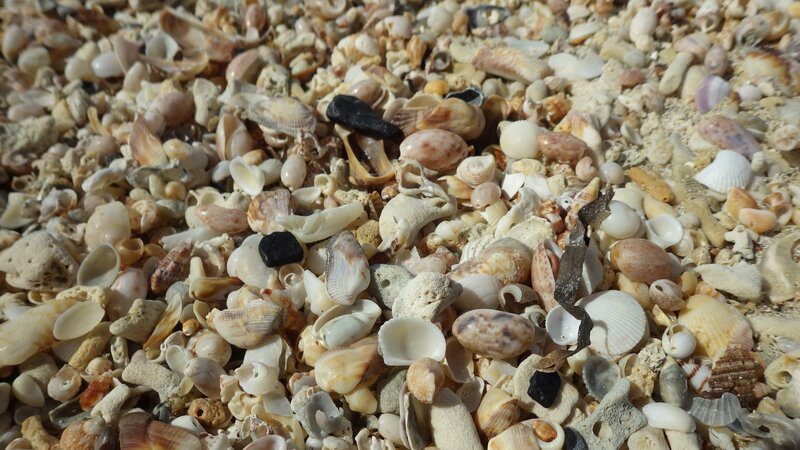 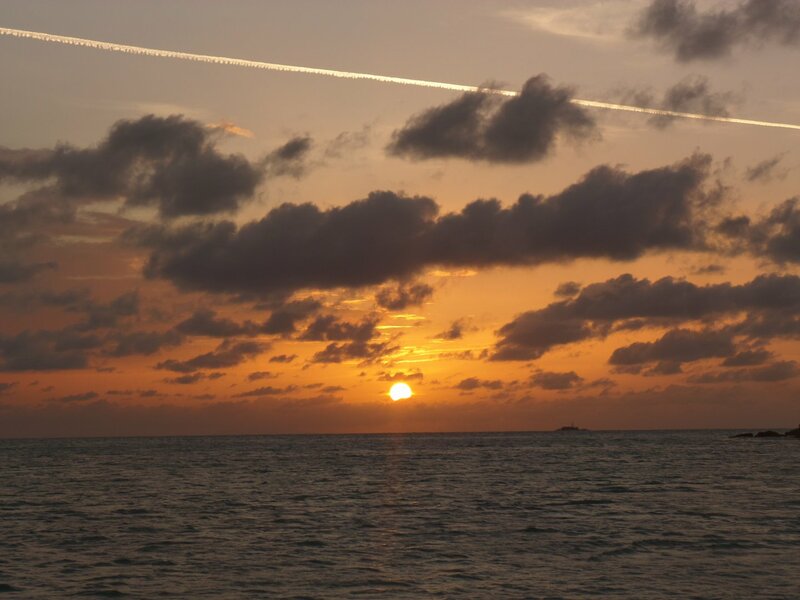 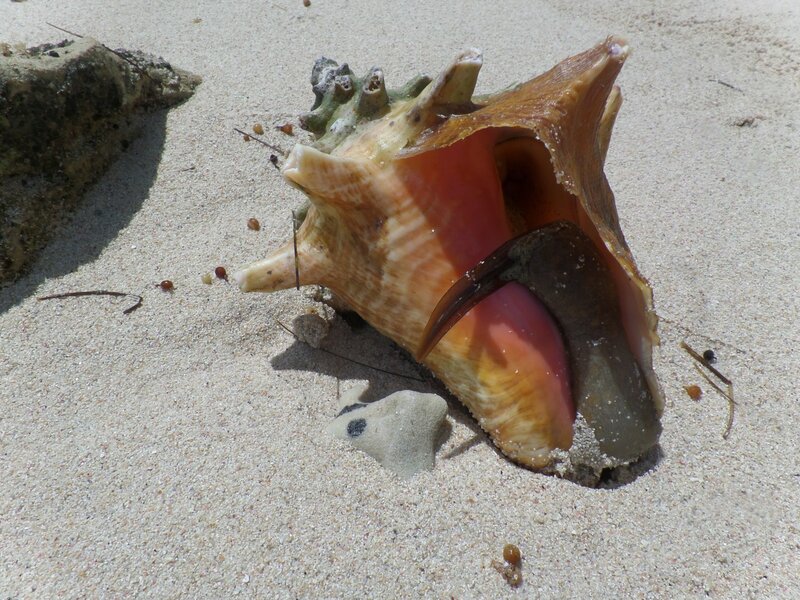 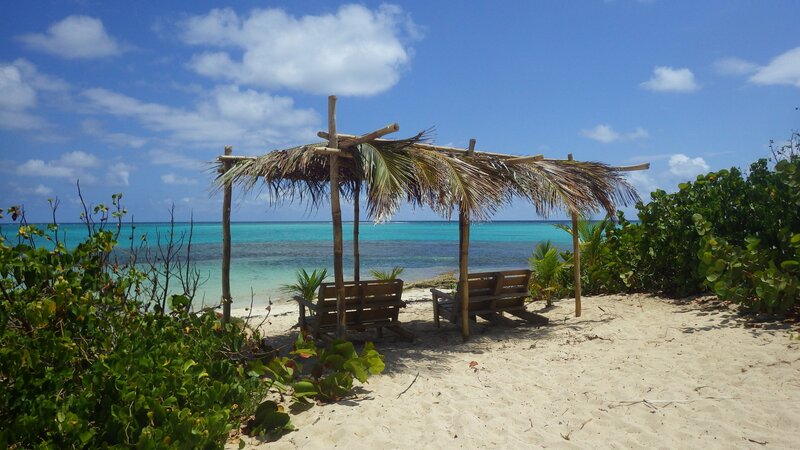 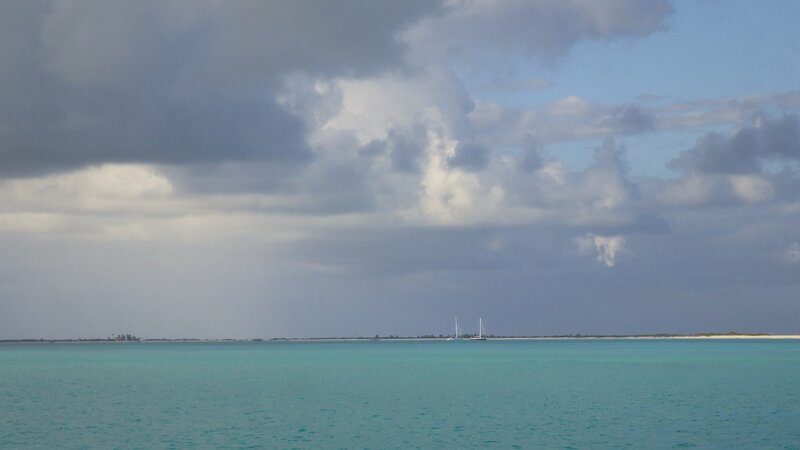 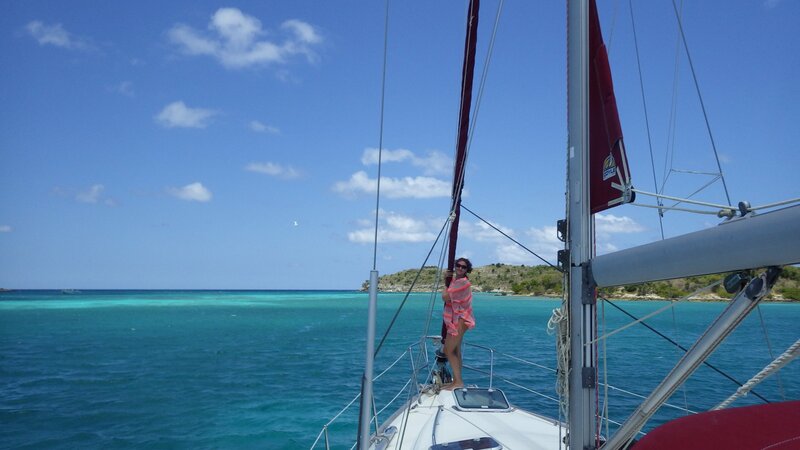 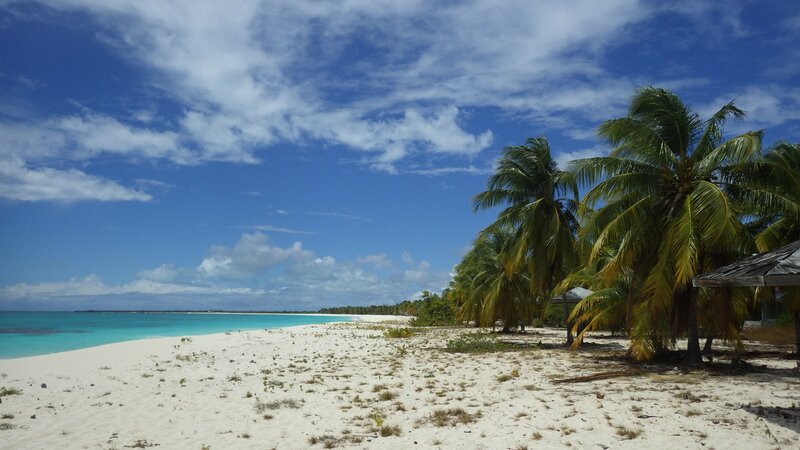 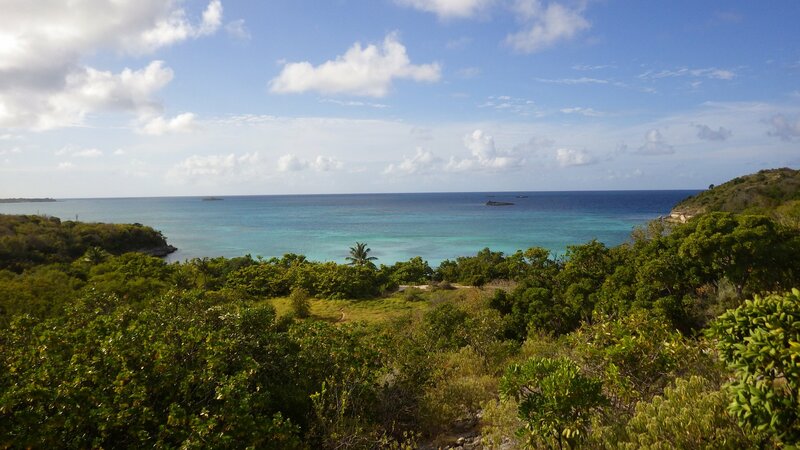 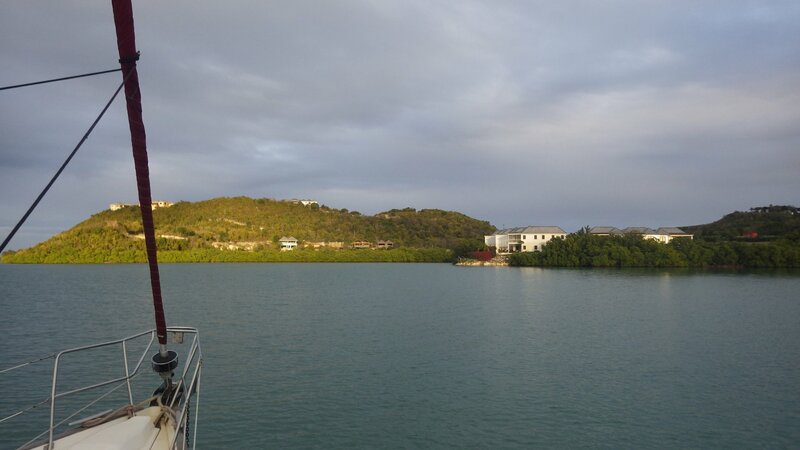 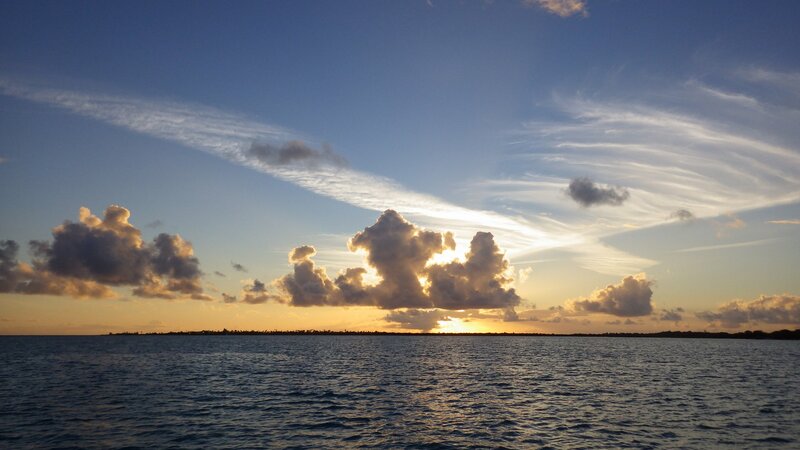 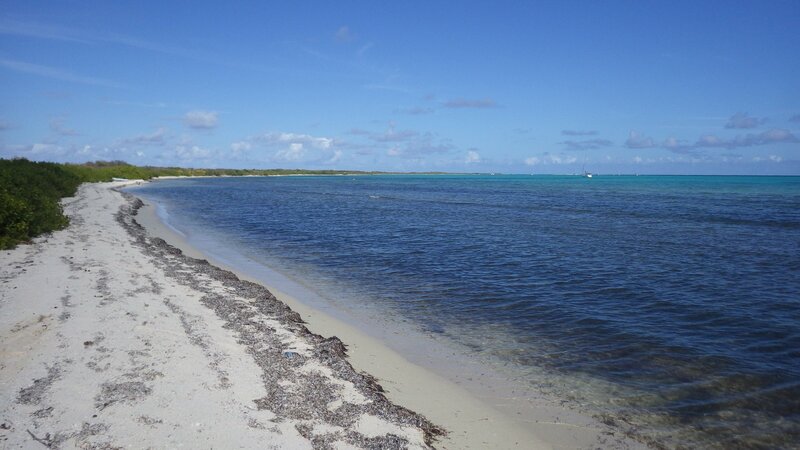 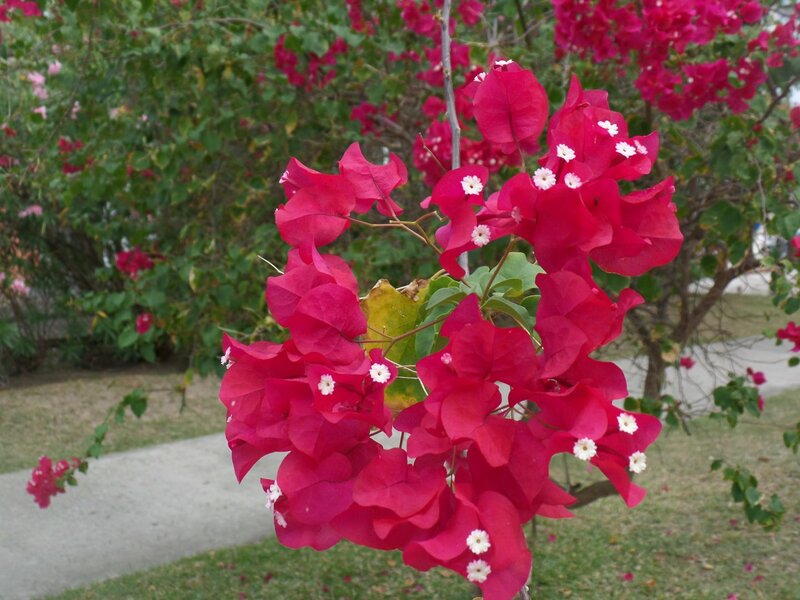 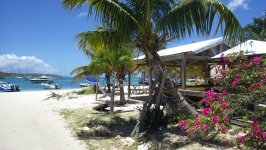 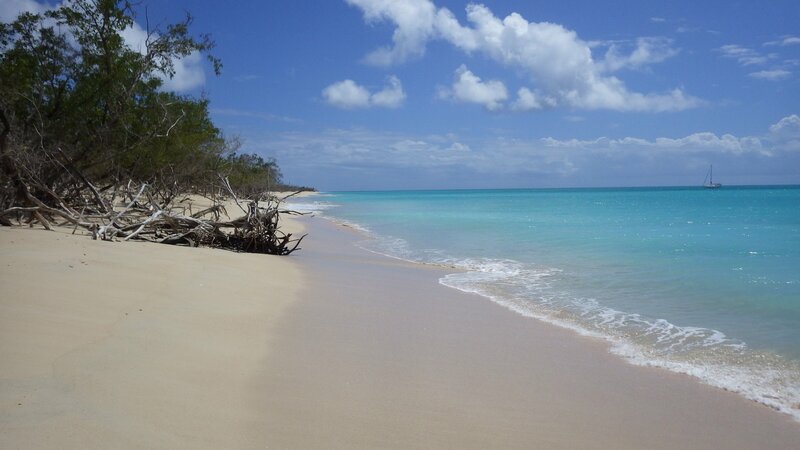 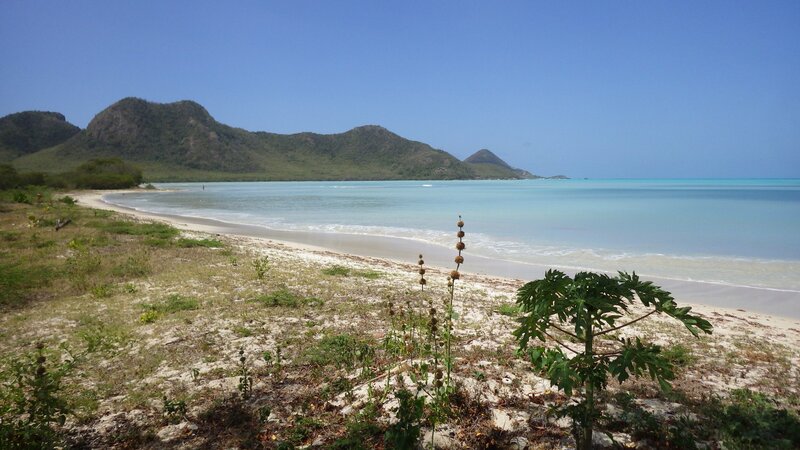 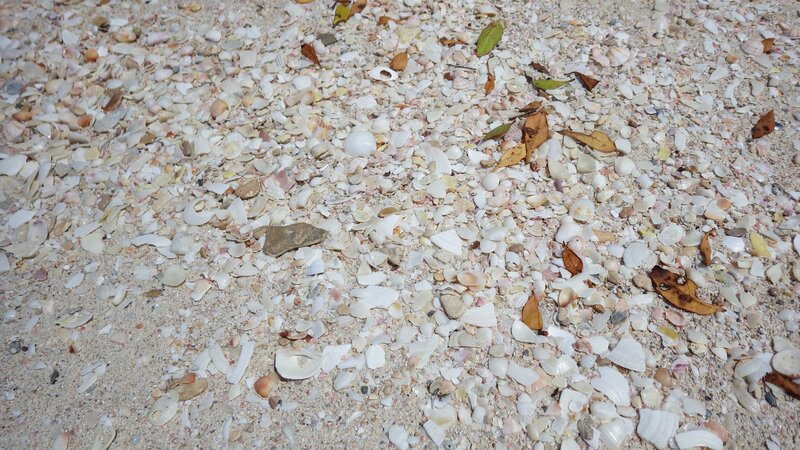 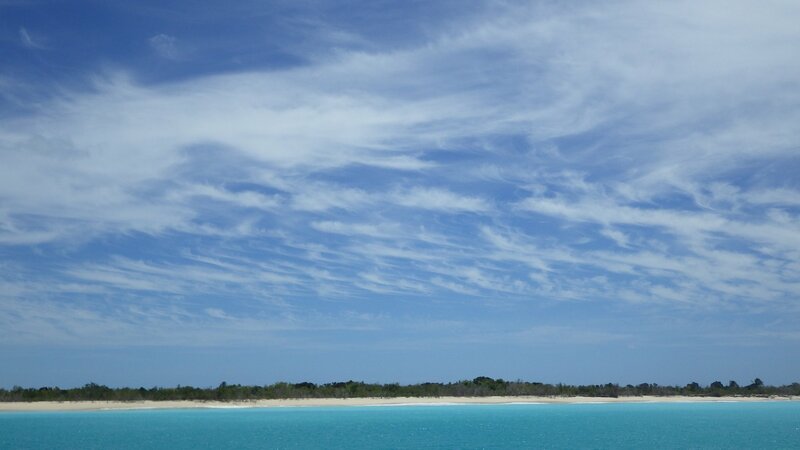 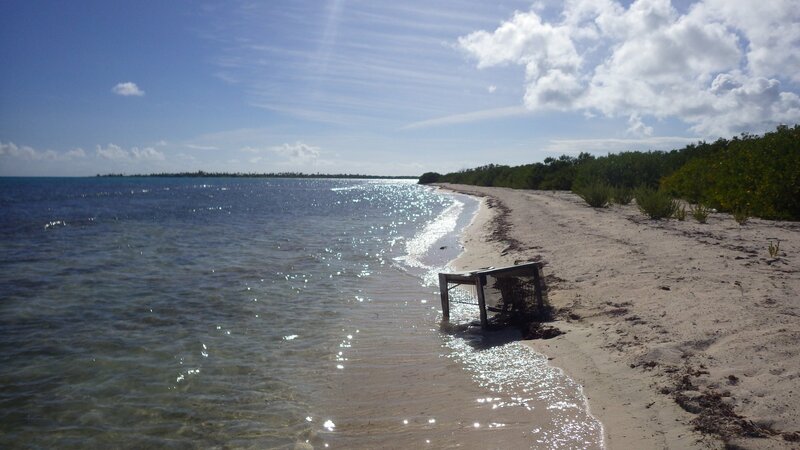 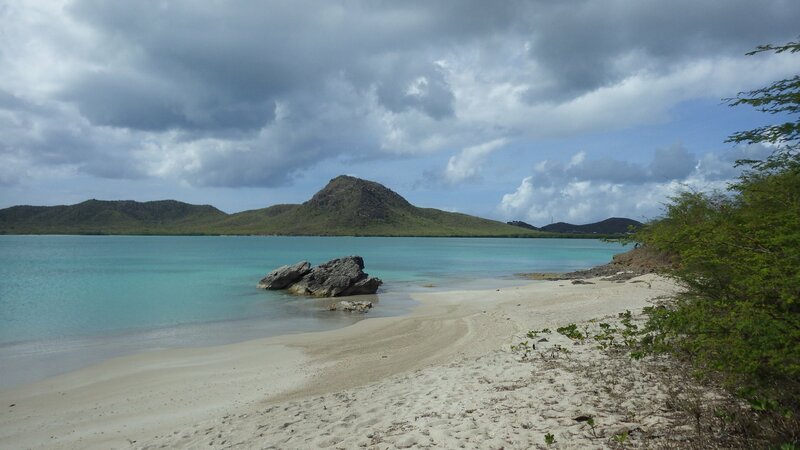 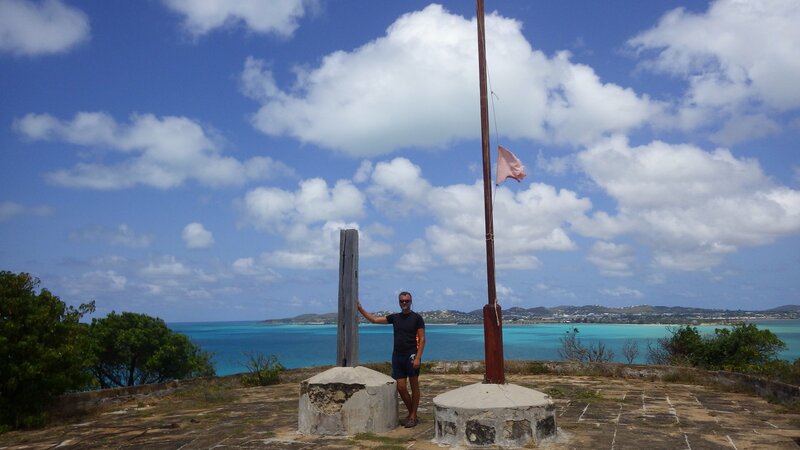 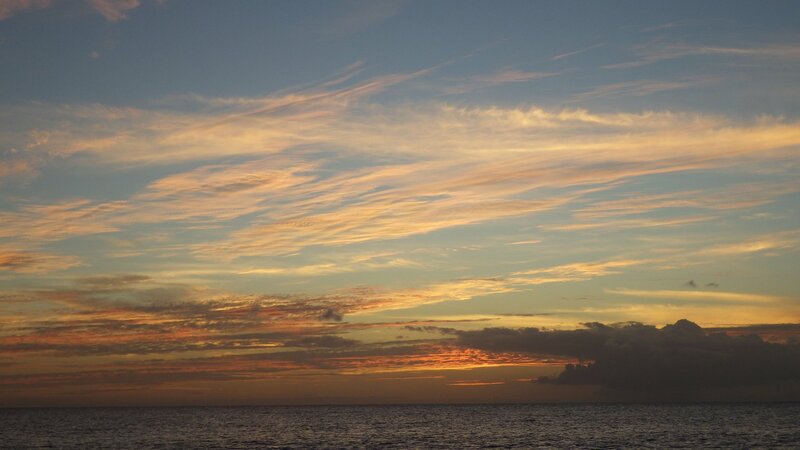 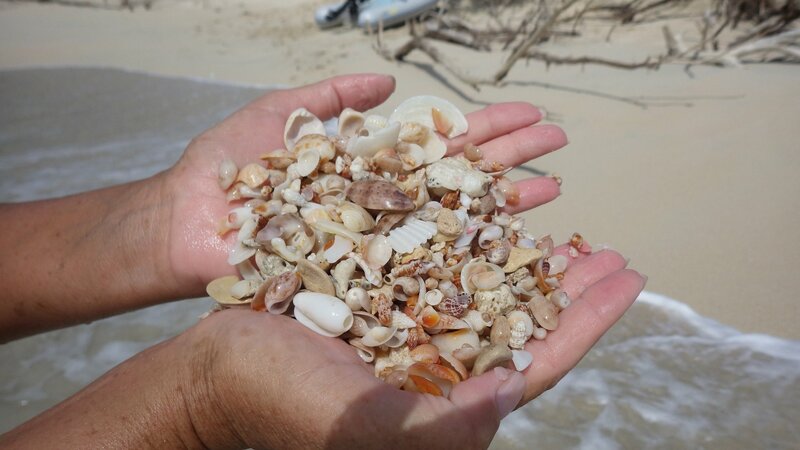 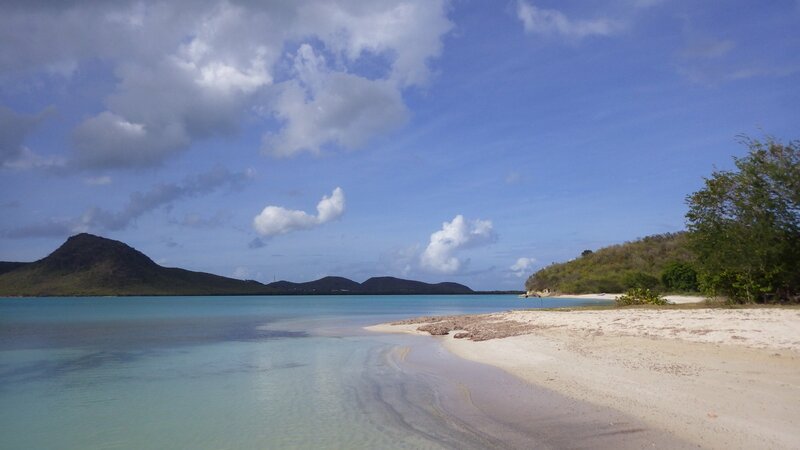 We wanted to go to Barbuda for its remoteness and pink sand beaches. 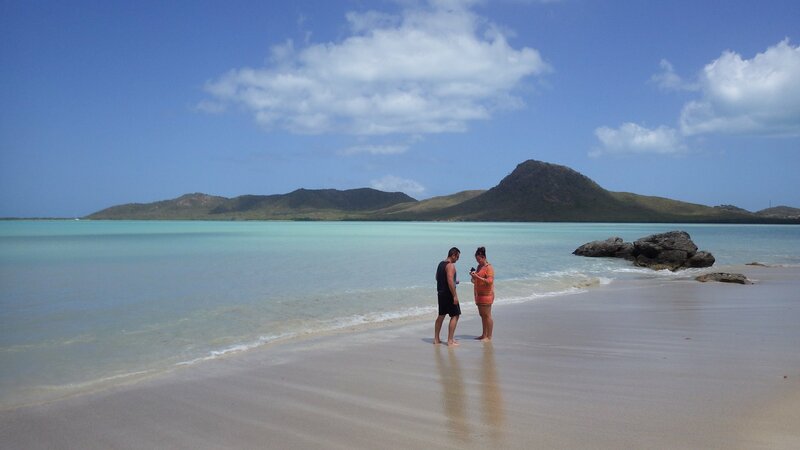 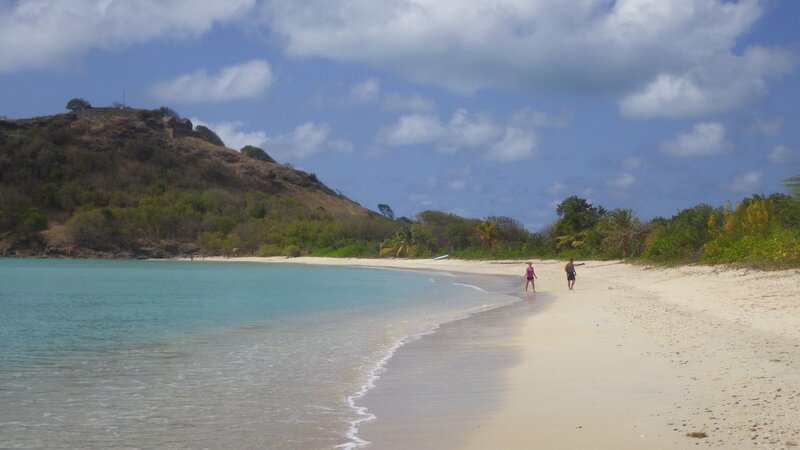 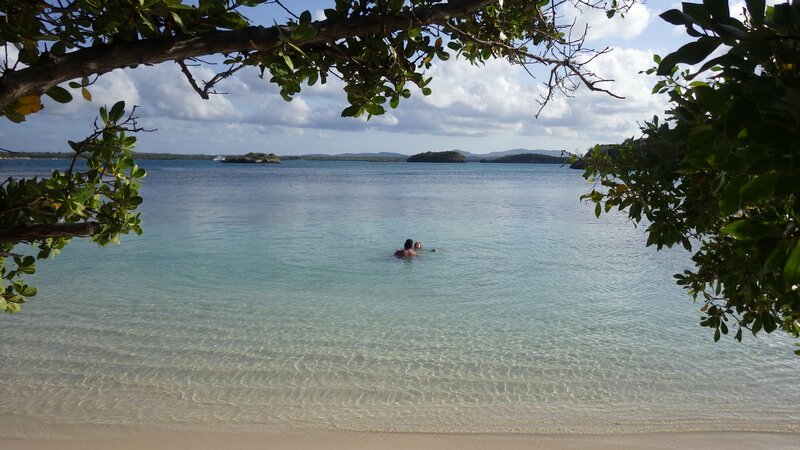 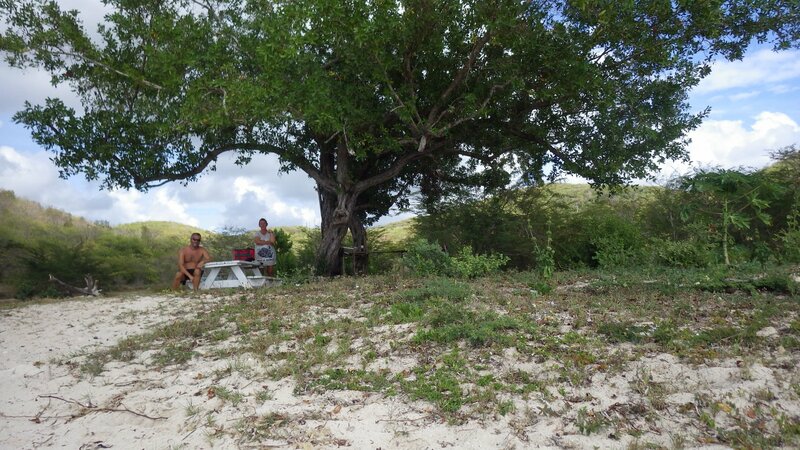 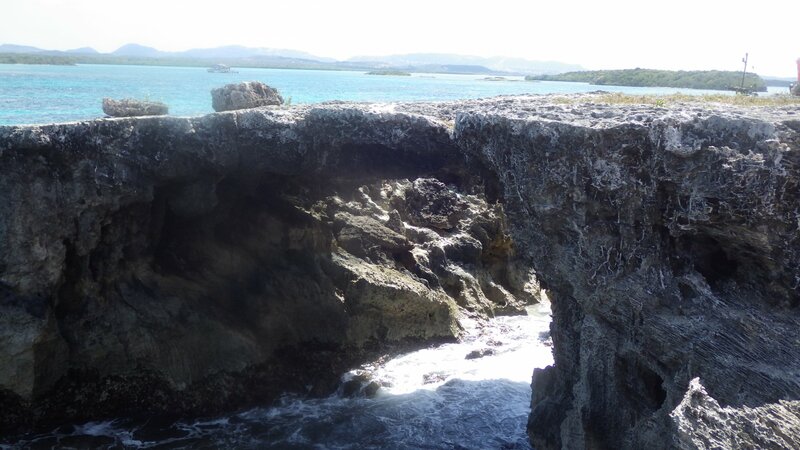 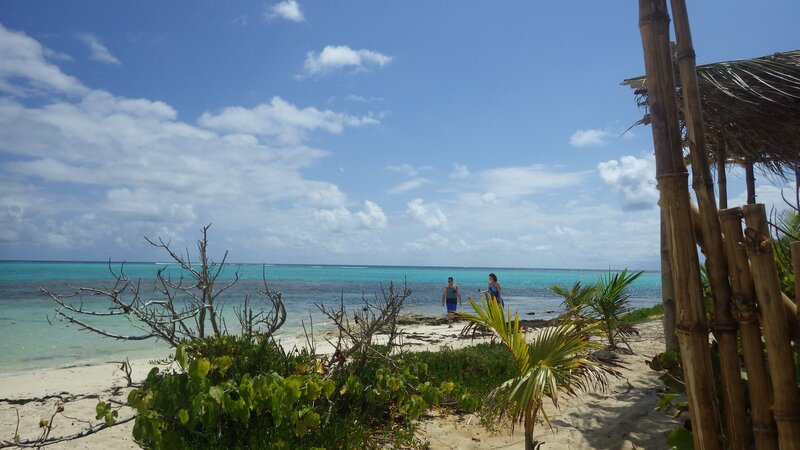 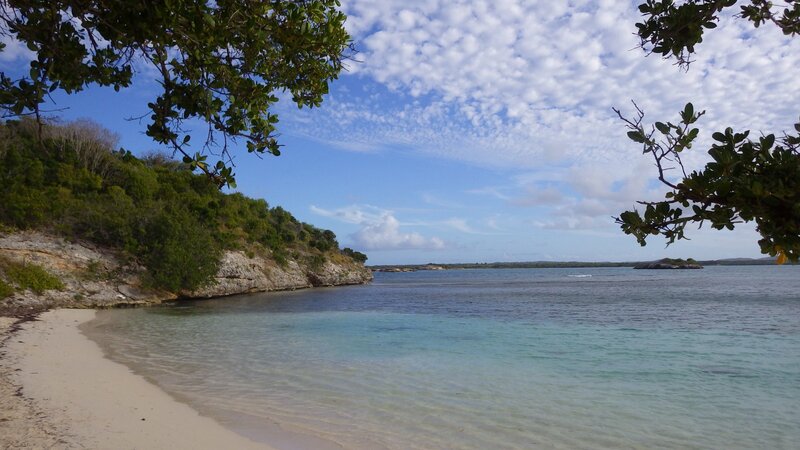 We got the remoteness and privacy; the beaches are great, some of the nicest, although they are just somewhat pink-ish. 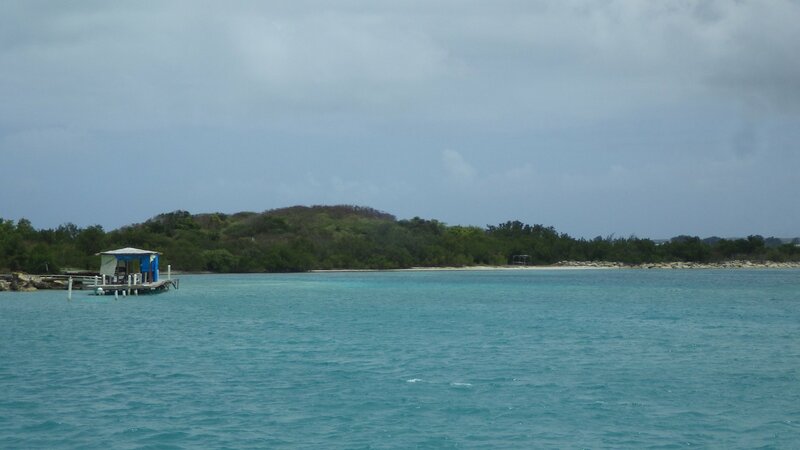 It is rough and pretty remote island, sort if an outpost. 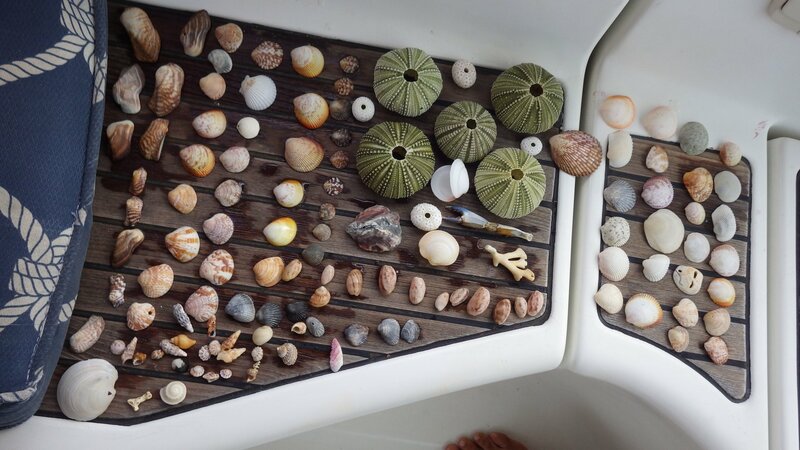 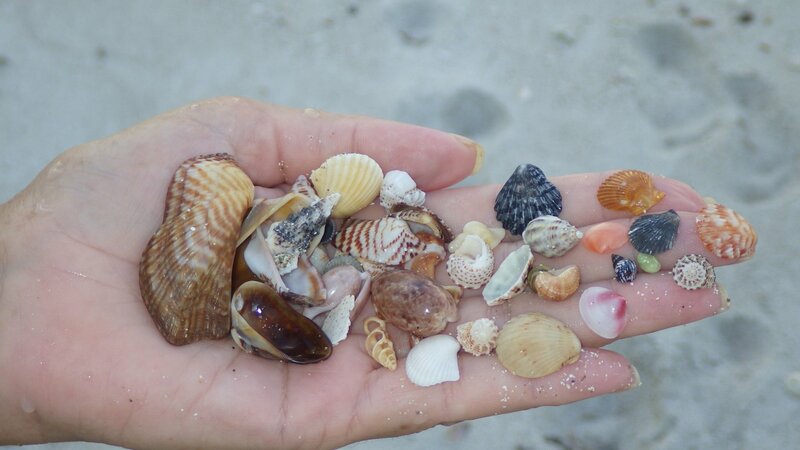 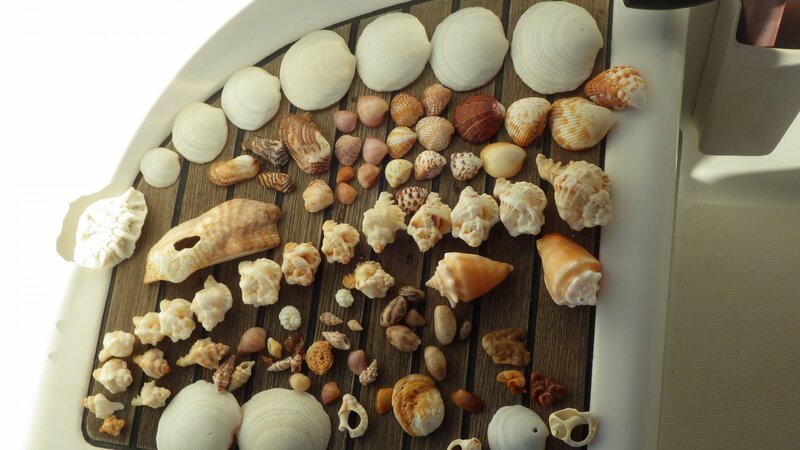 Good shell picking at the water edge - Larysa is becoming a professional shell collector. 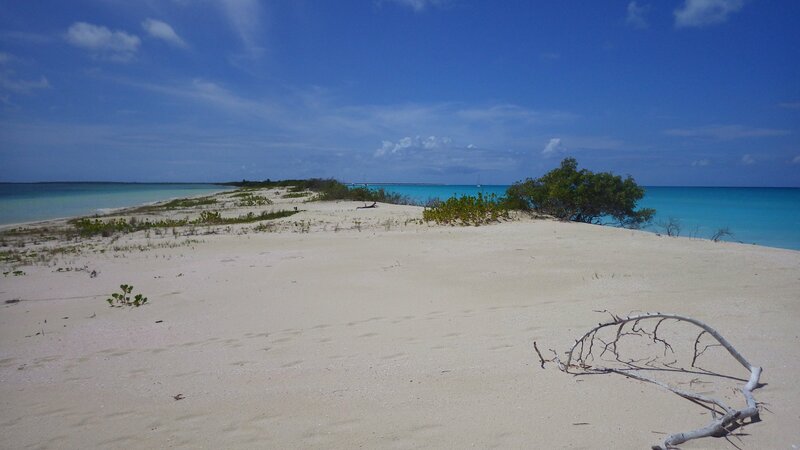 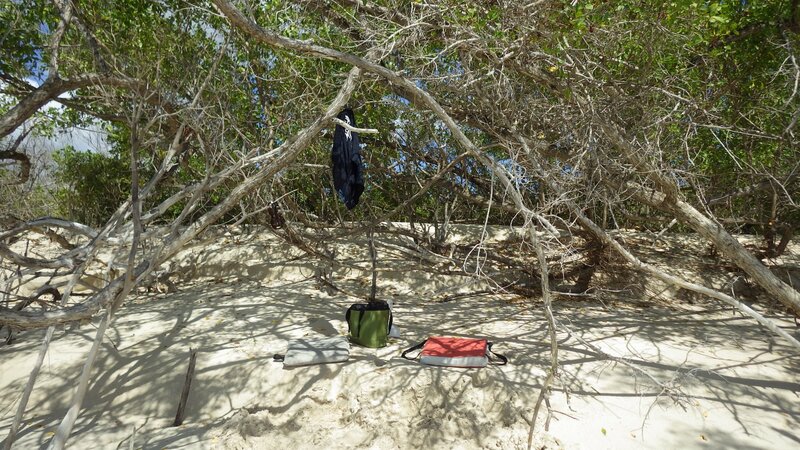 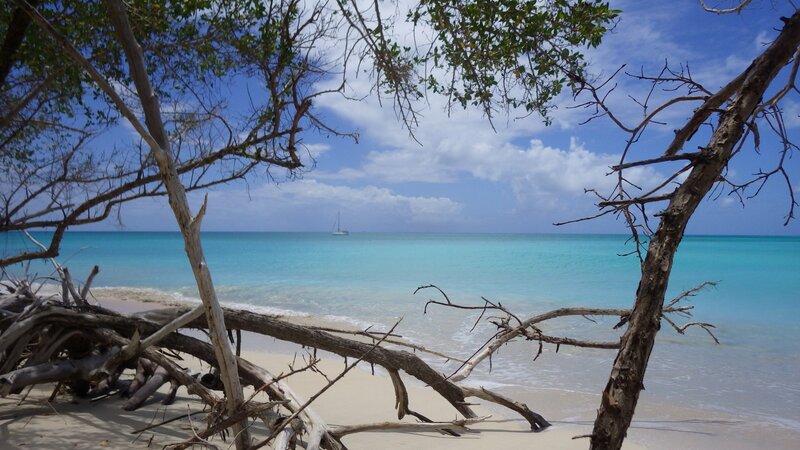 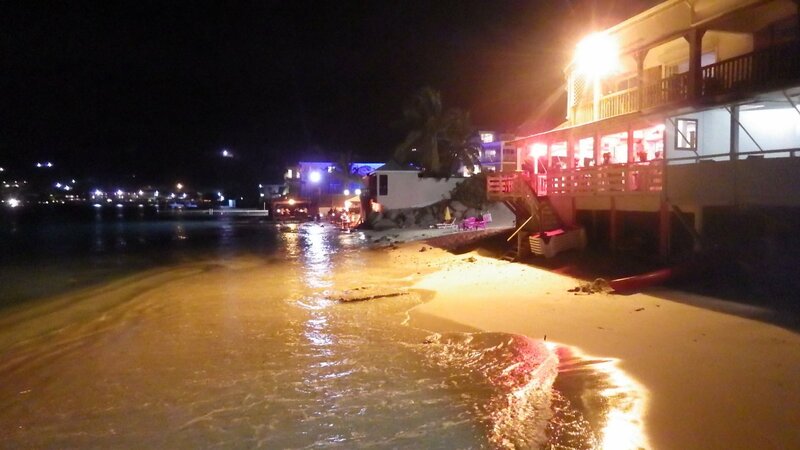 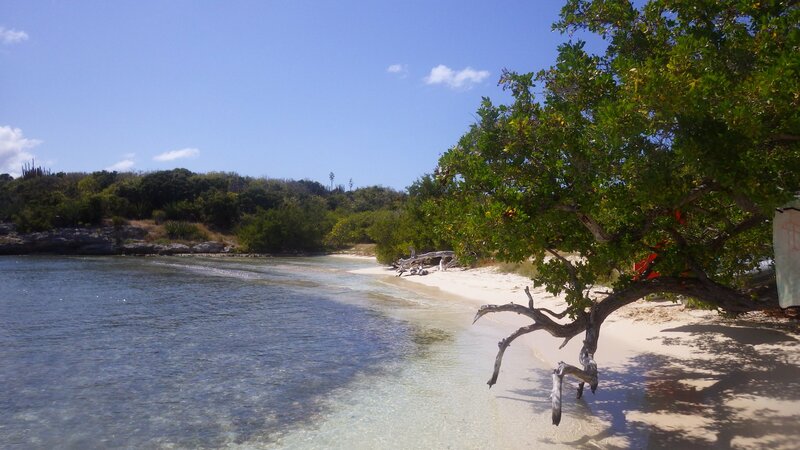 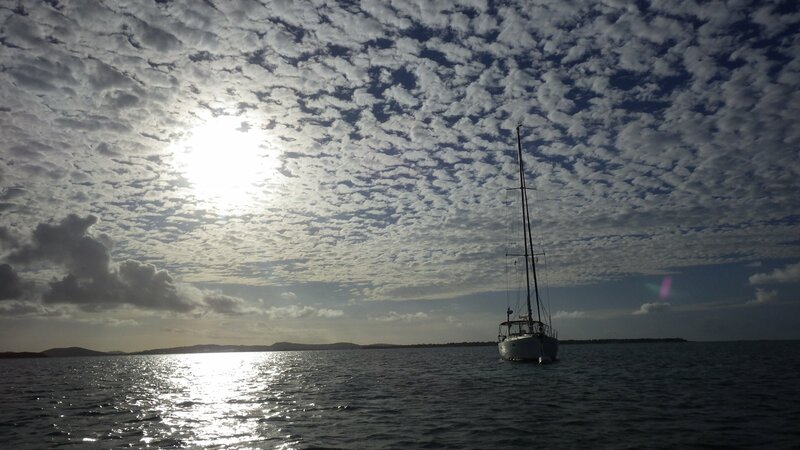 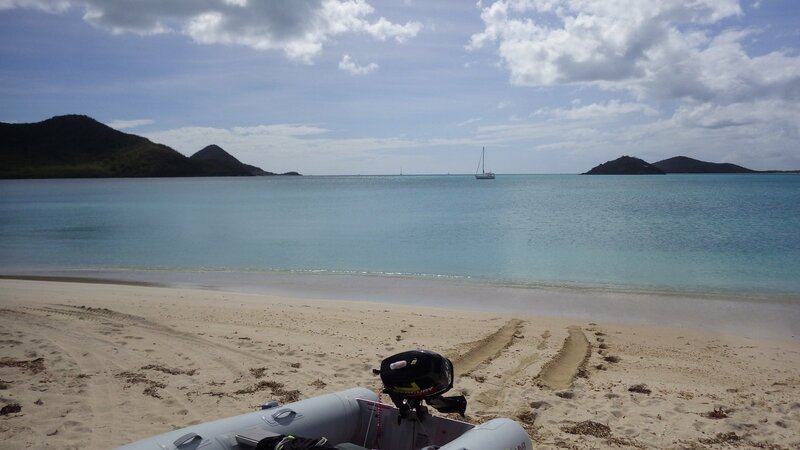 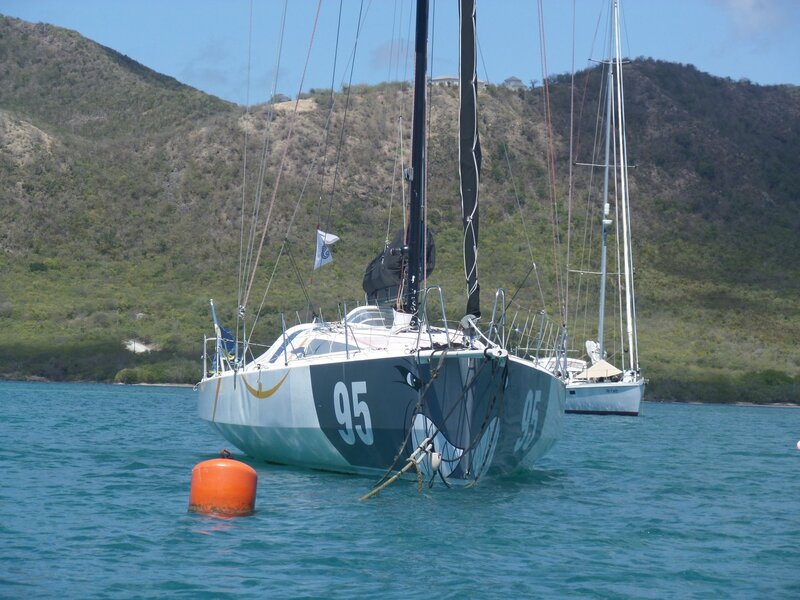 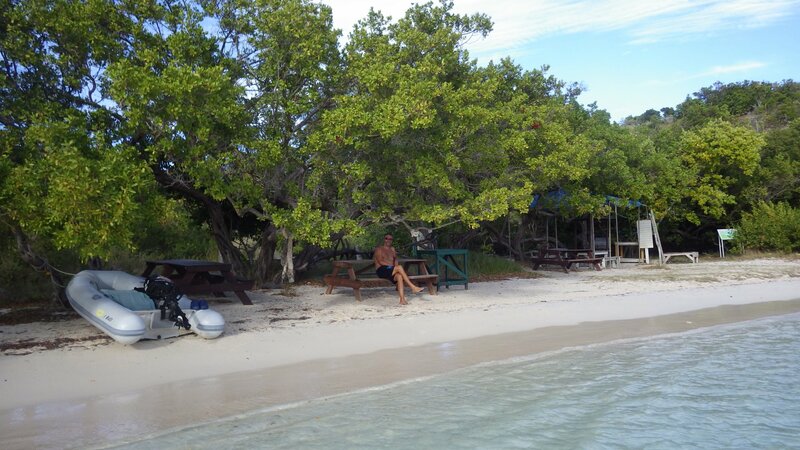 We were stuck on this paradise beach for several days, waiting for suitable wind to go west. 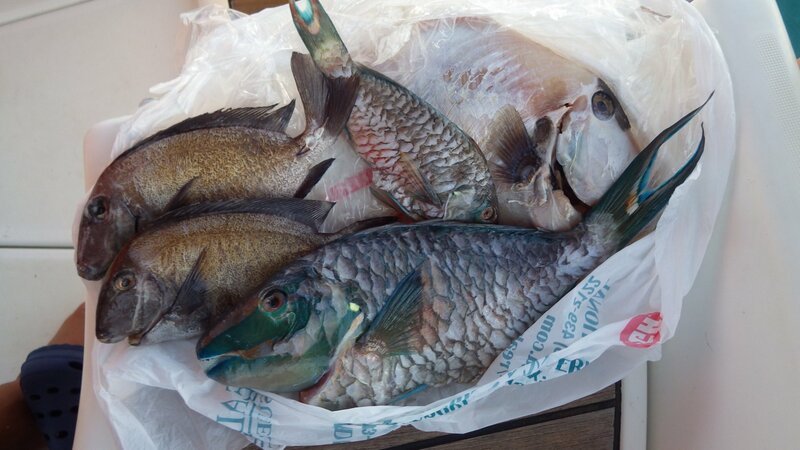 Running out of fresh produce, utilizing our stash of canned food. 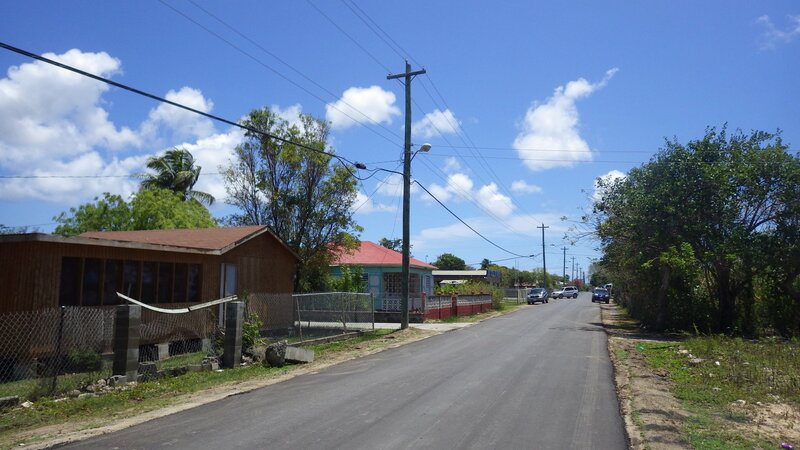 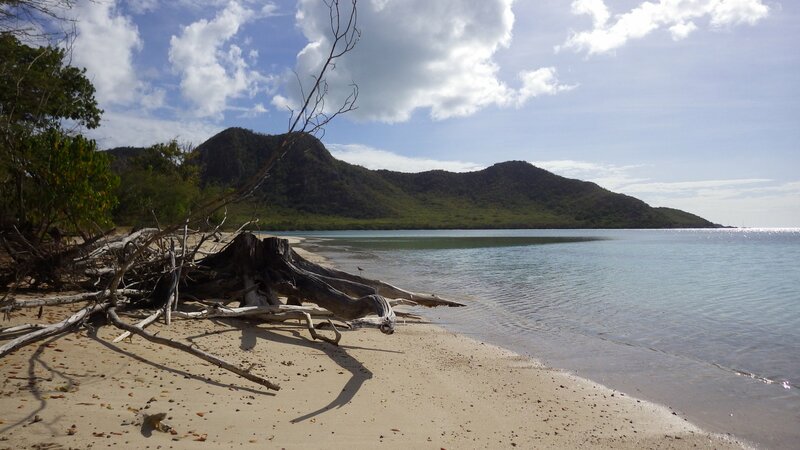 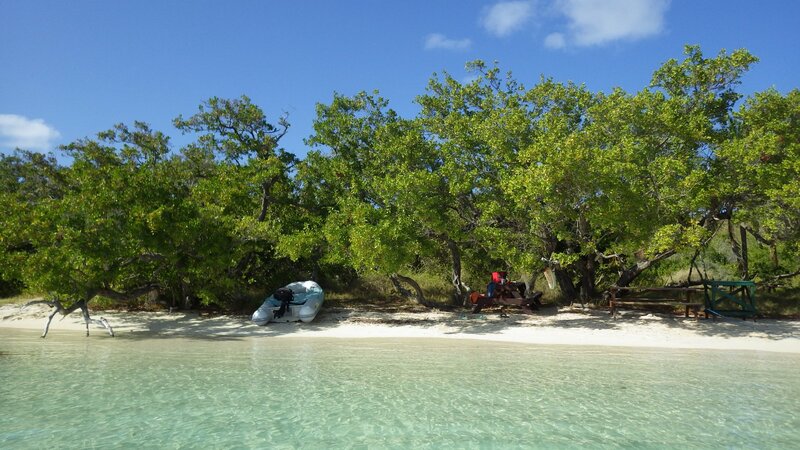 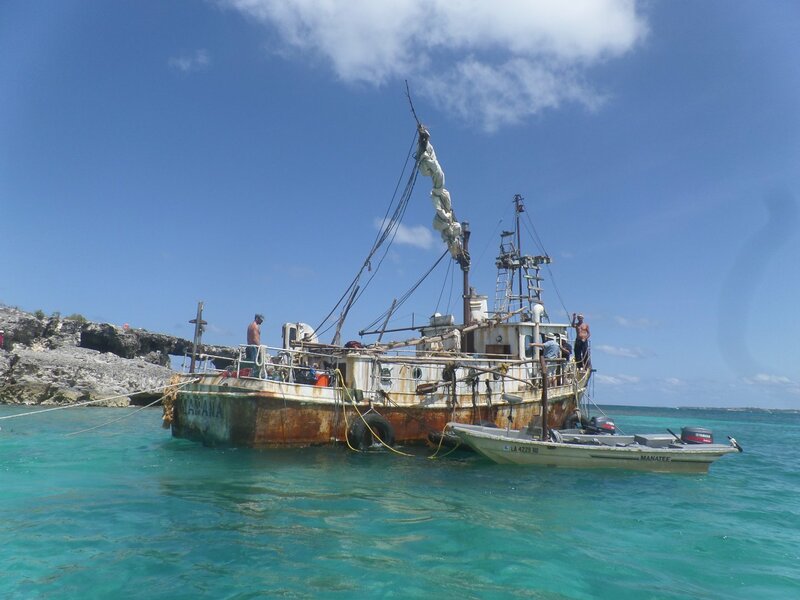 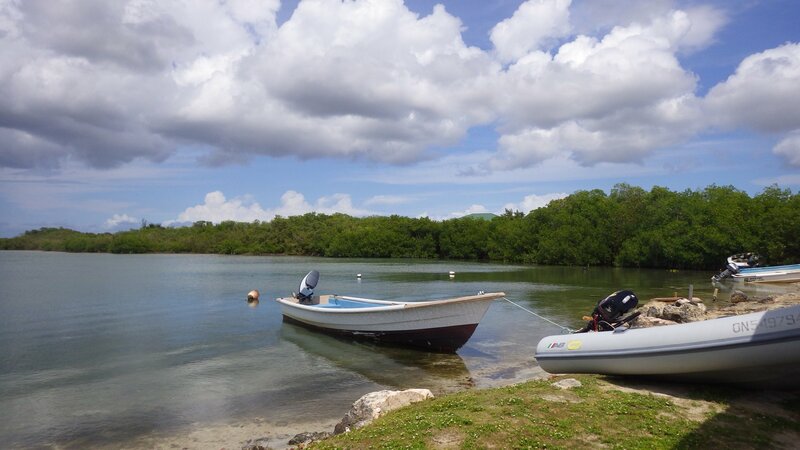 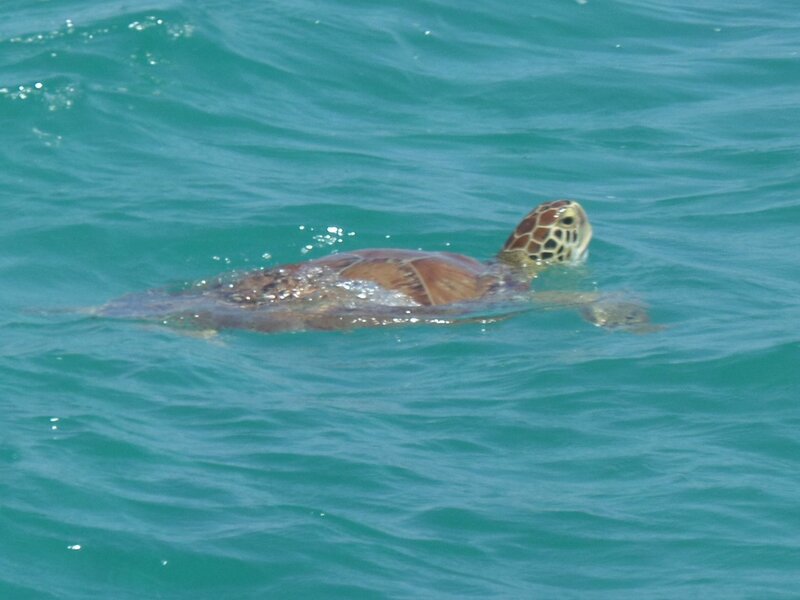 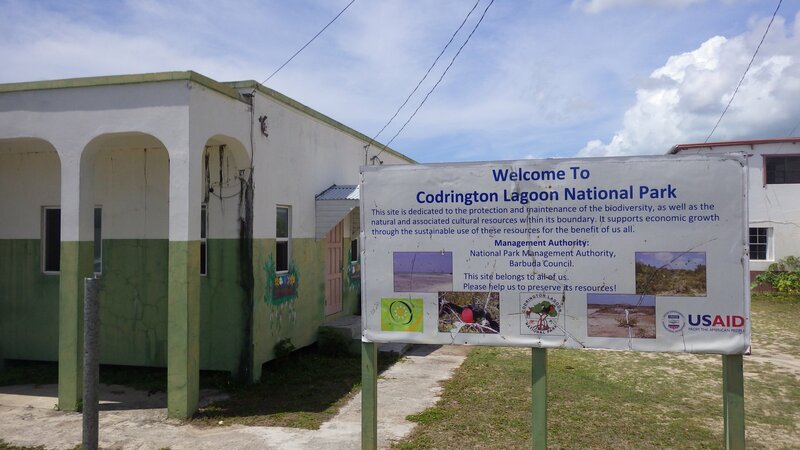 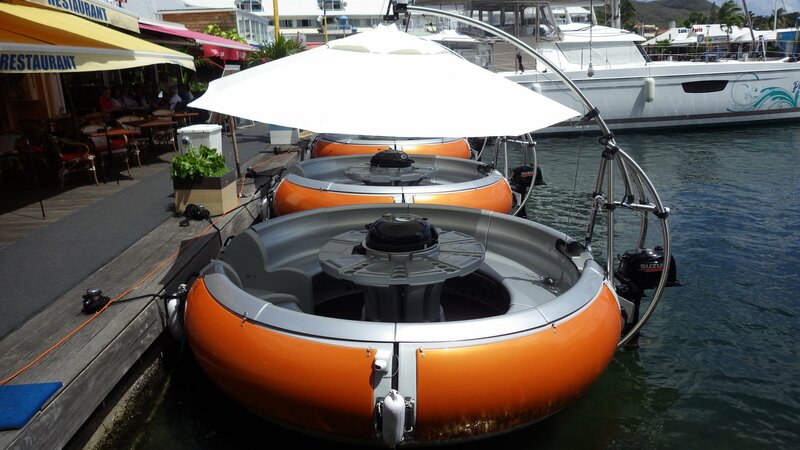 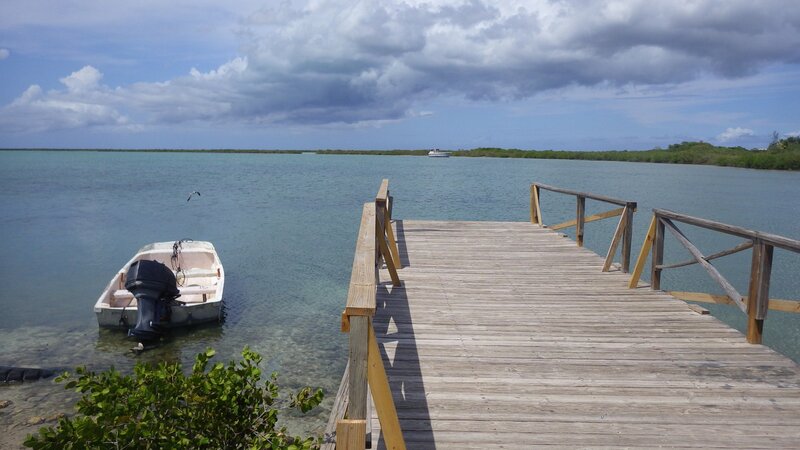 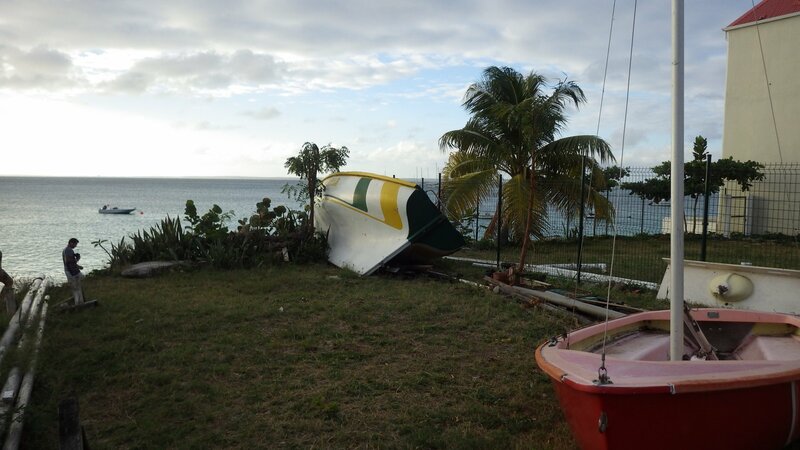 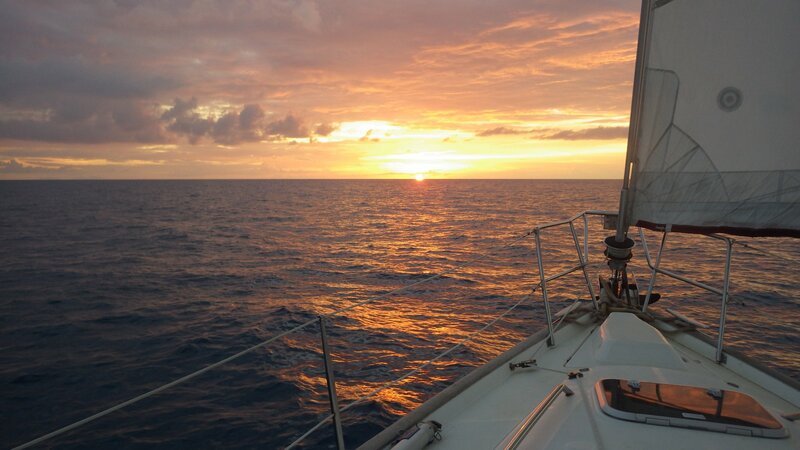 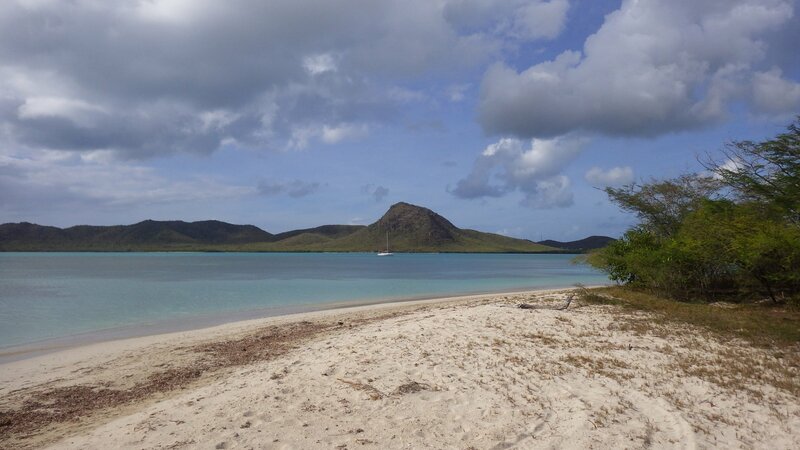 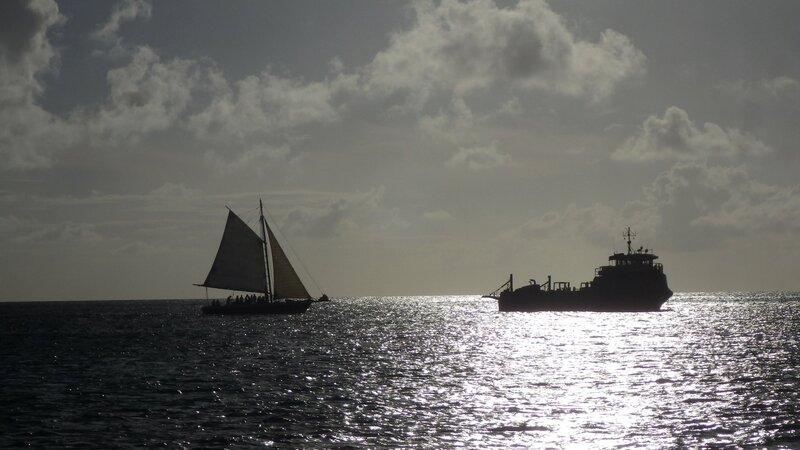 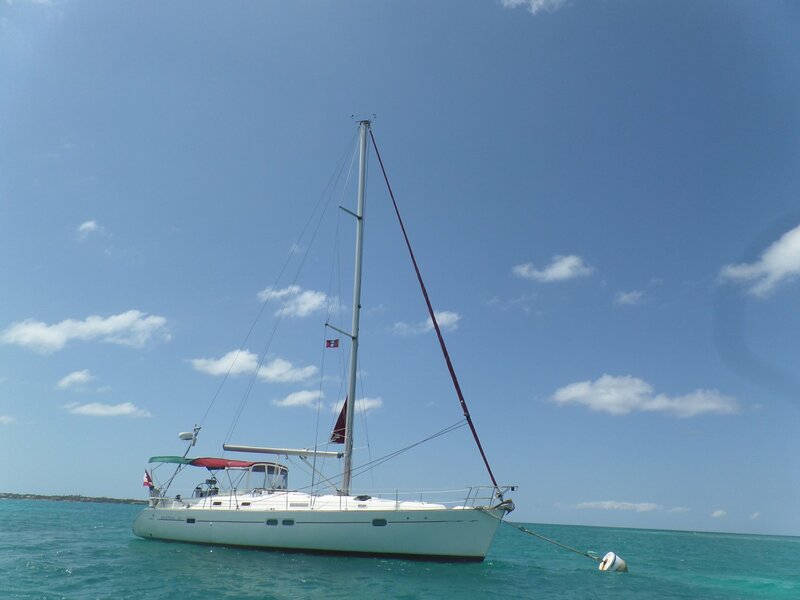 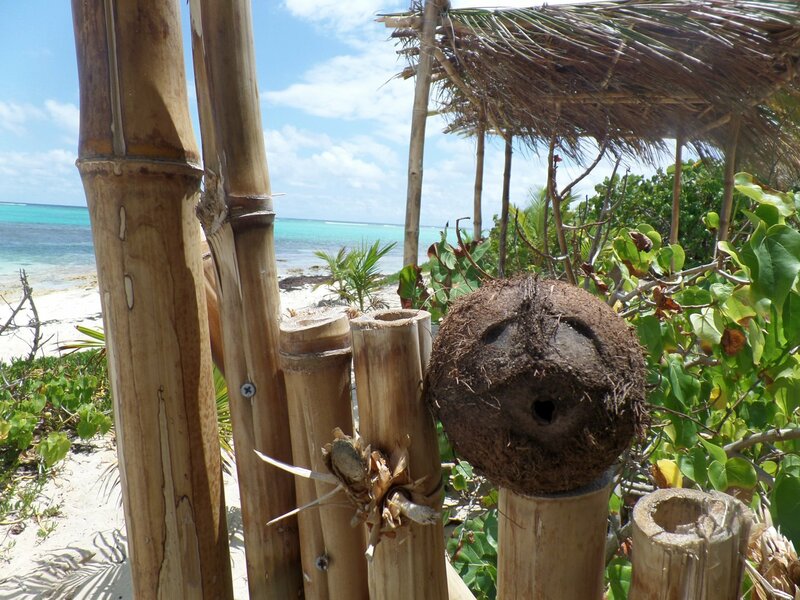 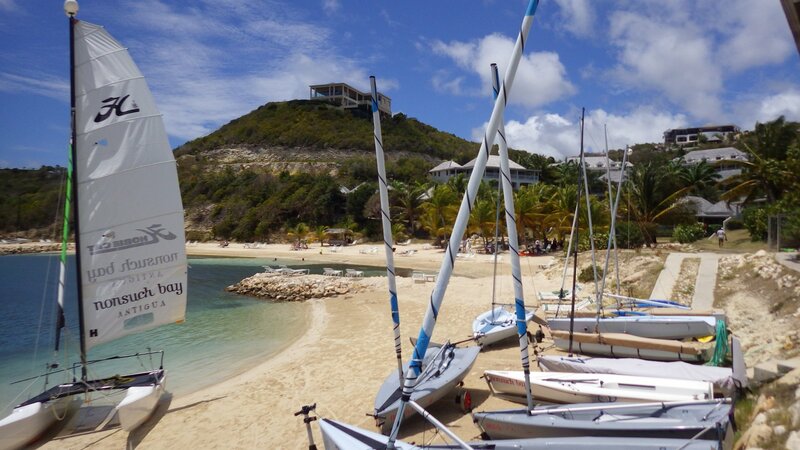 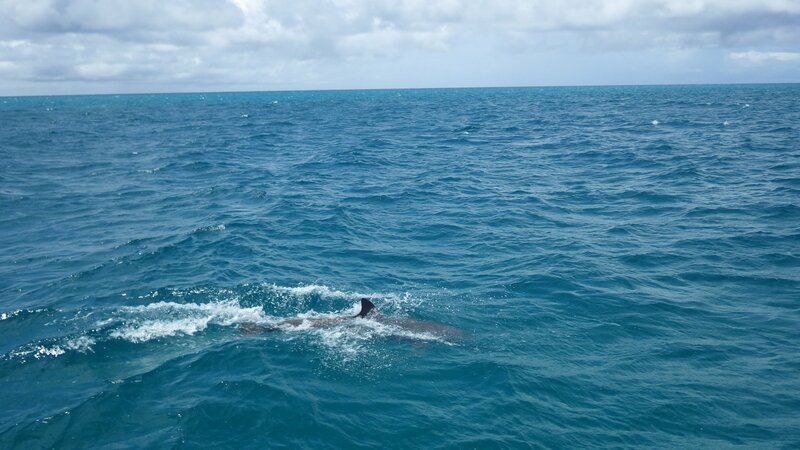 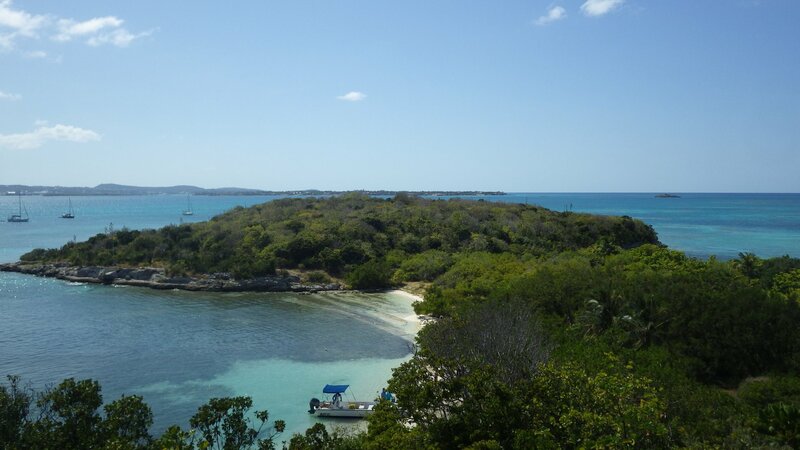 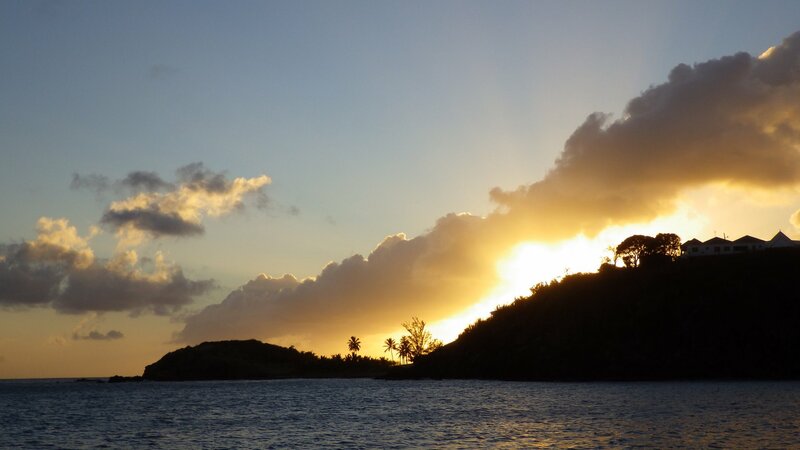 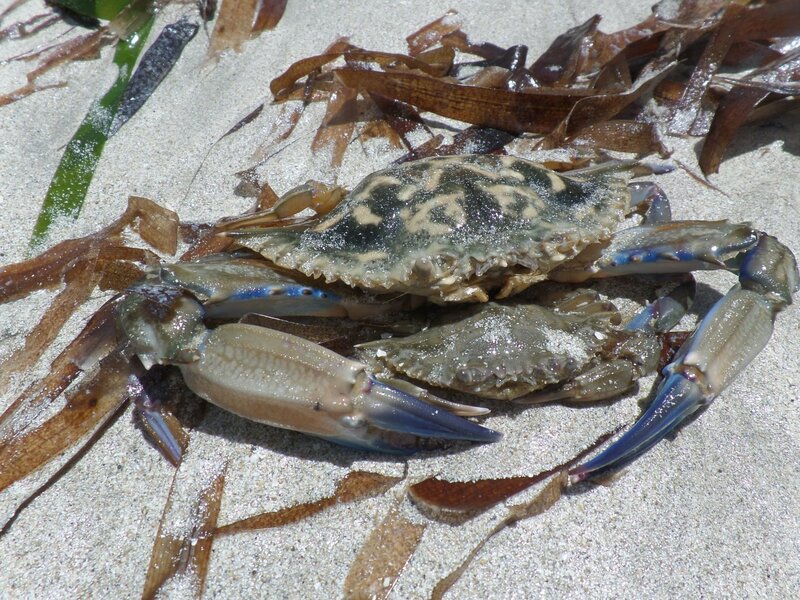 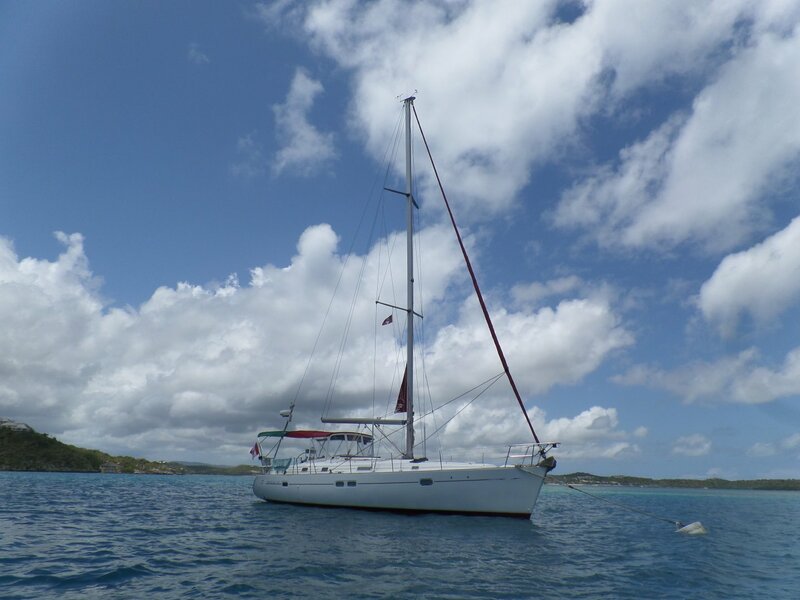 It is difficult to get to the only town on the island � need to beach dinghy in a large swell, pull it across 100 ft of sand bar, and then go in it across a 2-mile wide lagoon. 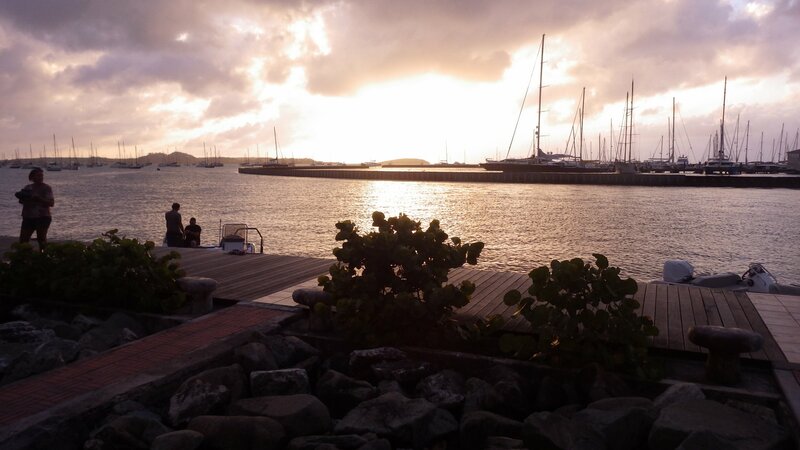 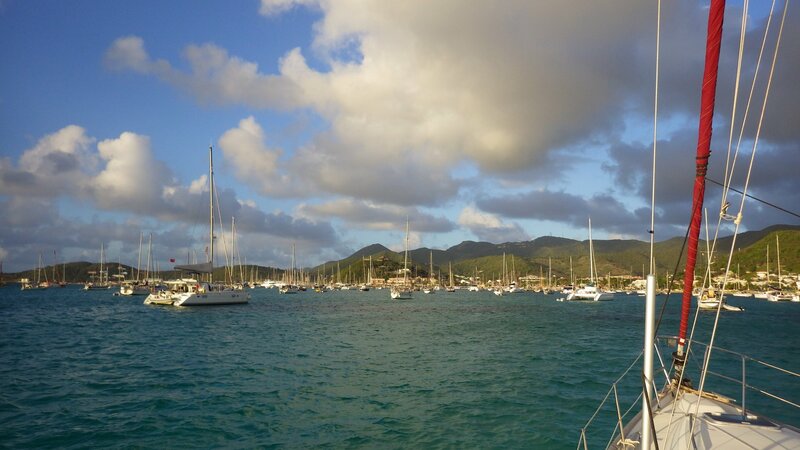 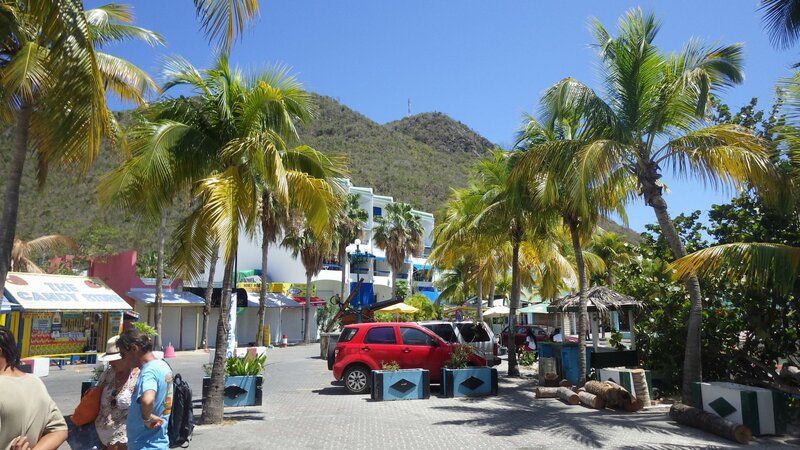 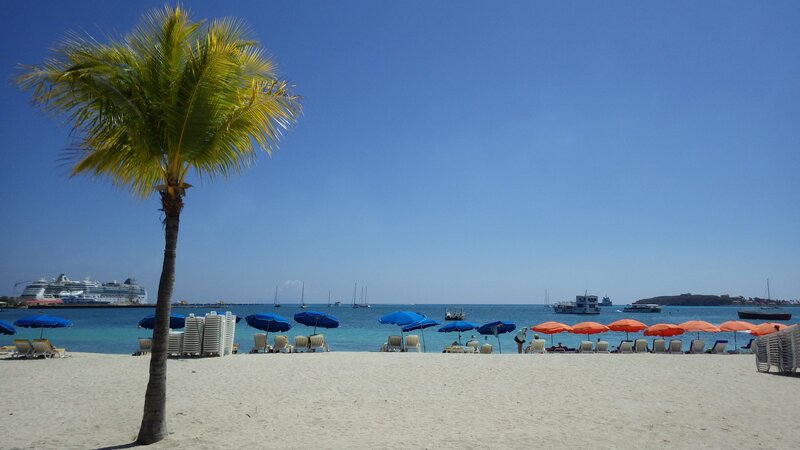 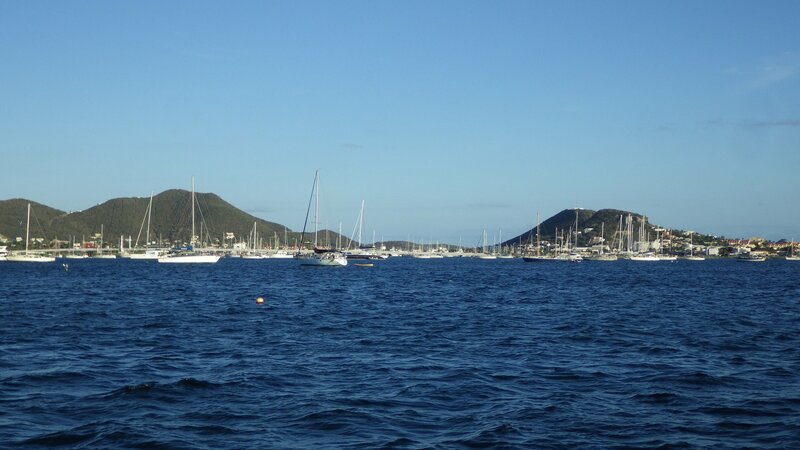 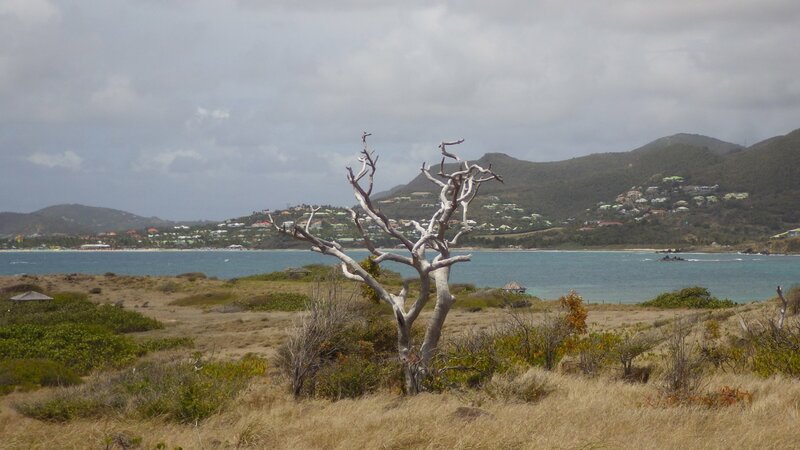 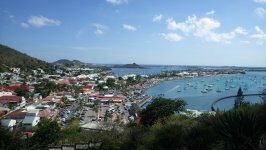 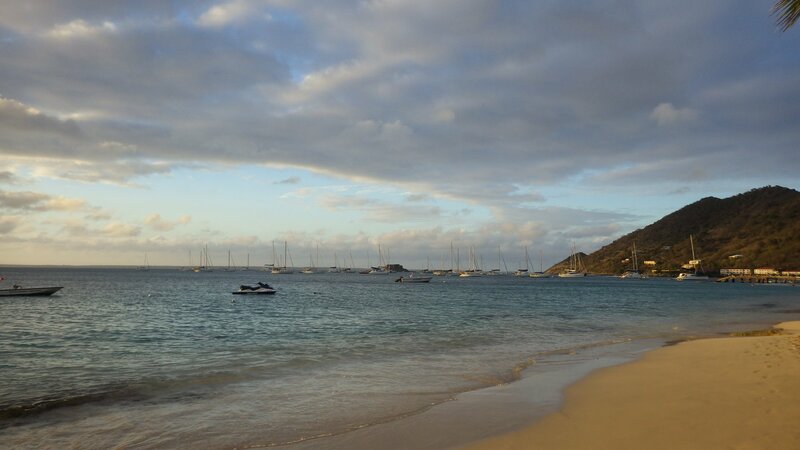 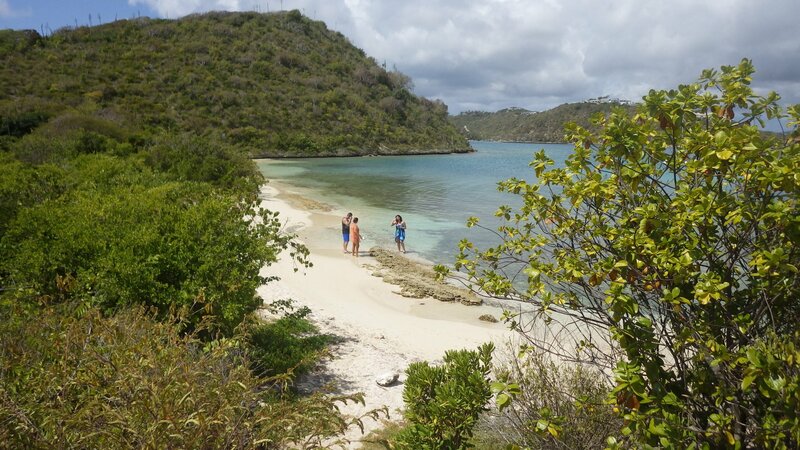 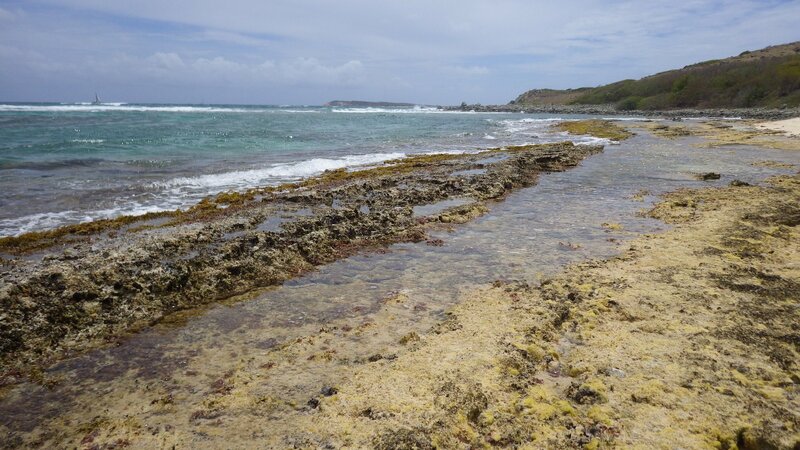 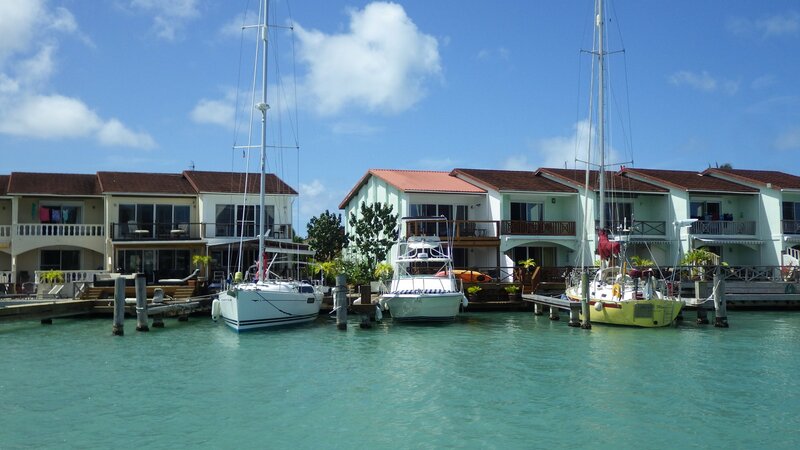 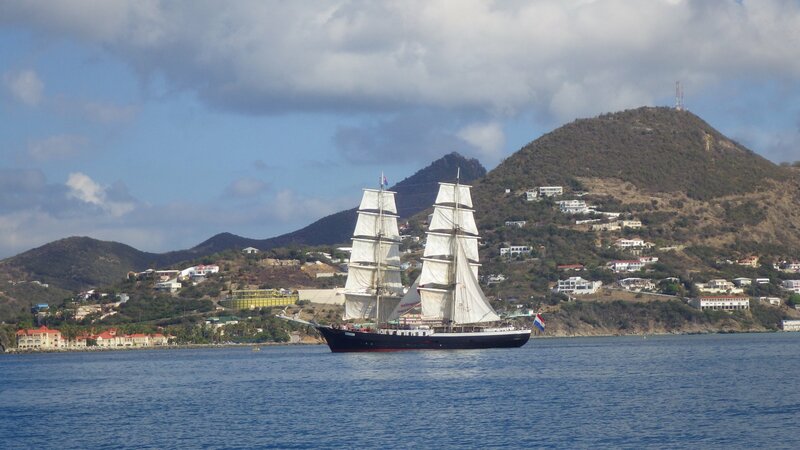 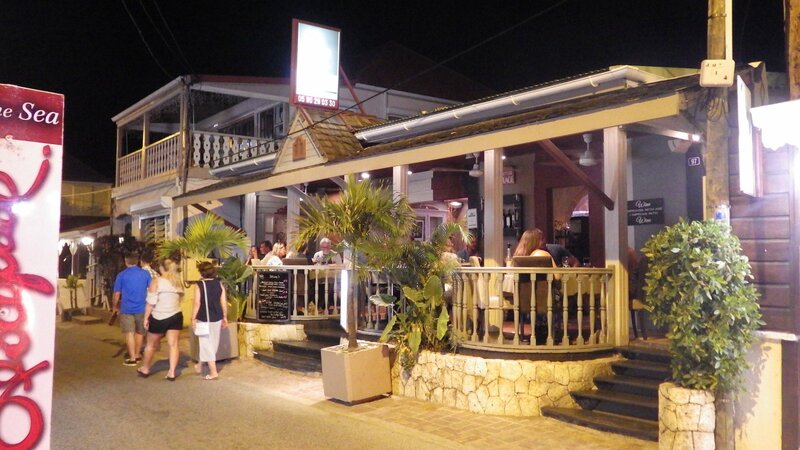 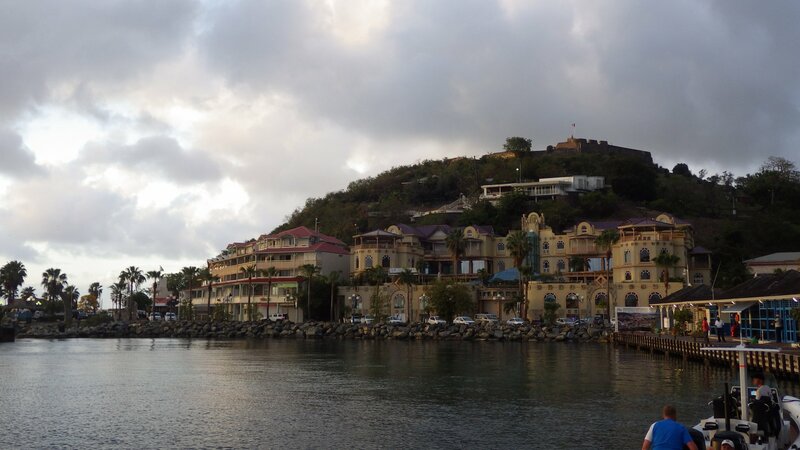 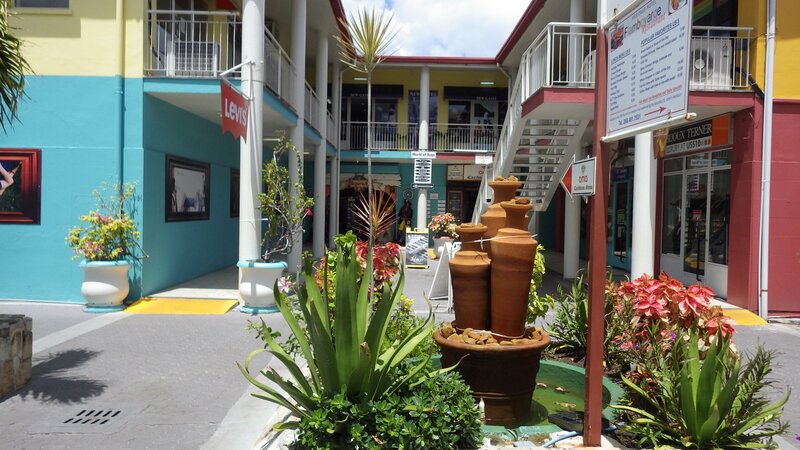 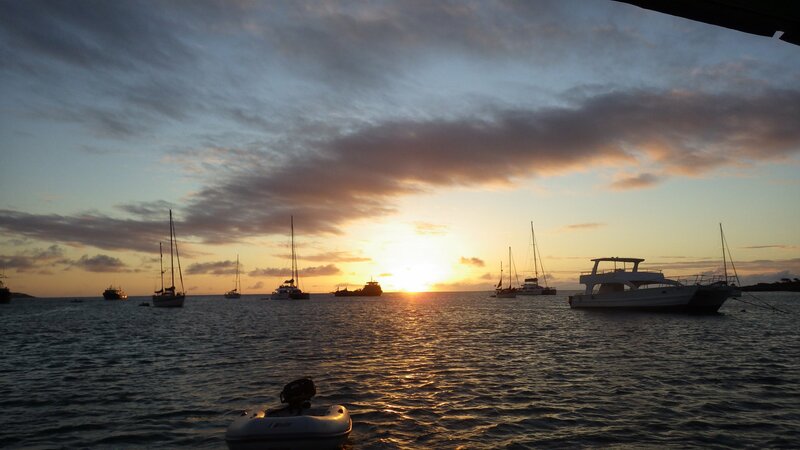 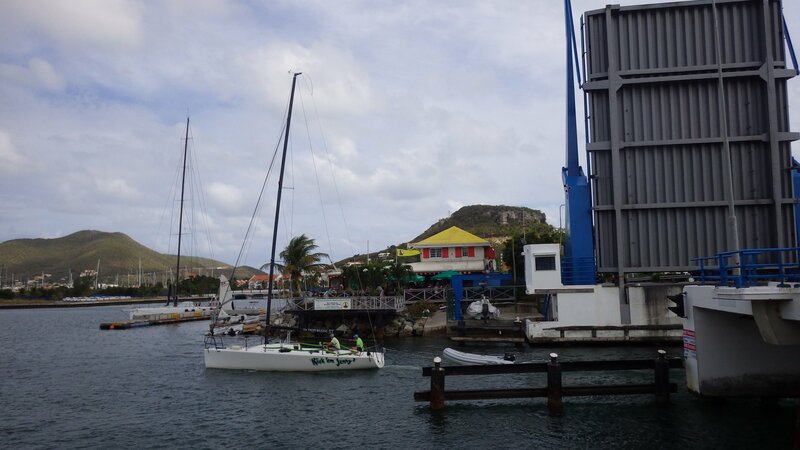 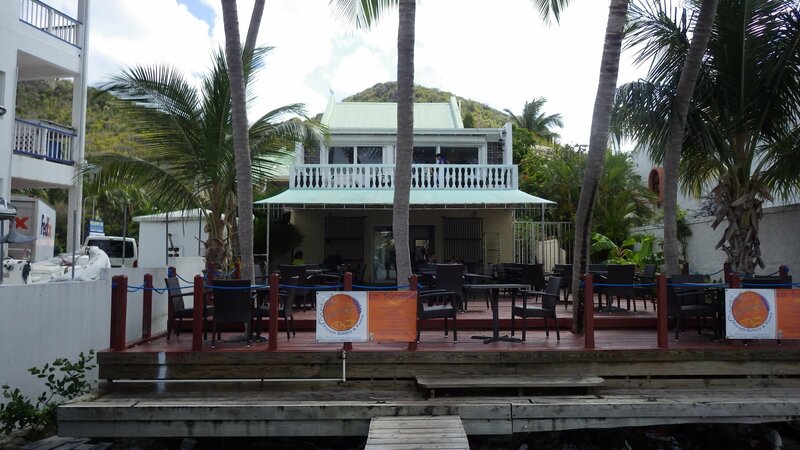 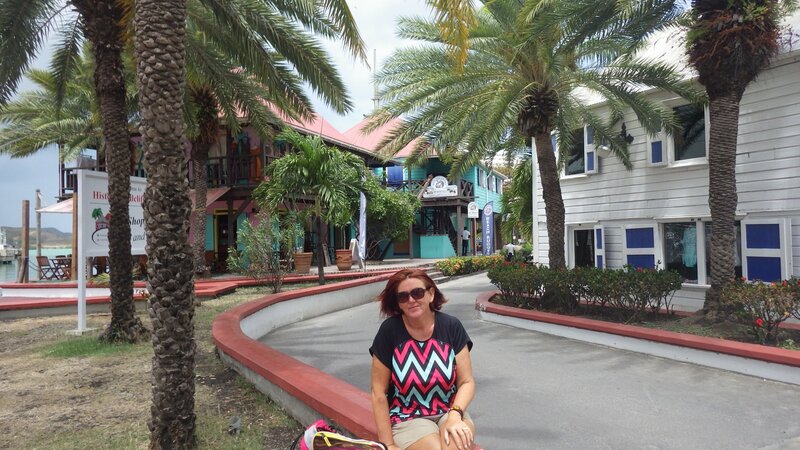 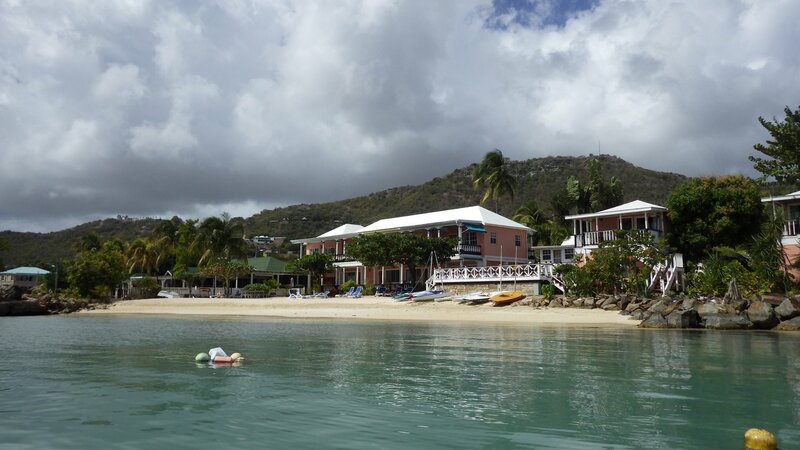 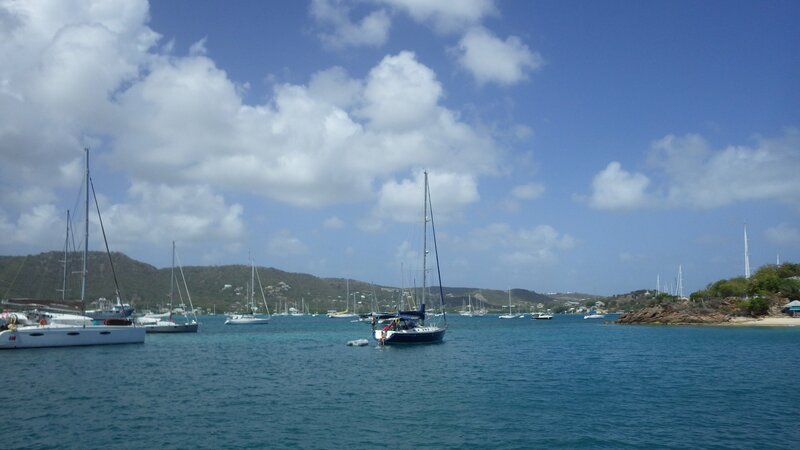 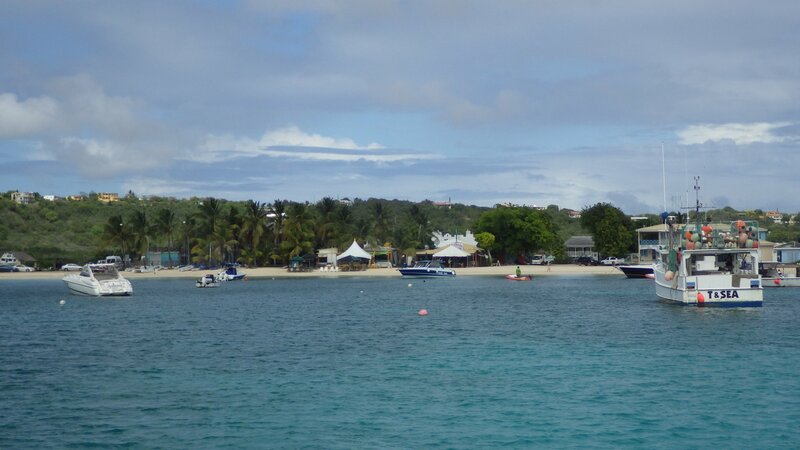 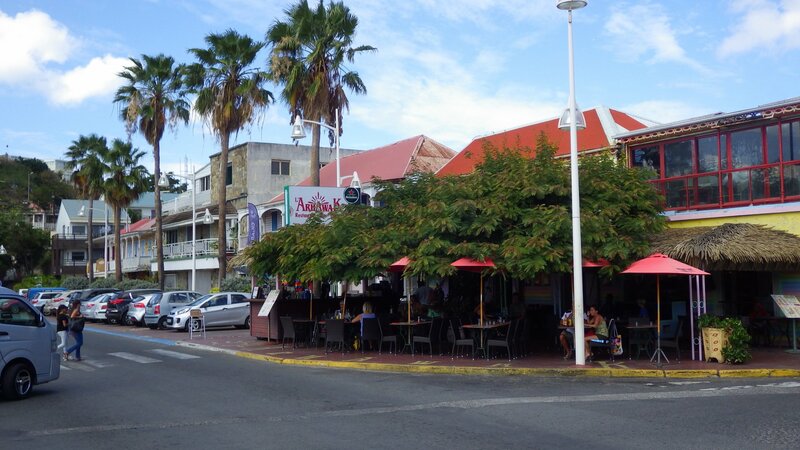 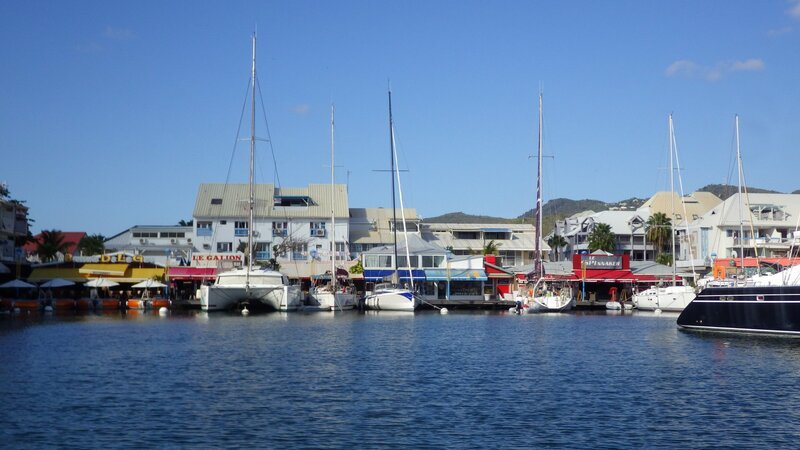 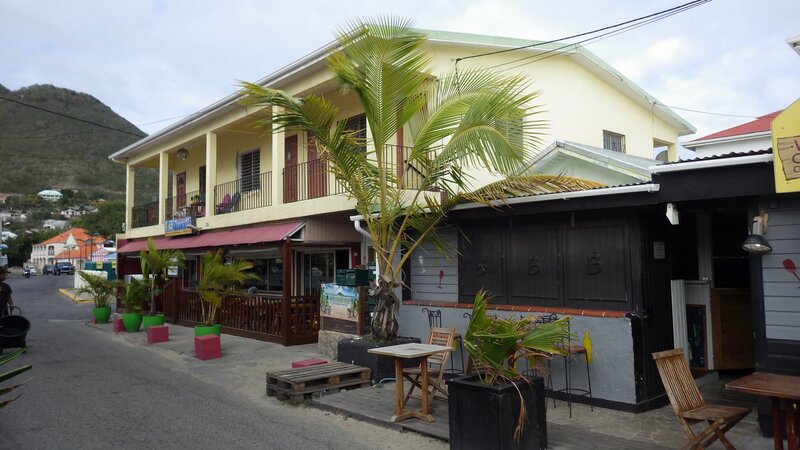 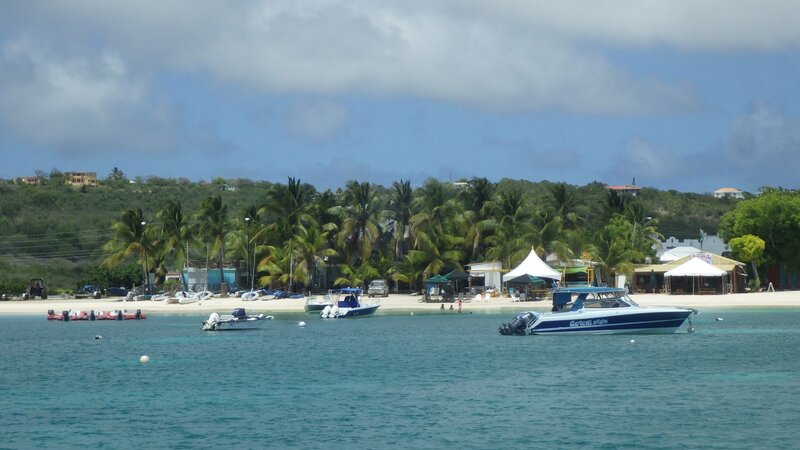 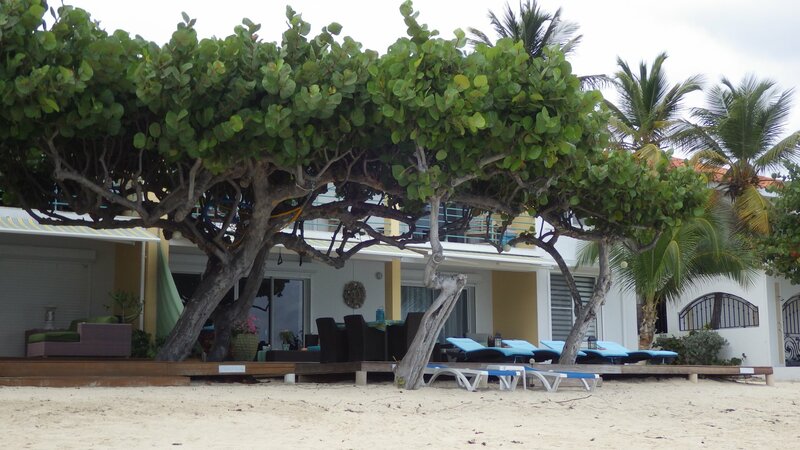 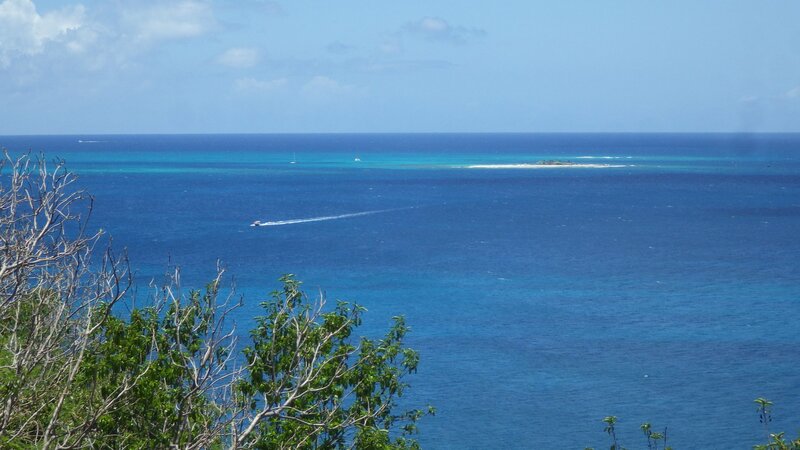 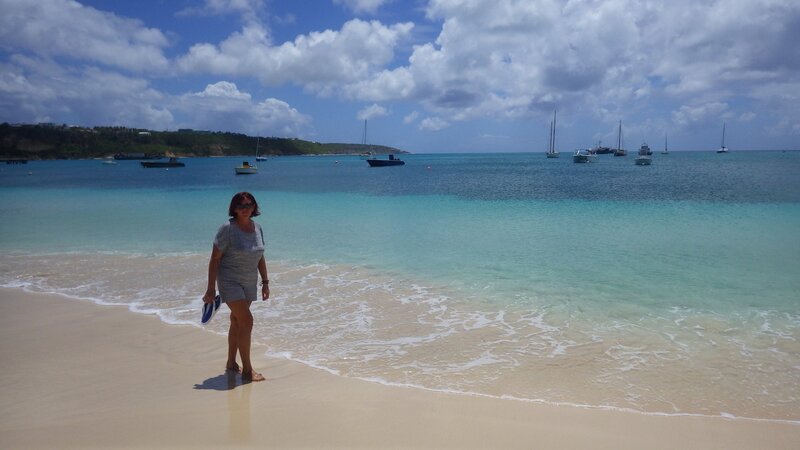 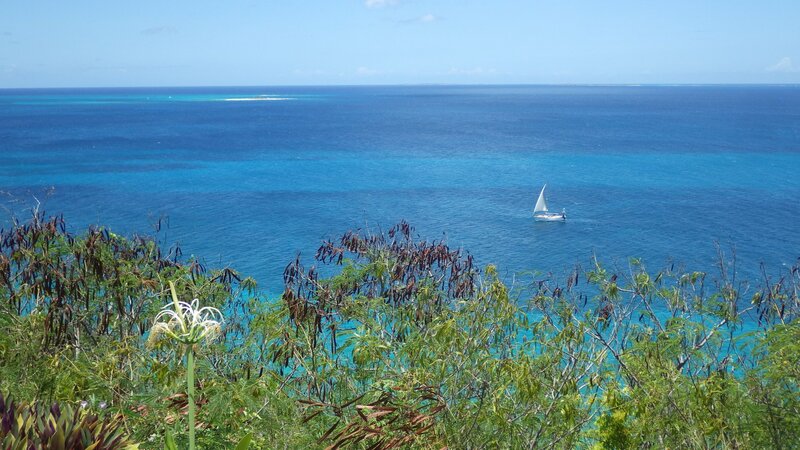 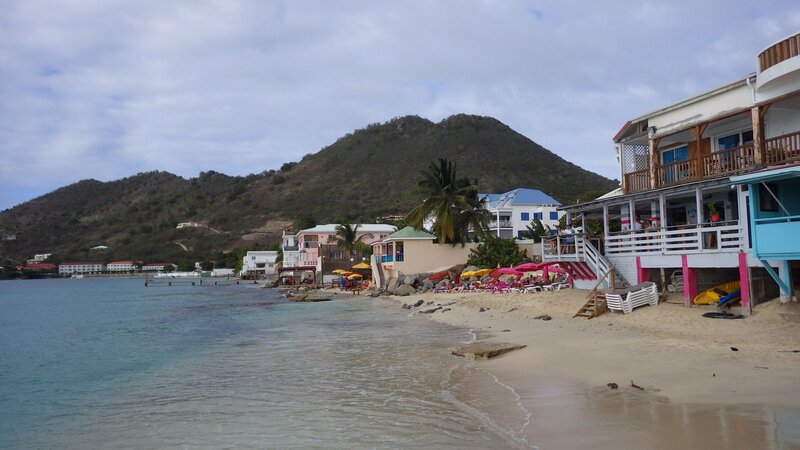 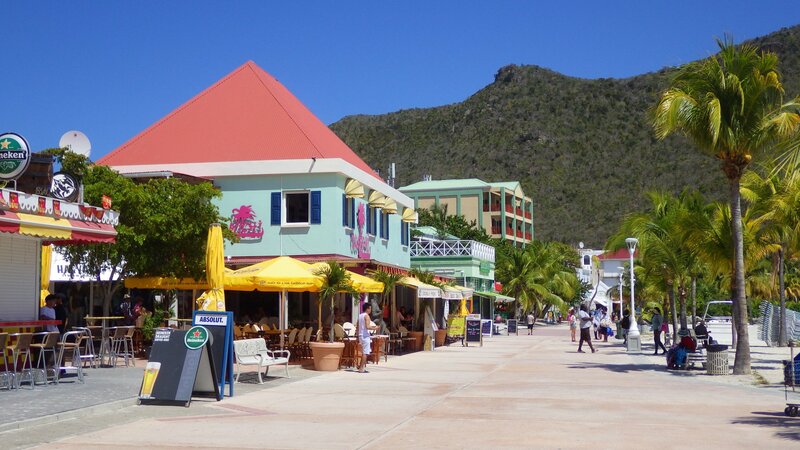 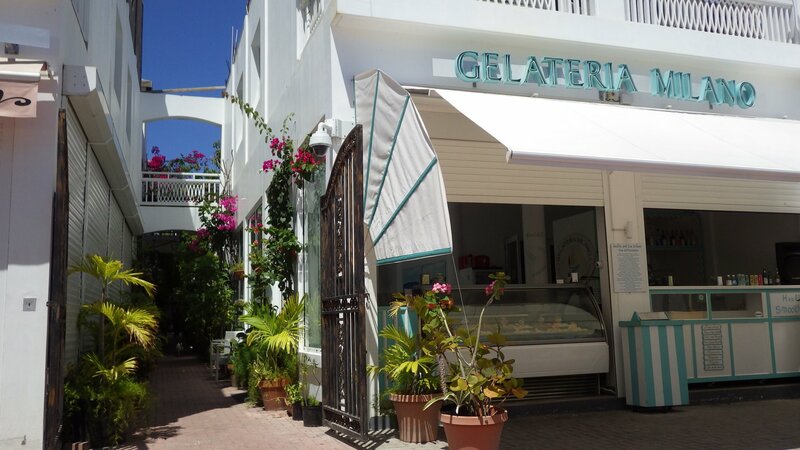 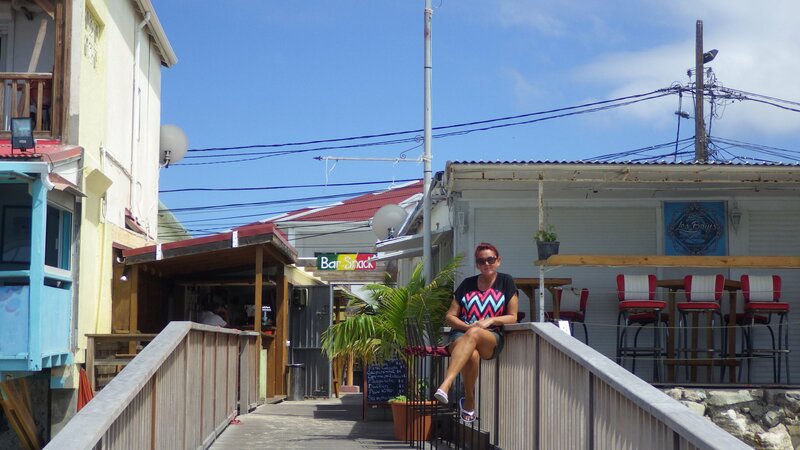 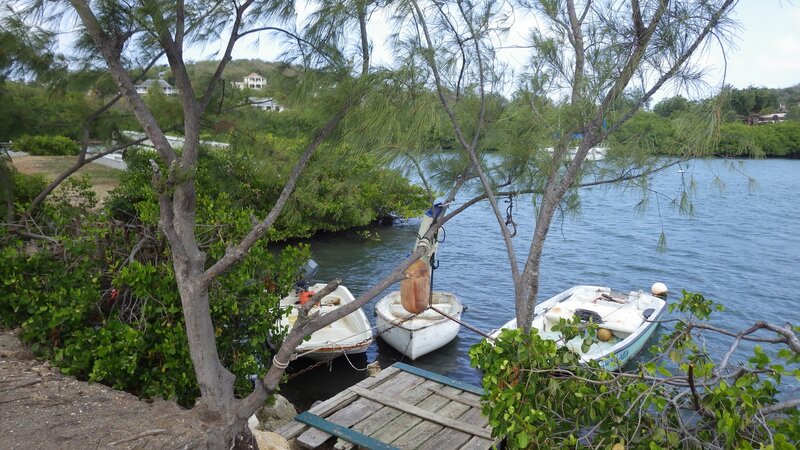 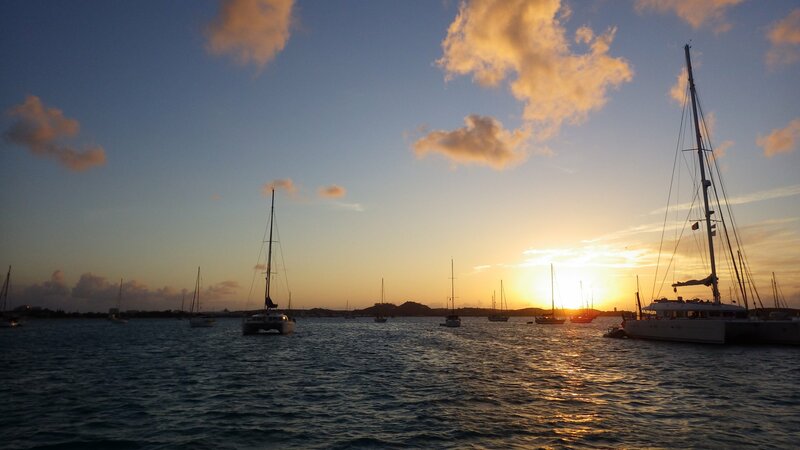 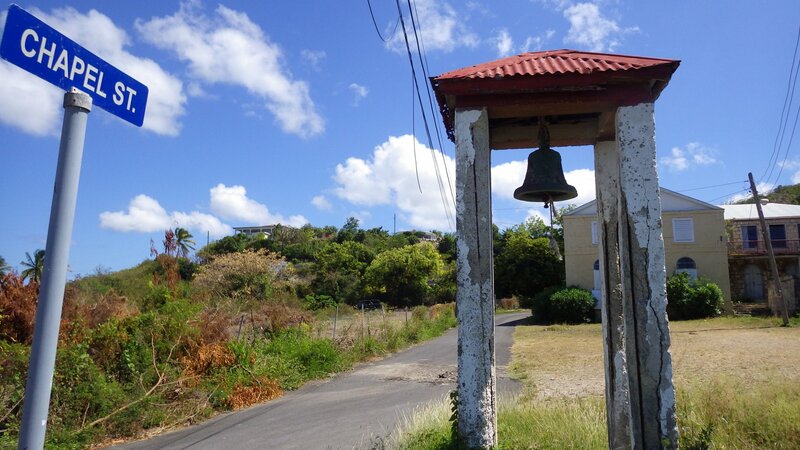 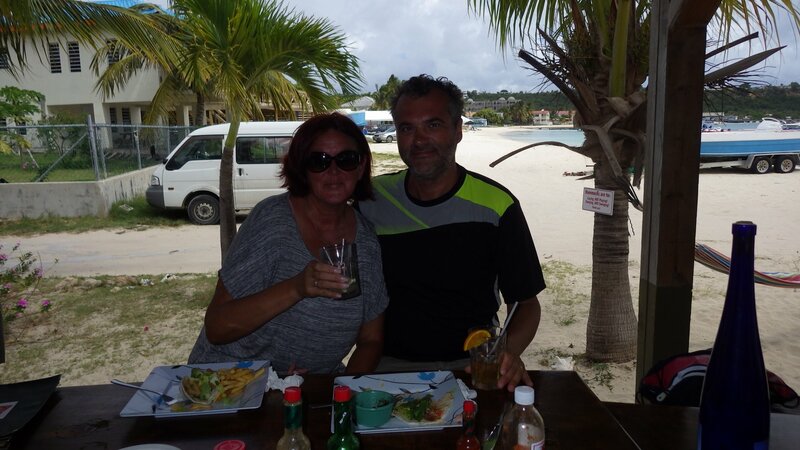 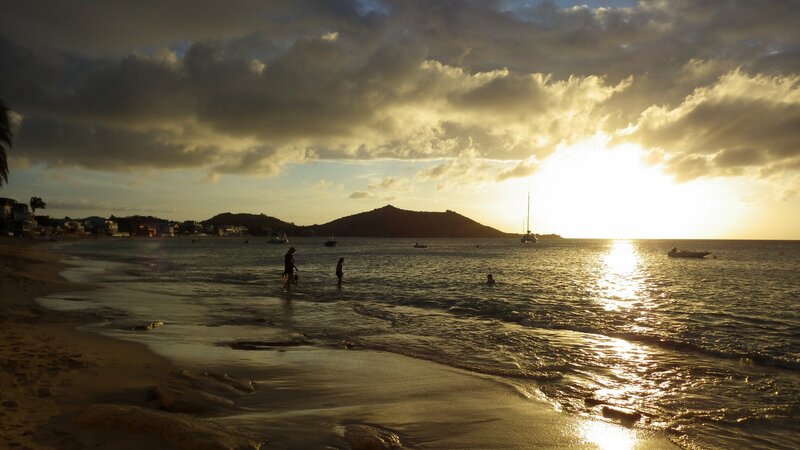 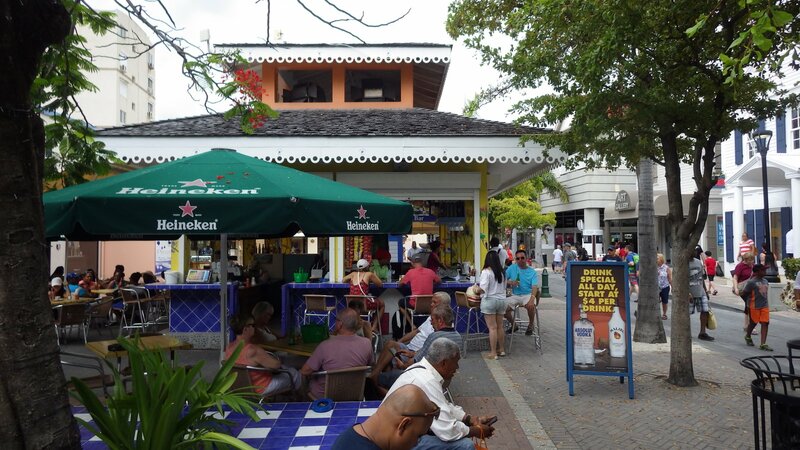 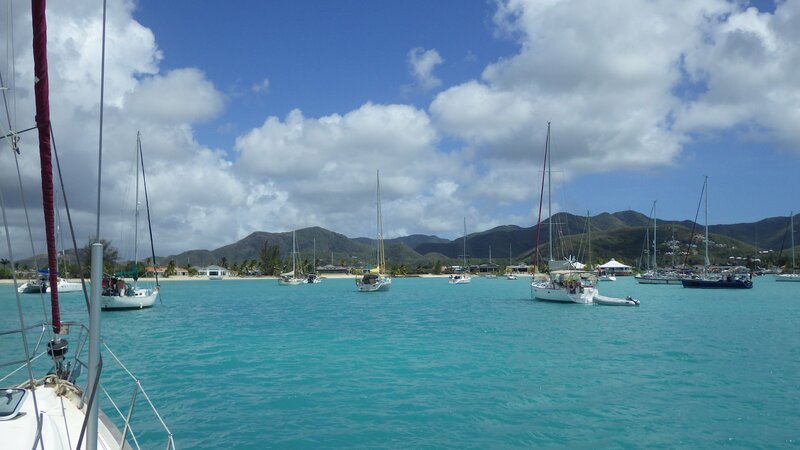 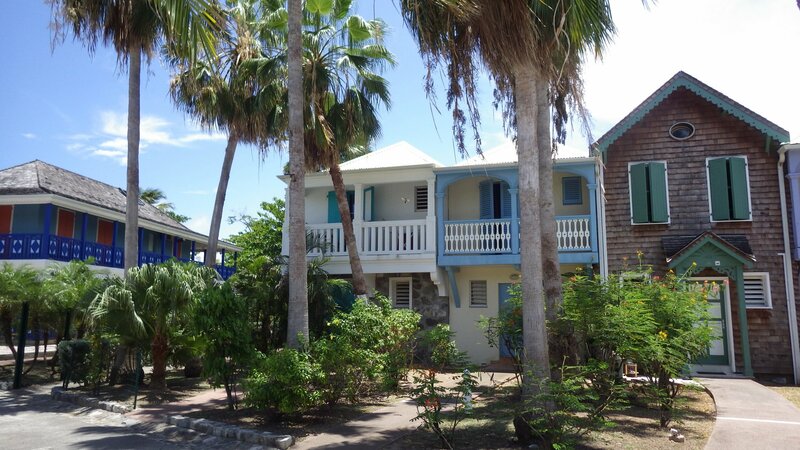 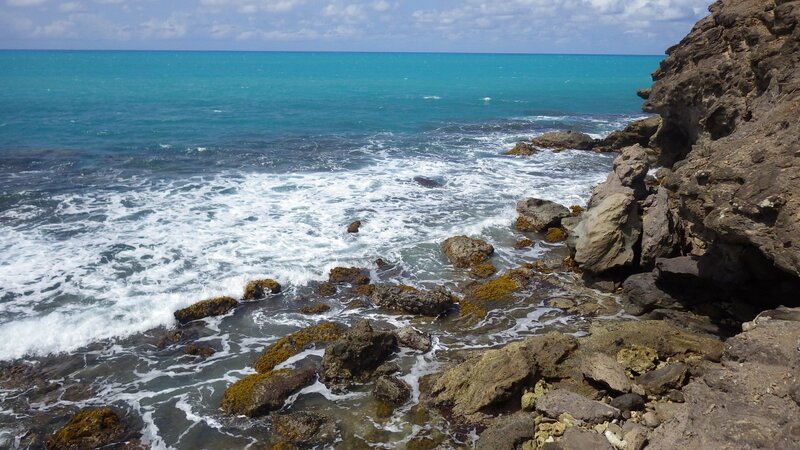 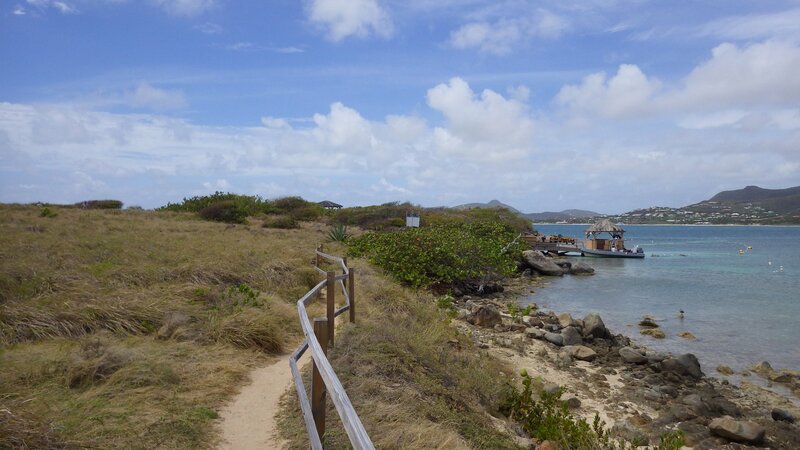 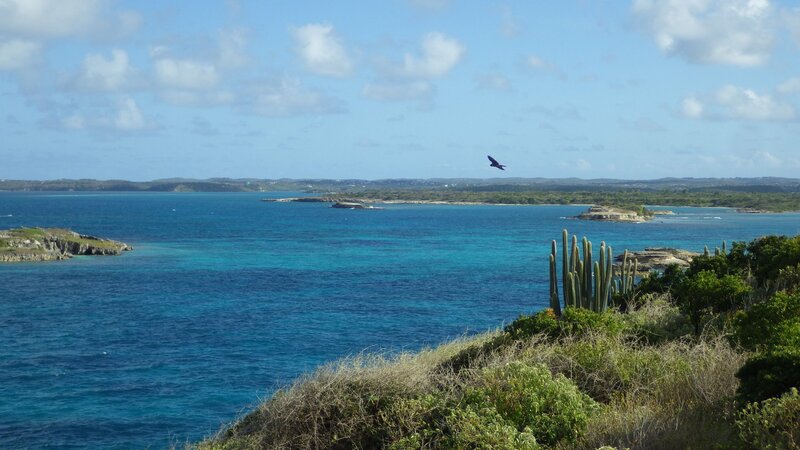 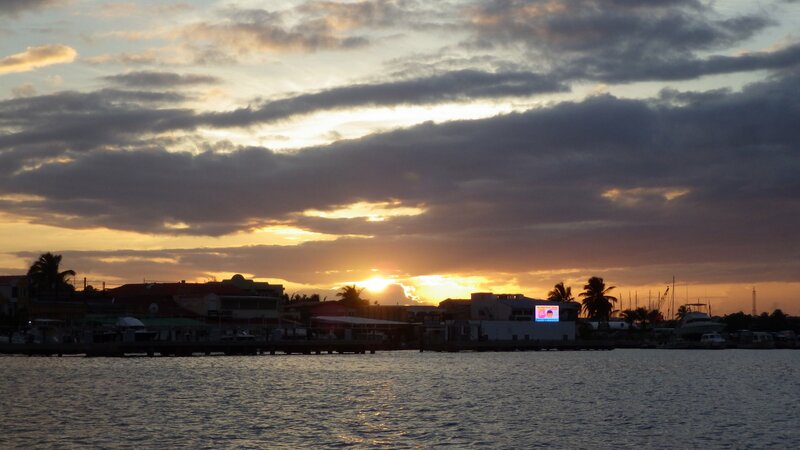 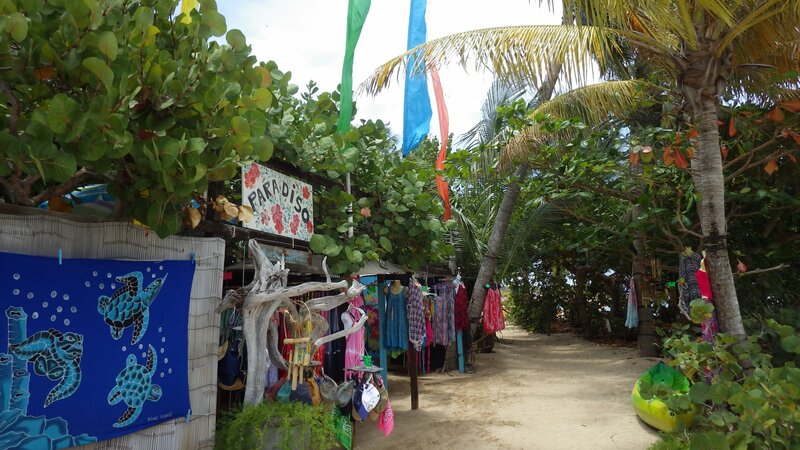 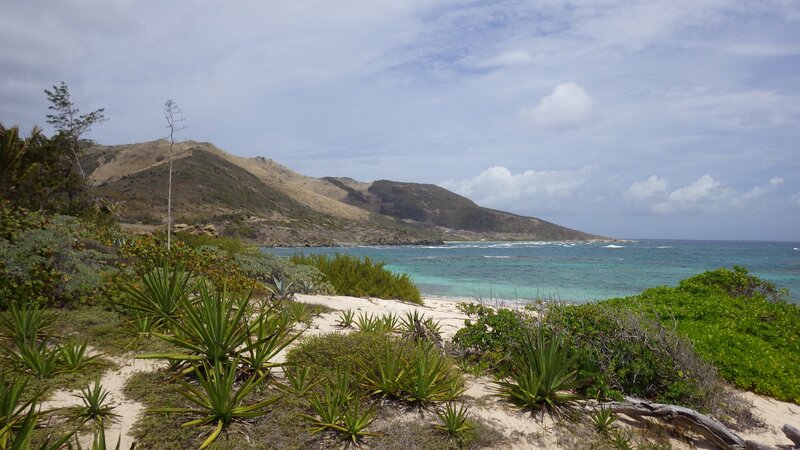 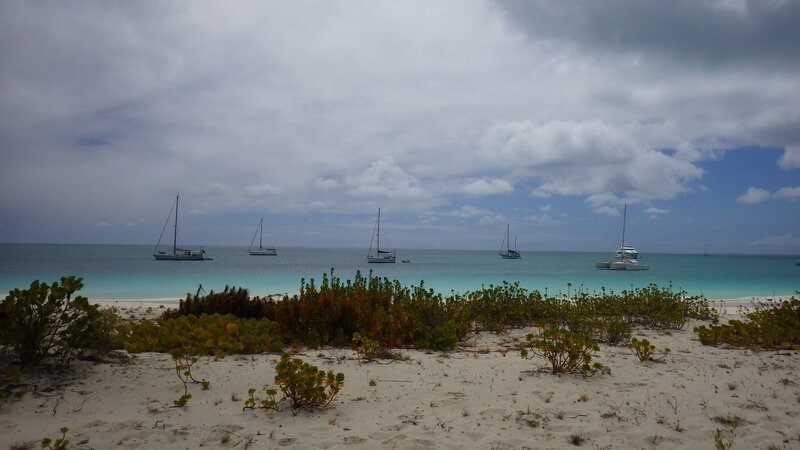 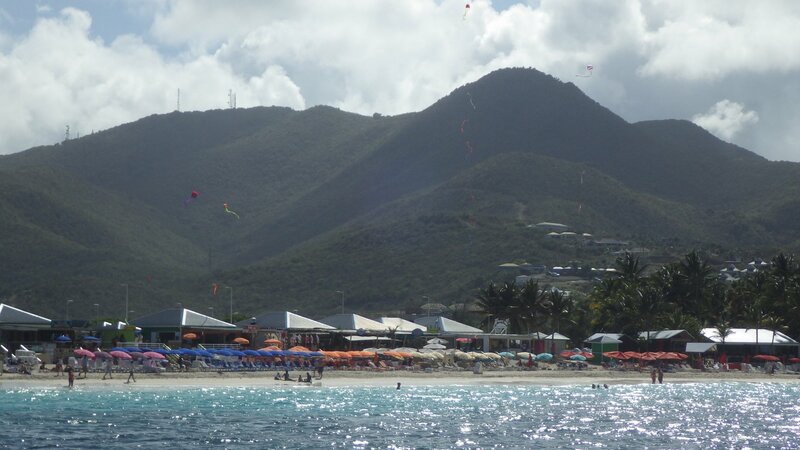 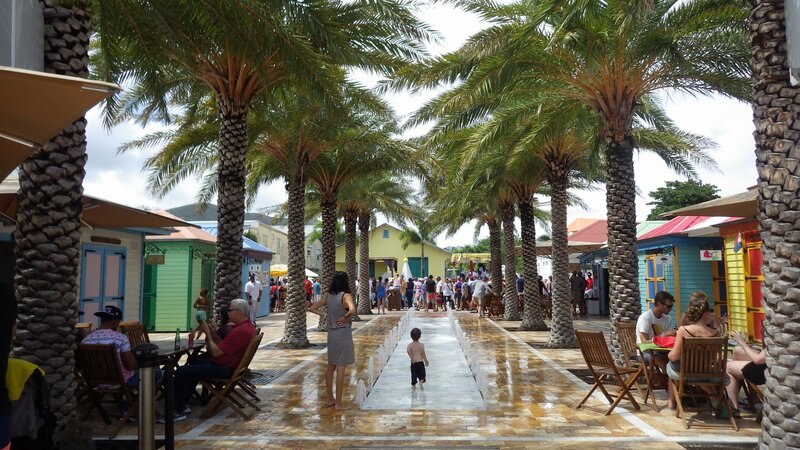 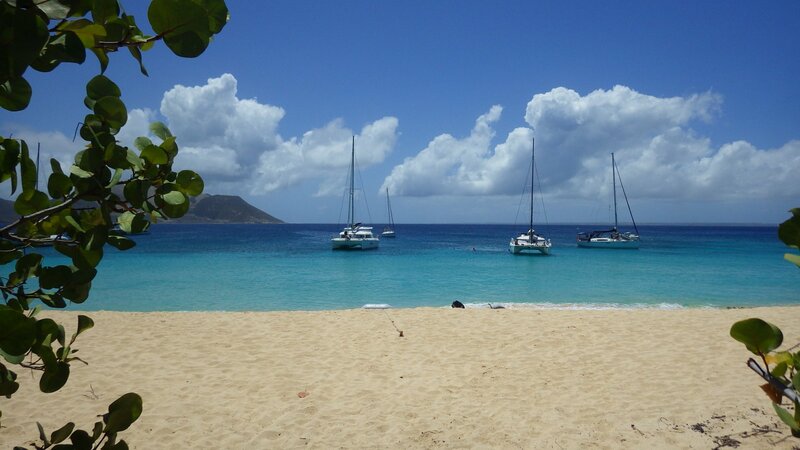 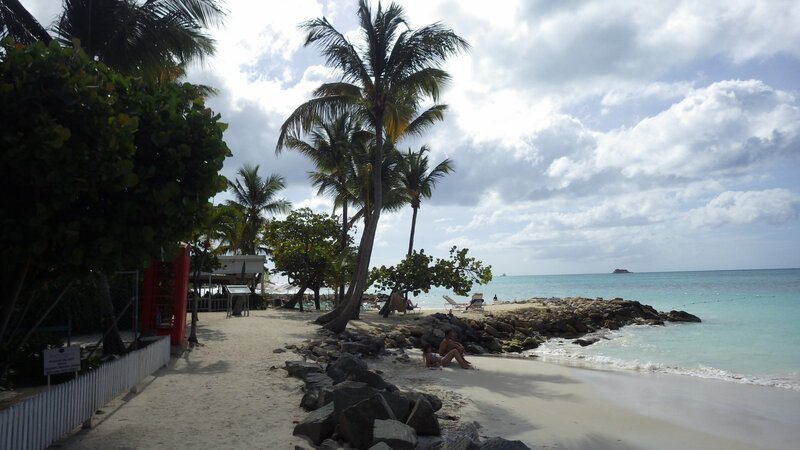 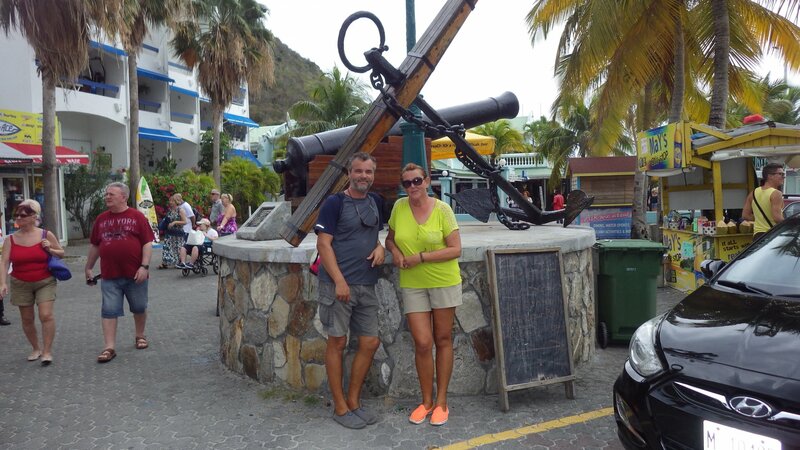 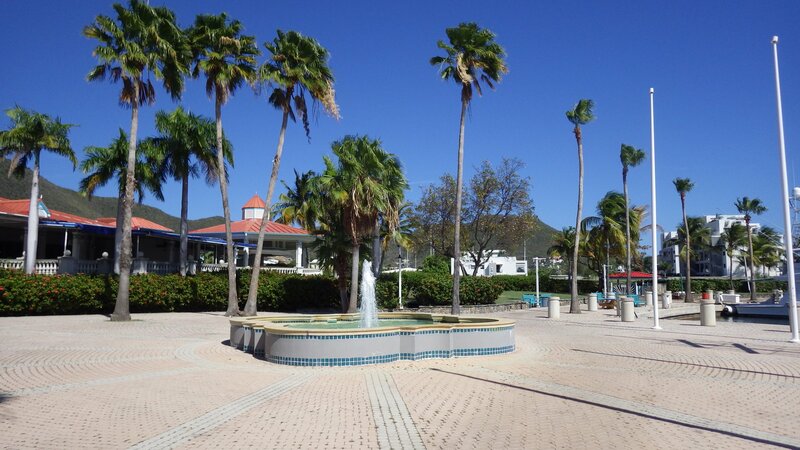 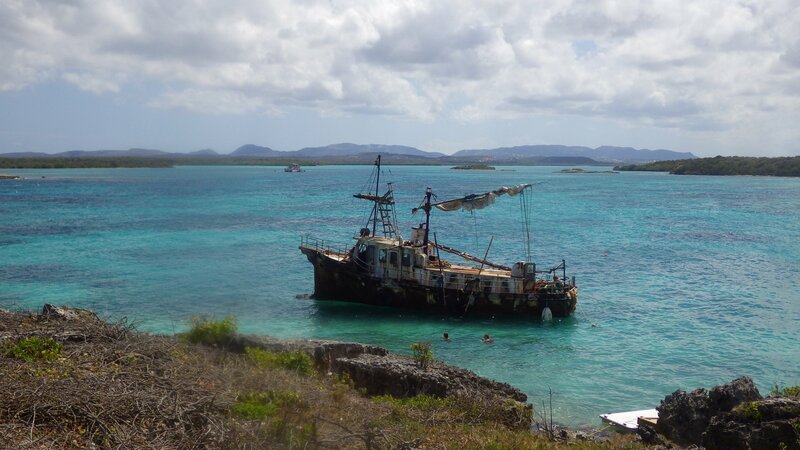 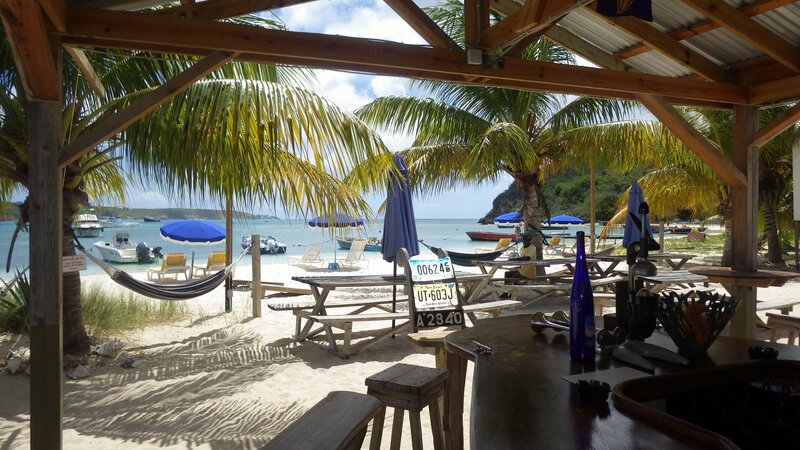 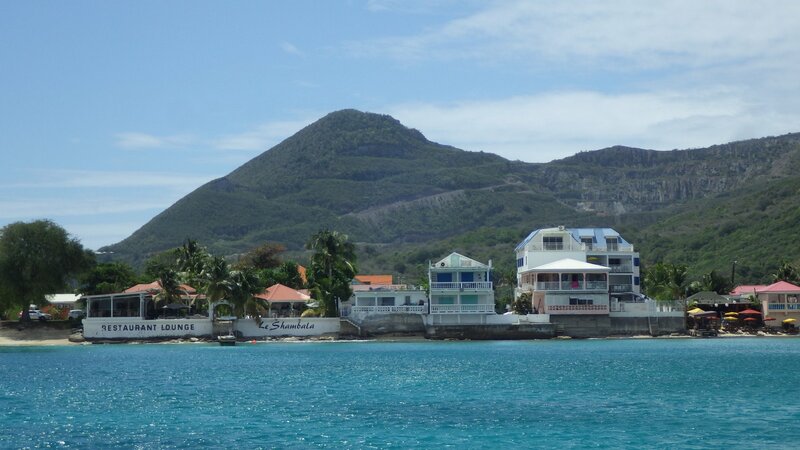 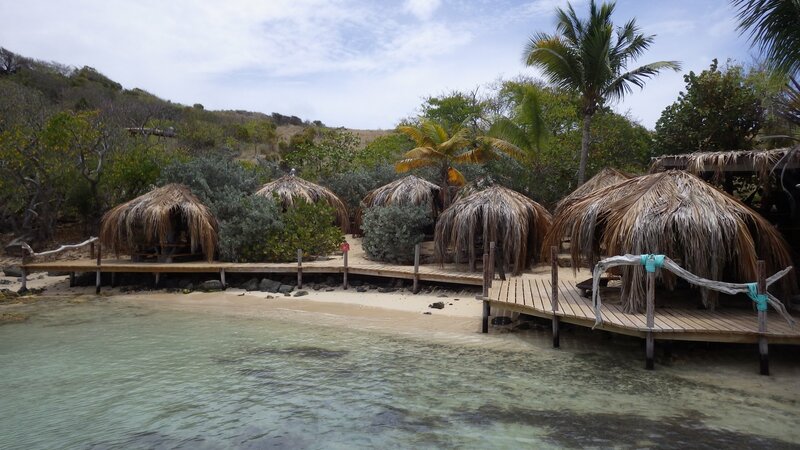 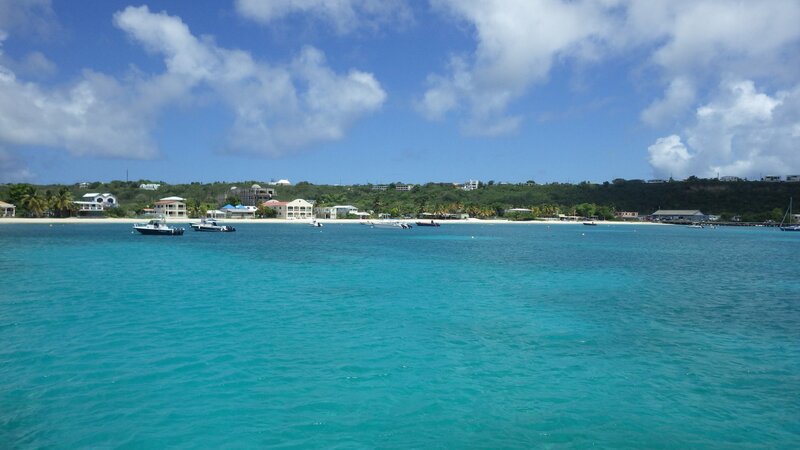 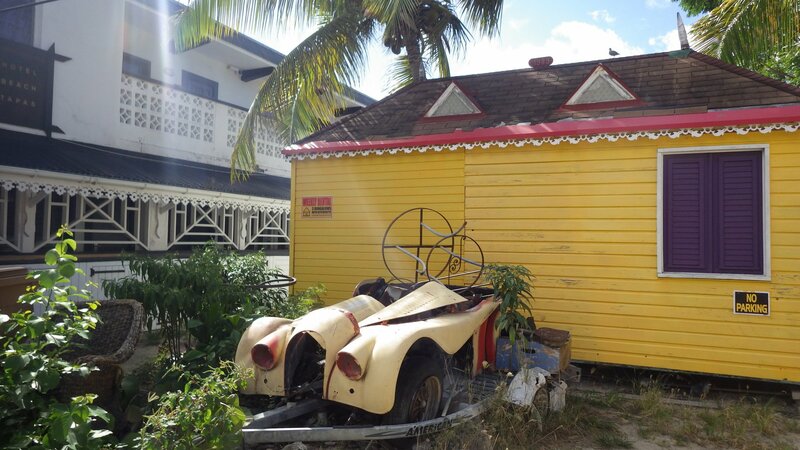 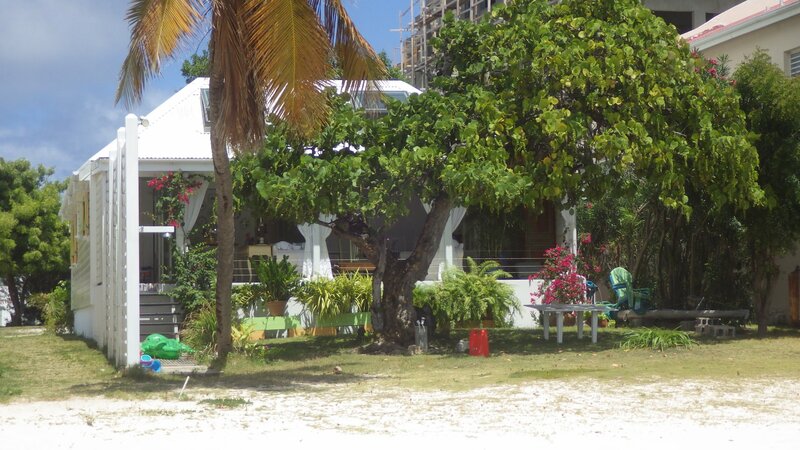 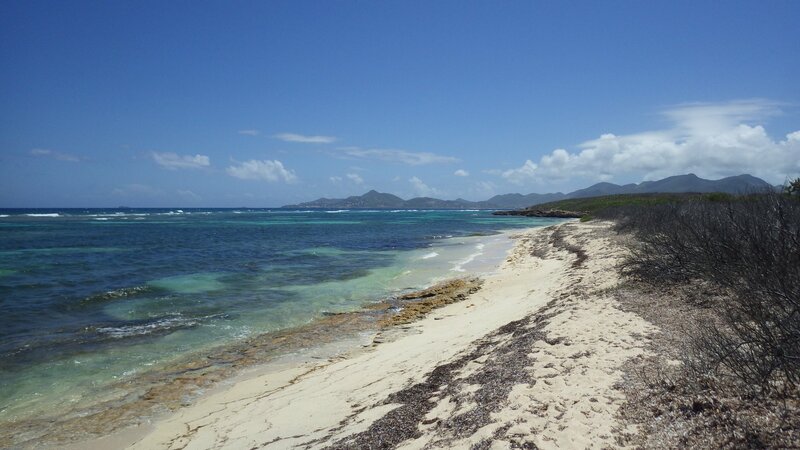 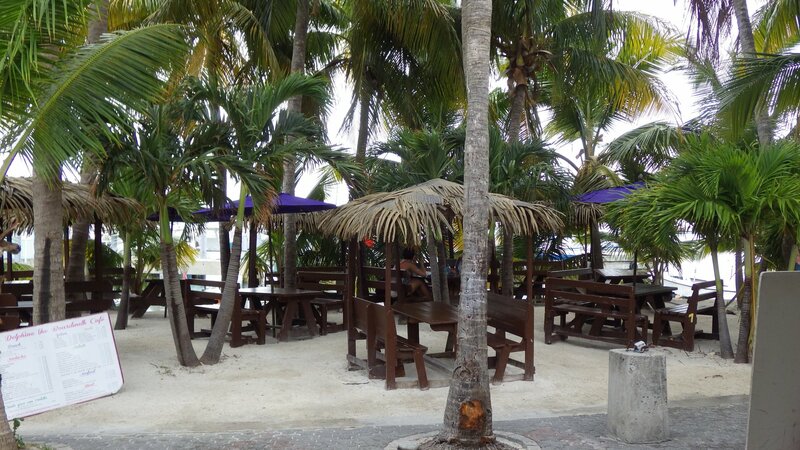 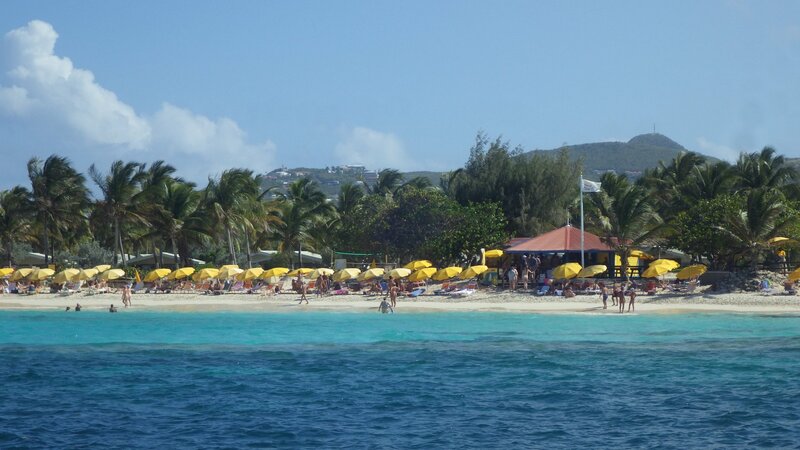 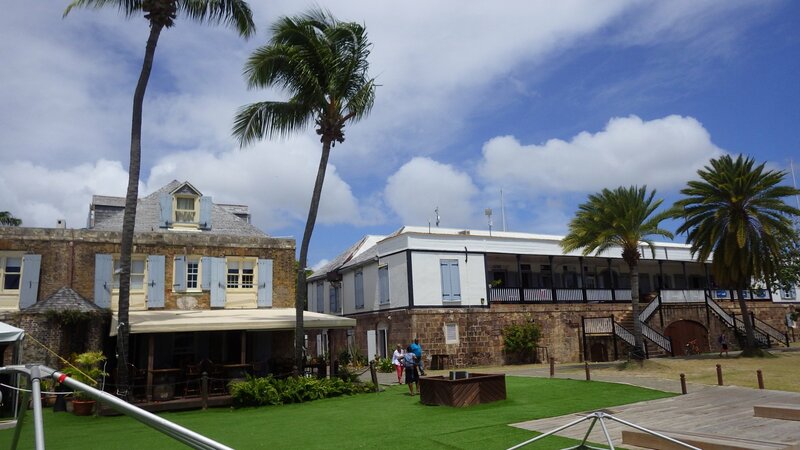 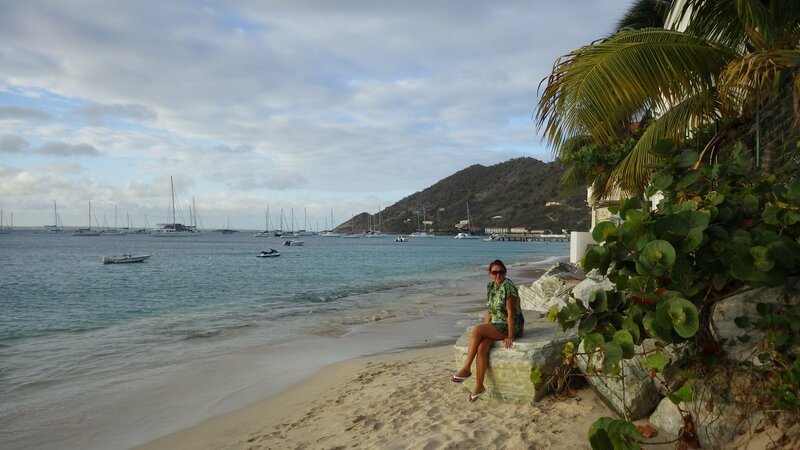 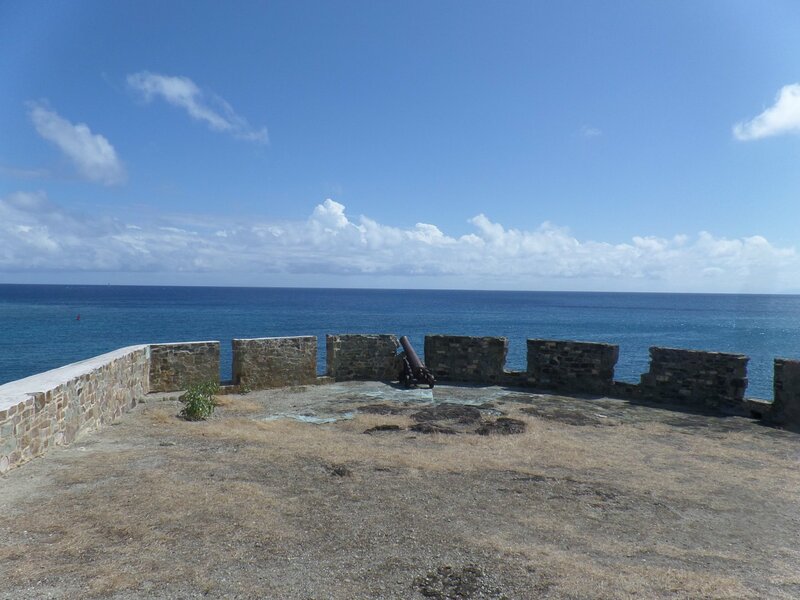 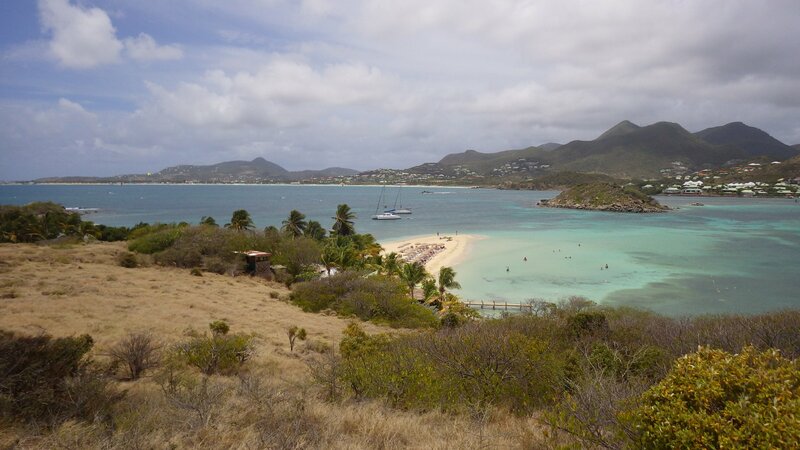 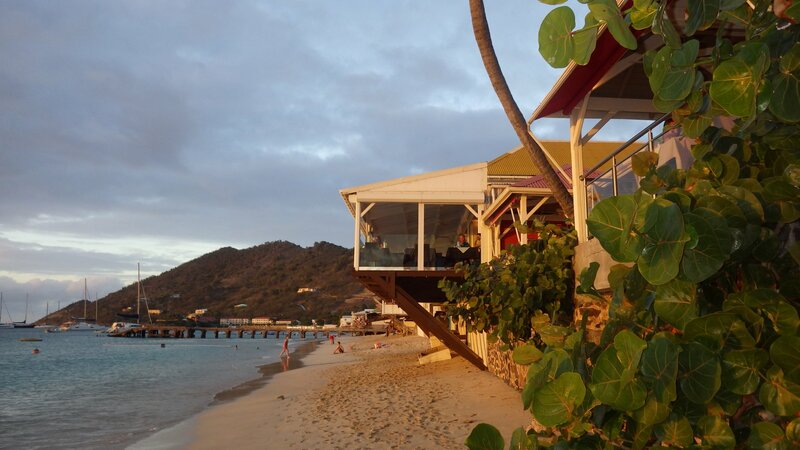 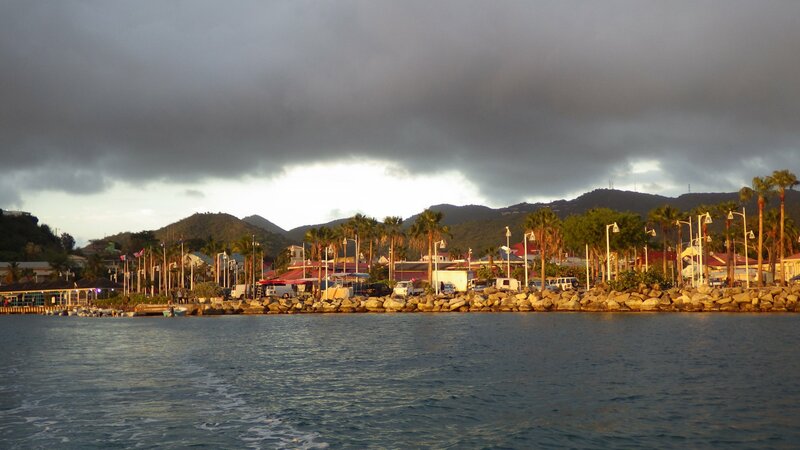 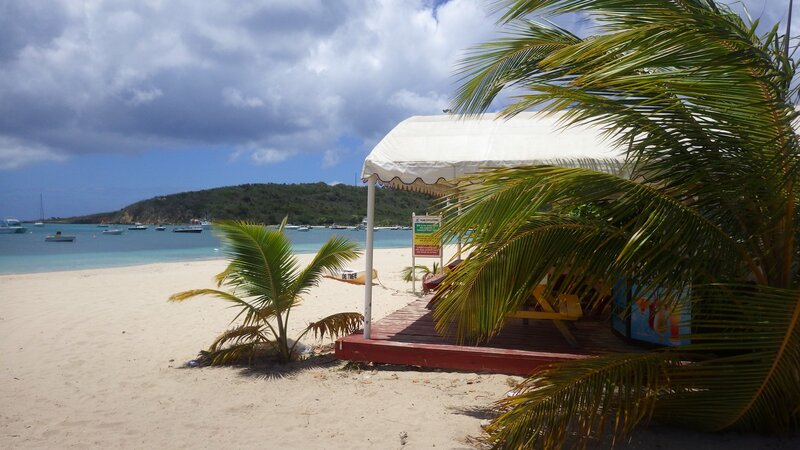 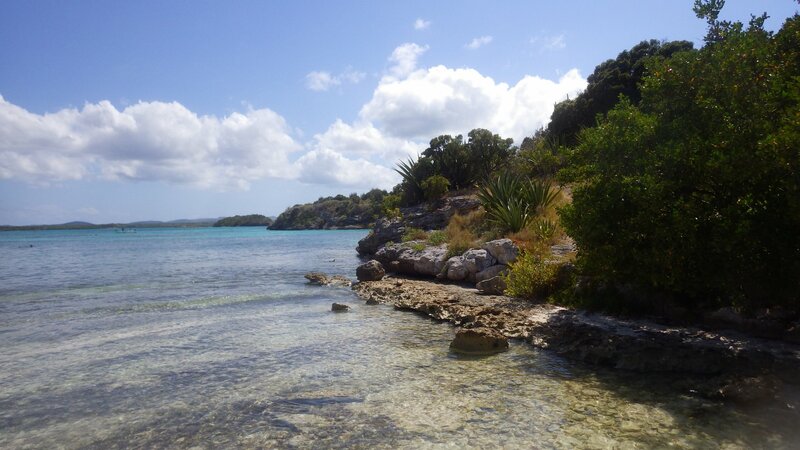 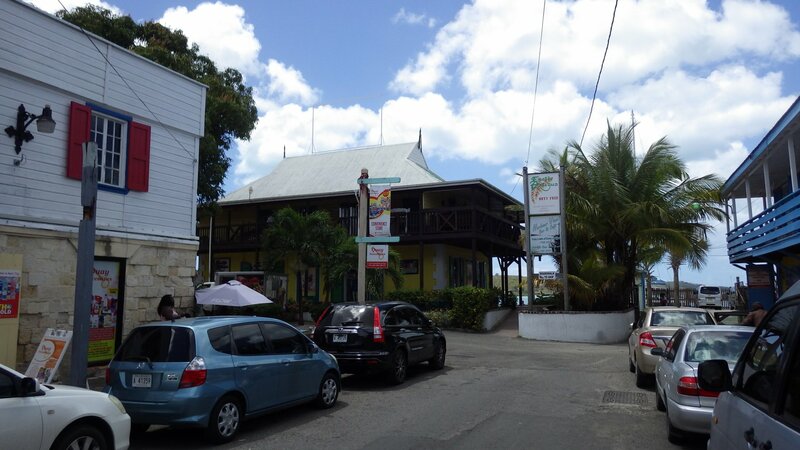 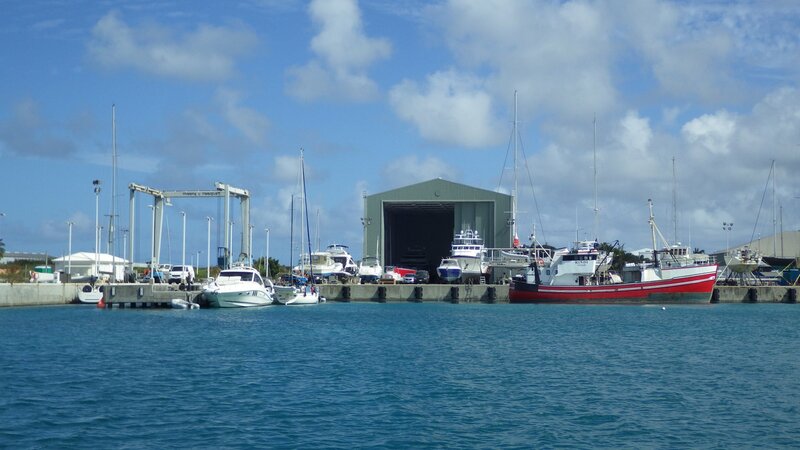 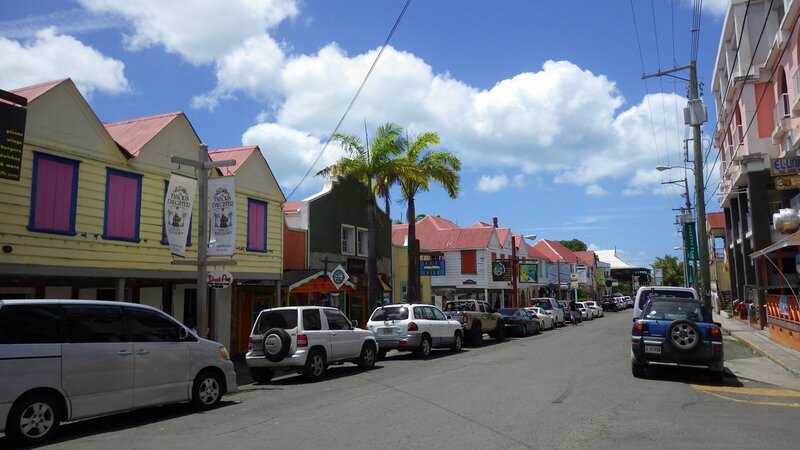 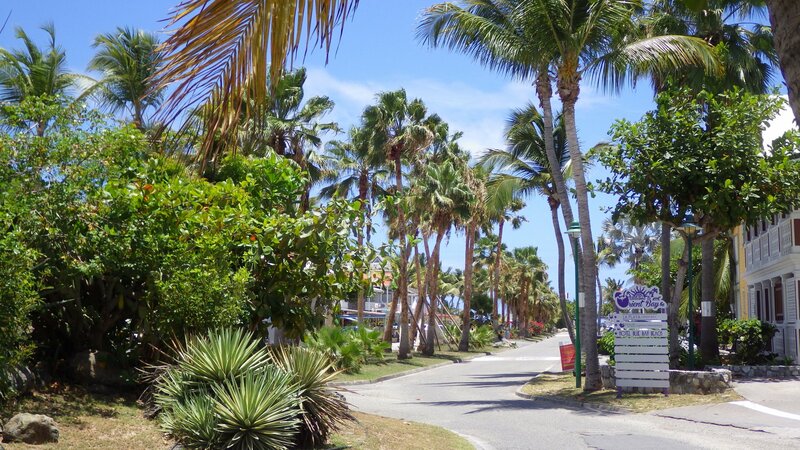 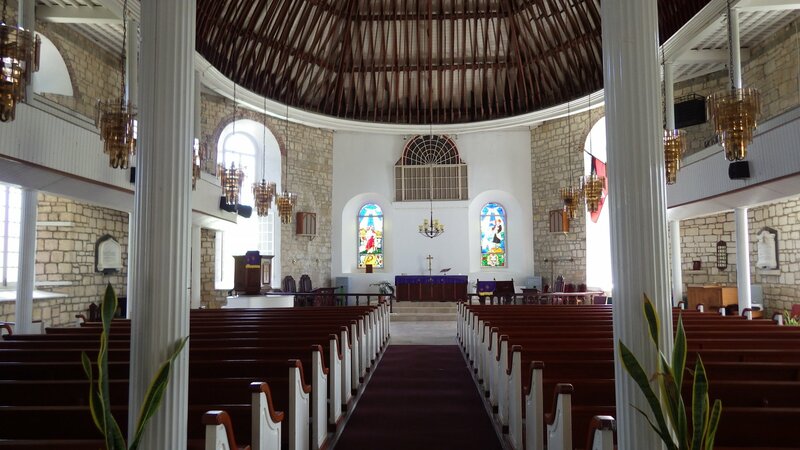 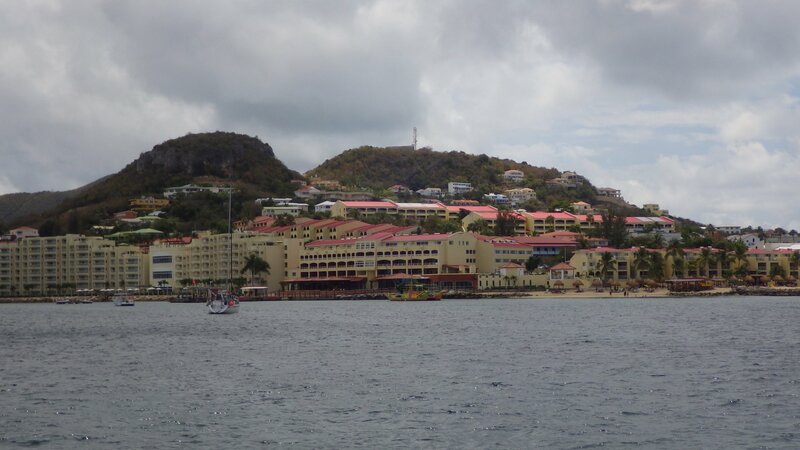 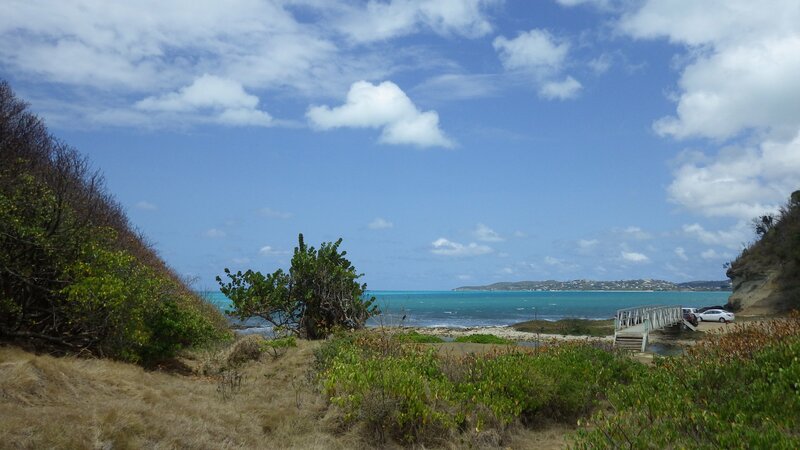 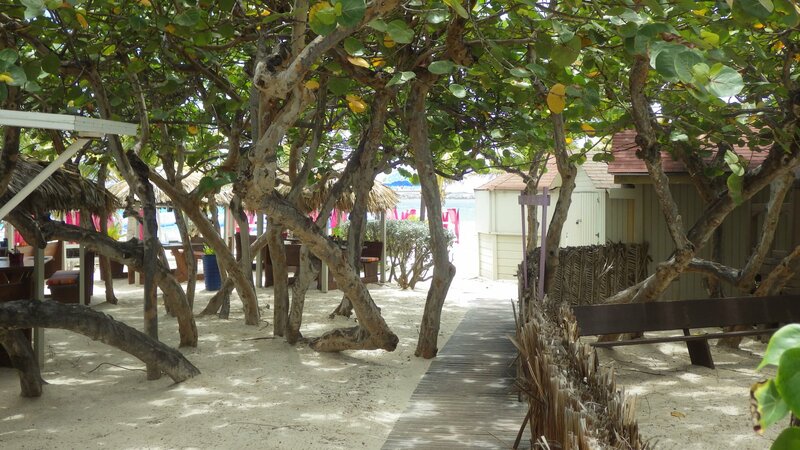 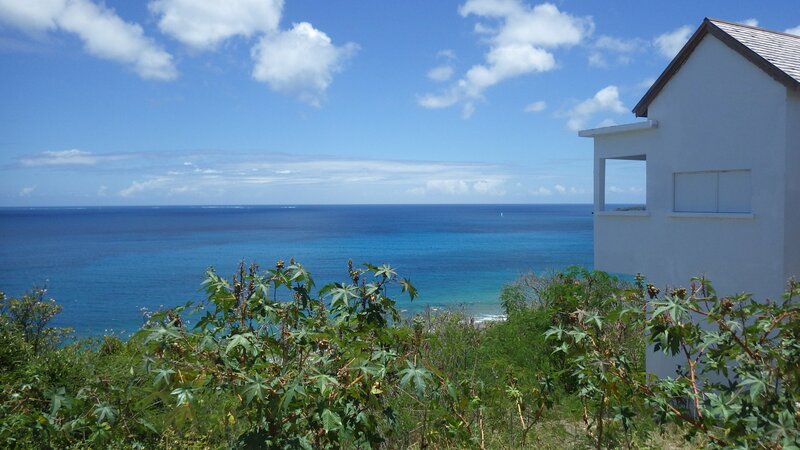 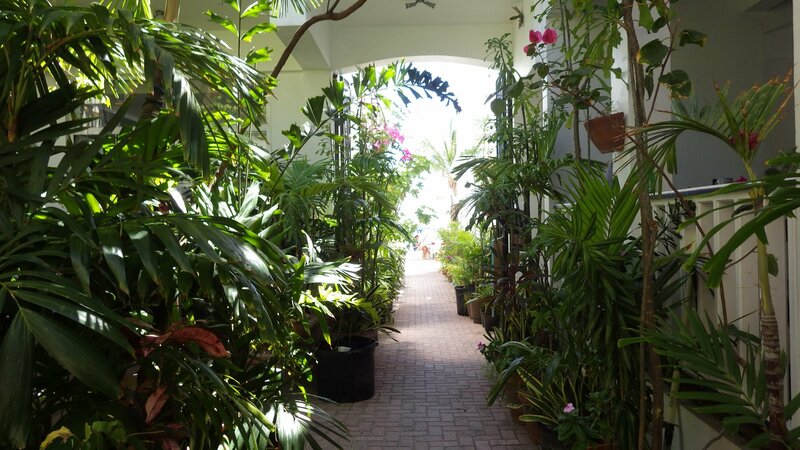 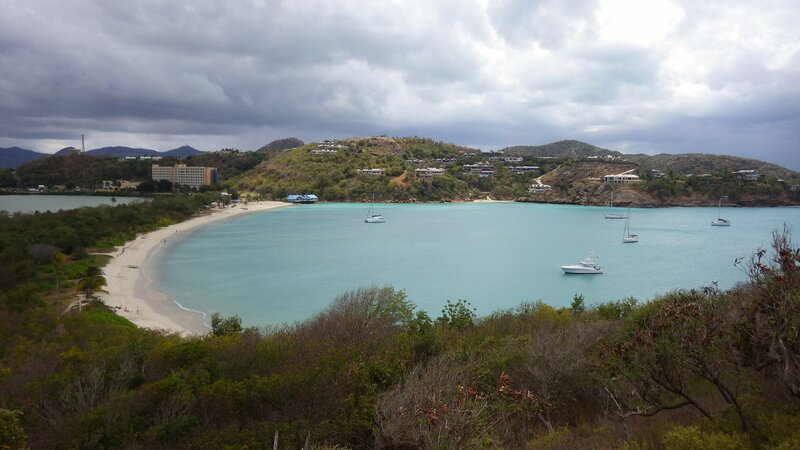 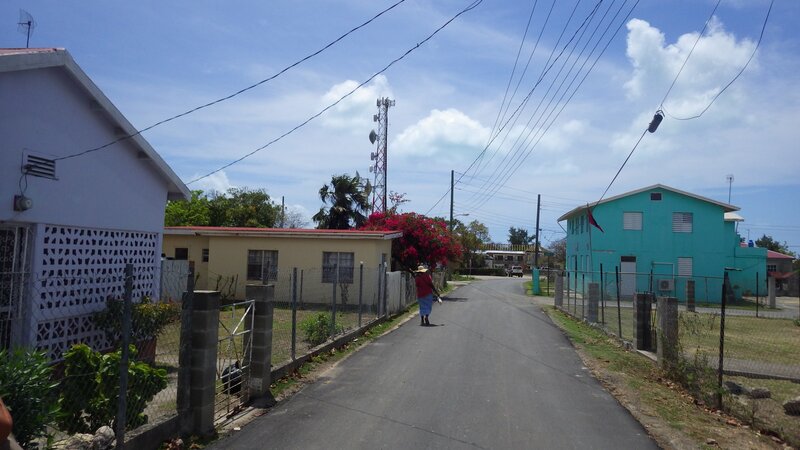 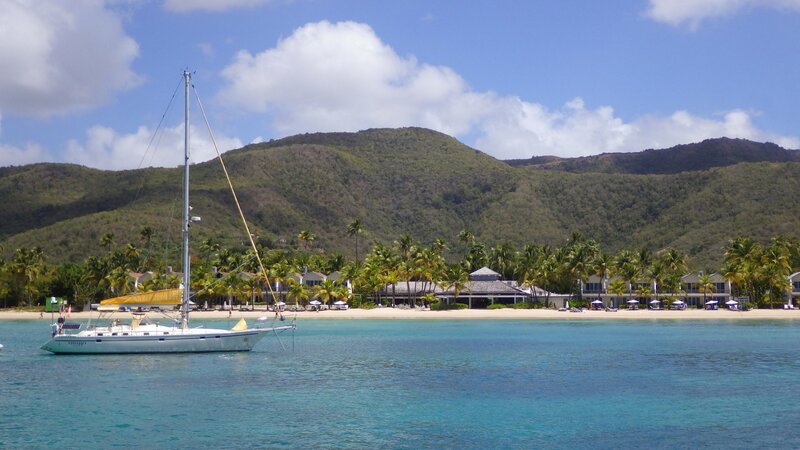 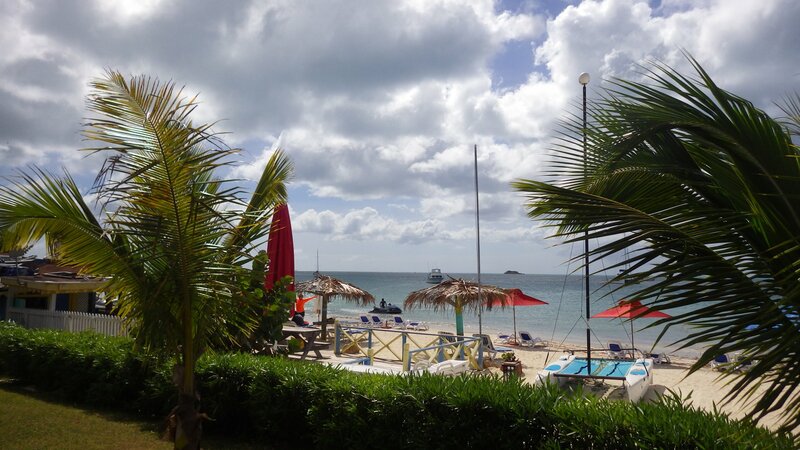 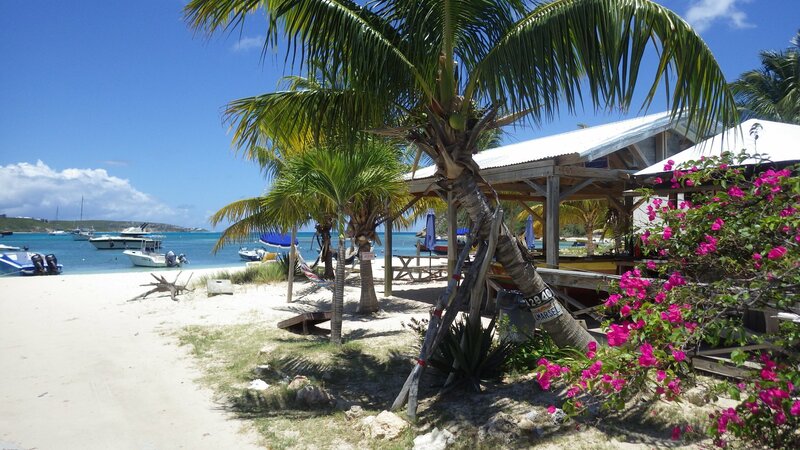 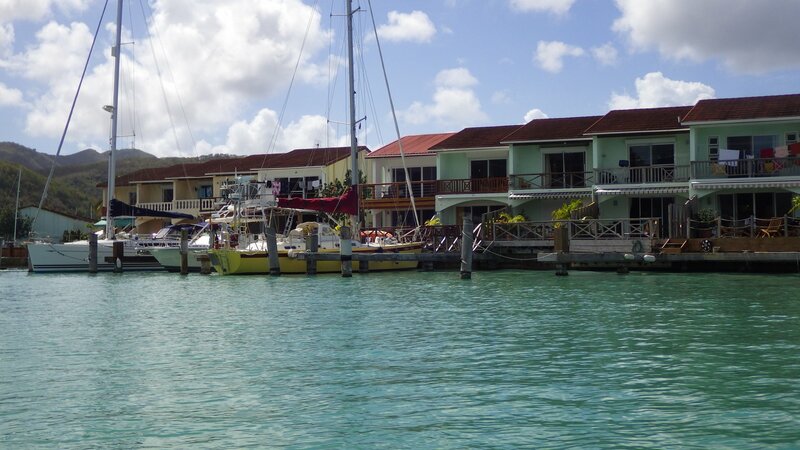 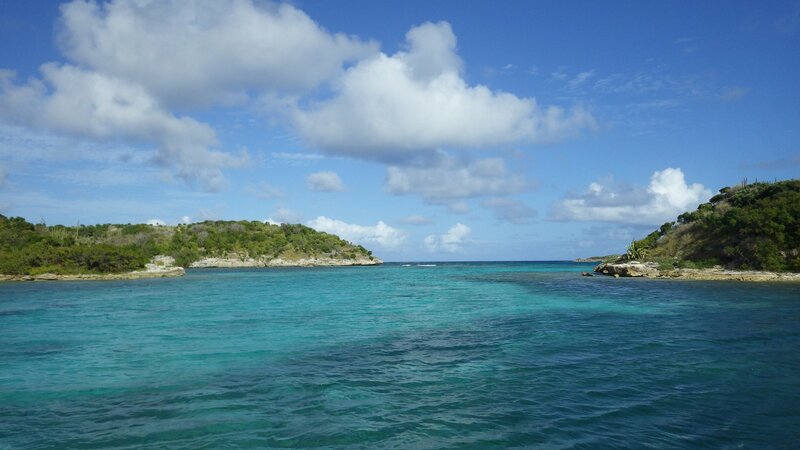 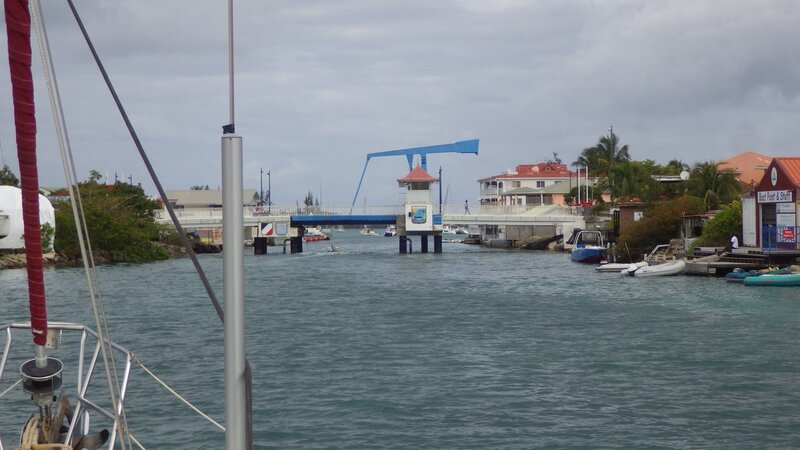 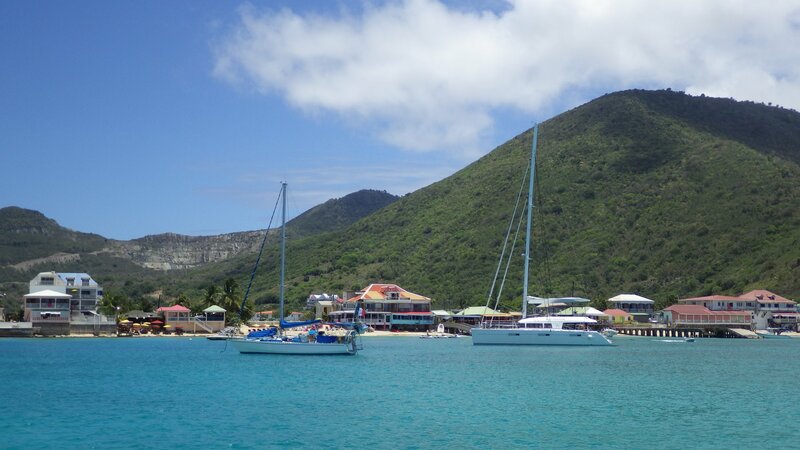 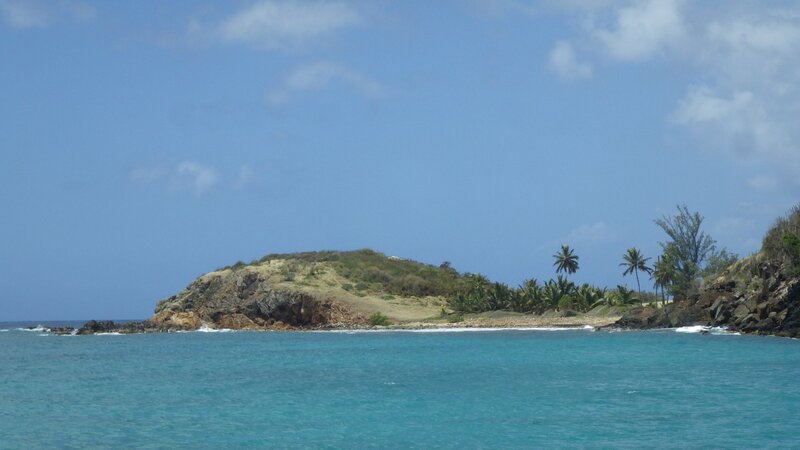 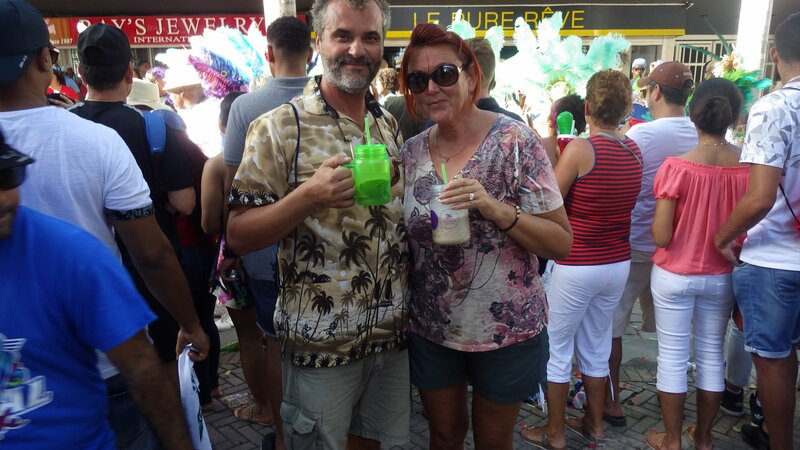 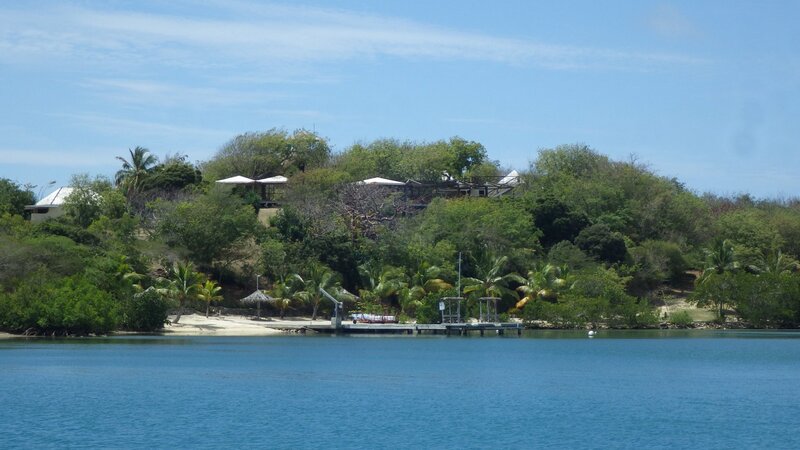 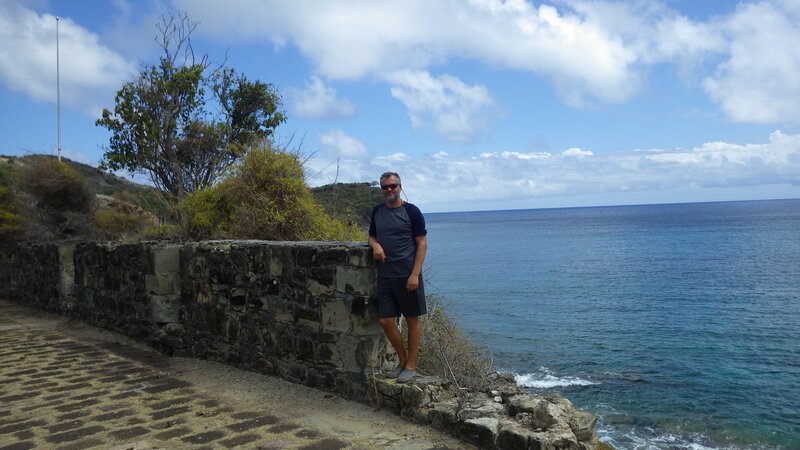 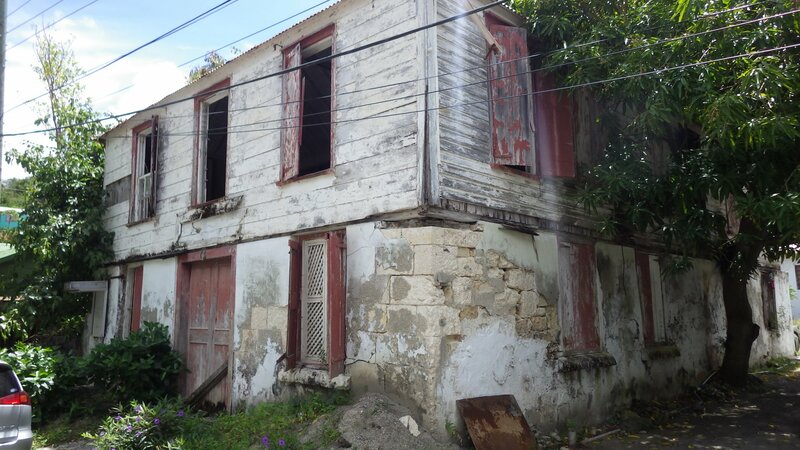 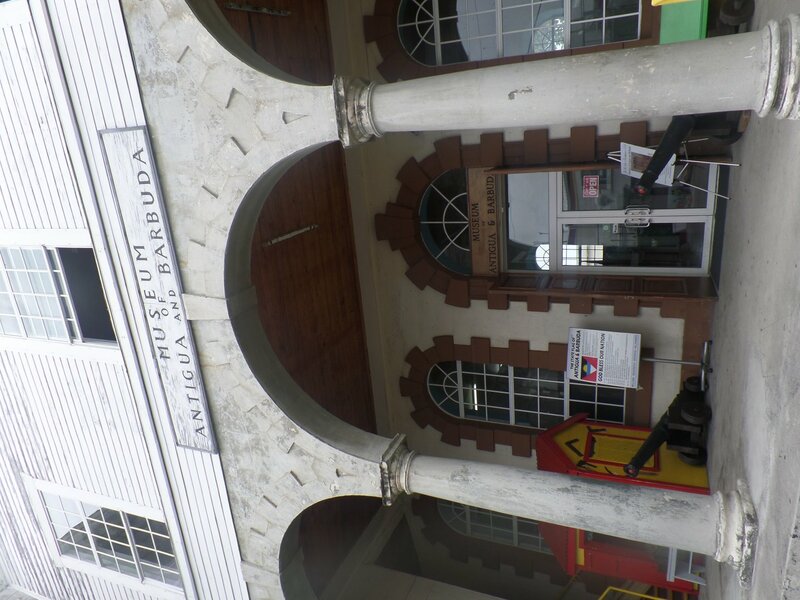 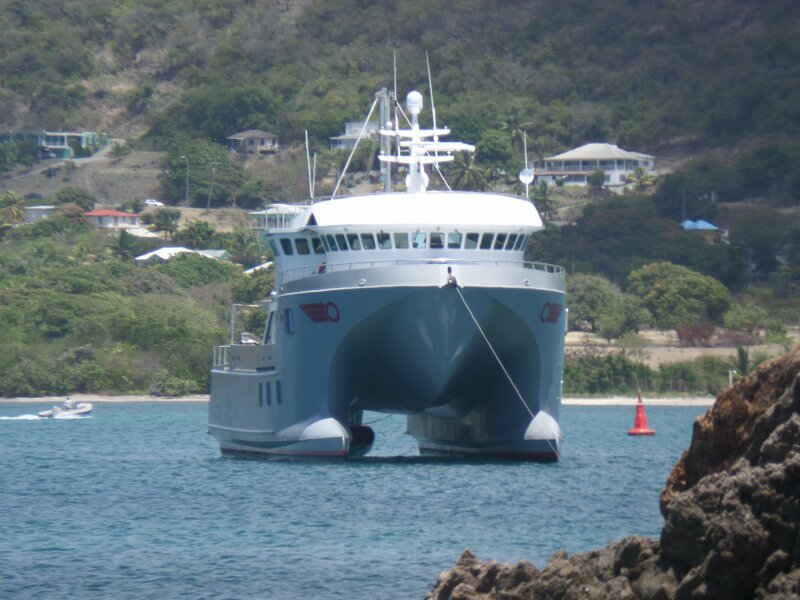 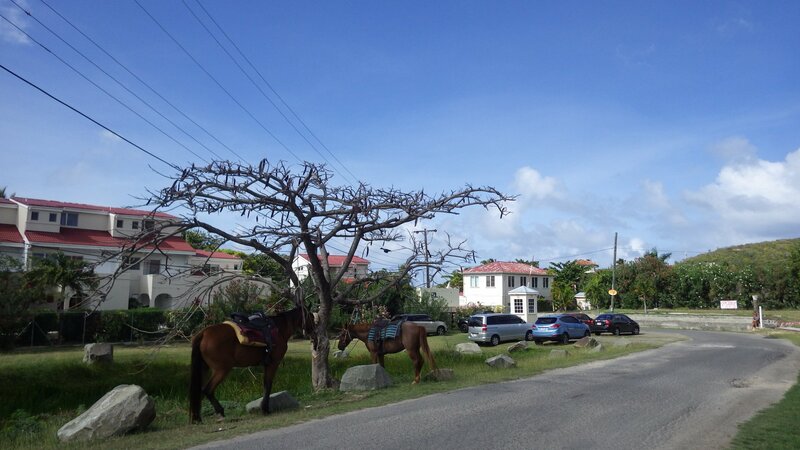 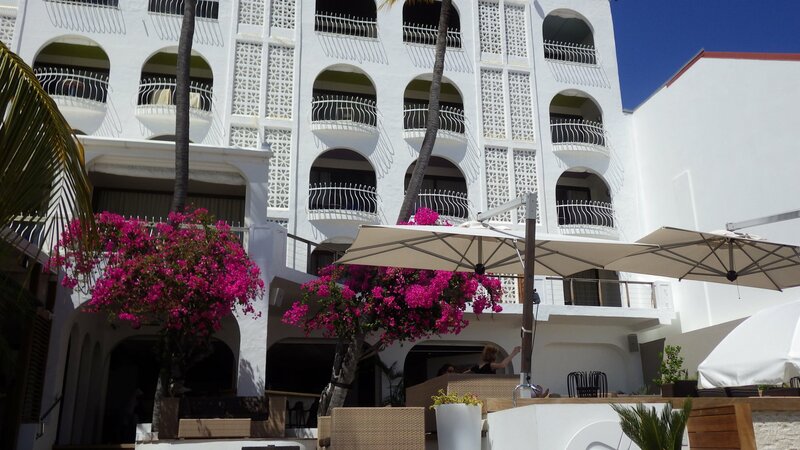 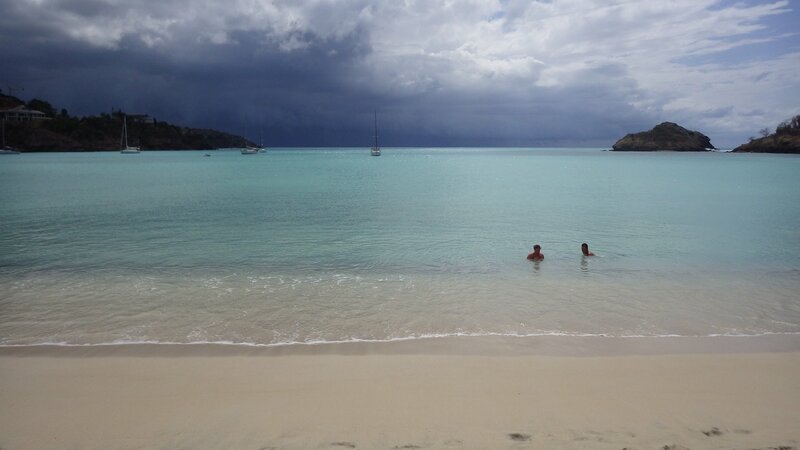 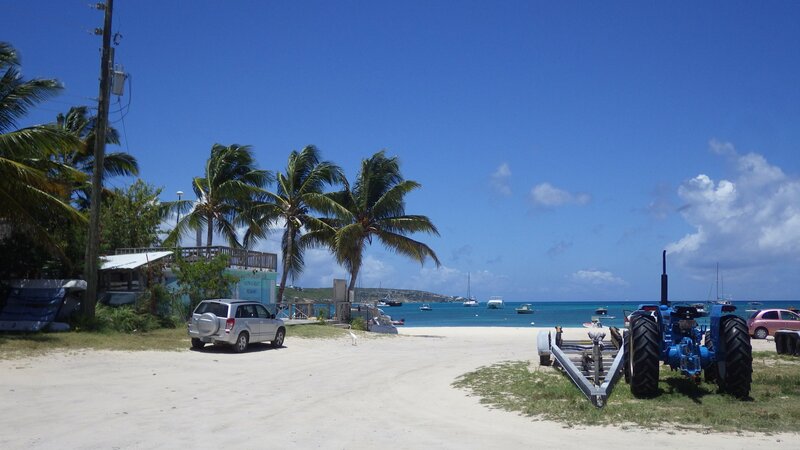 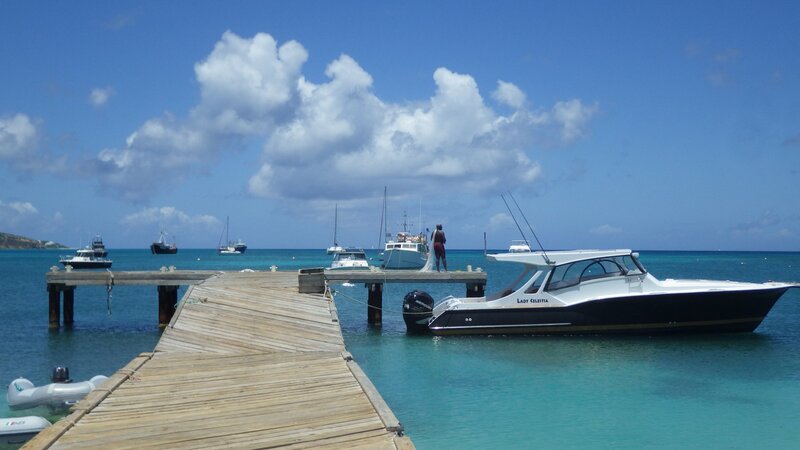 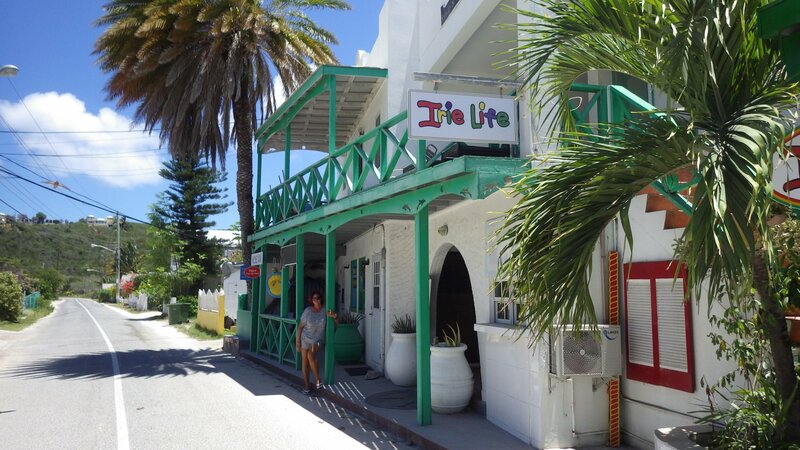 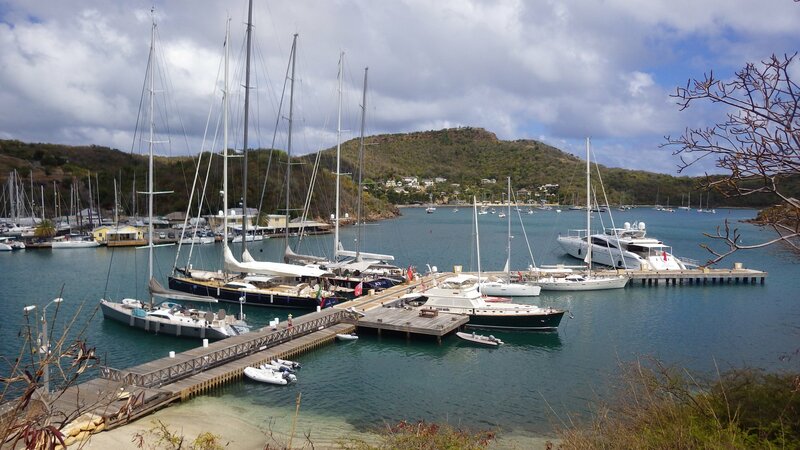 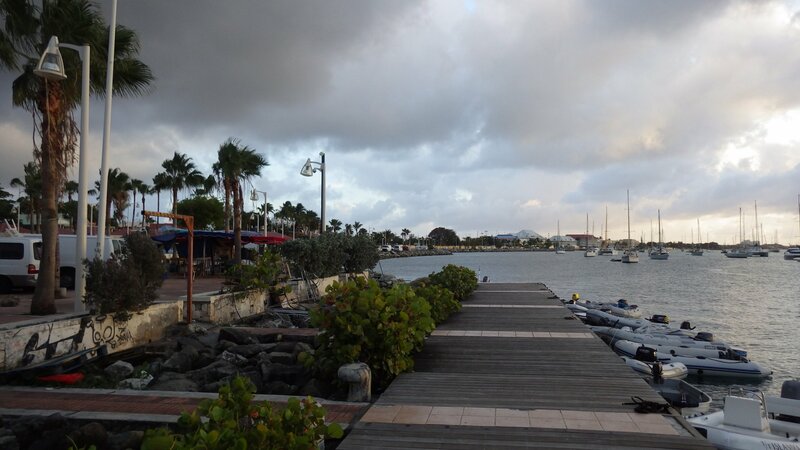 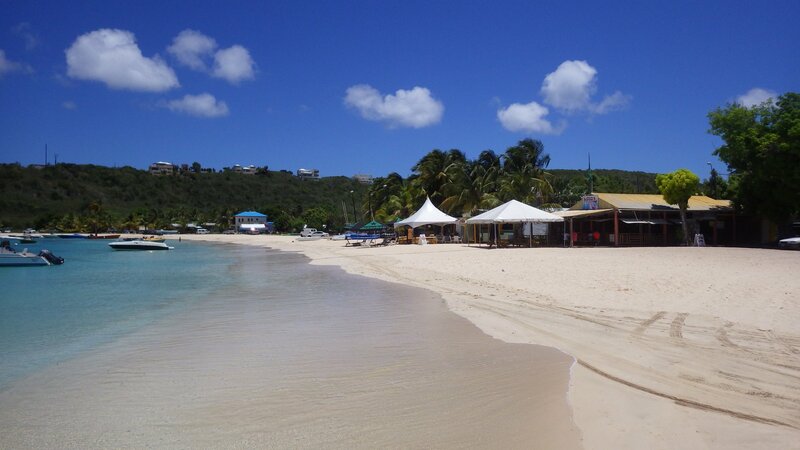 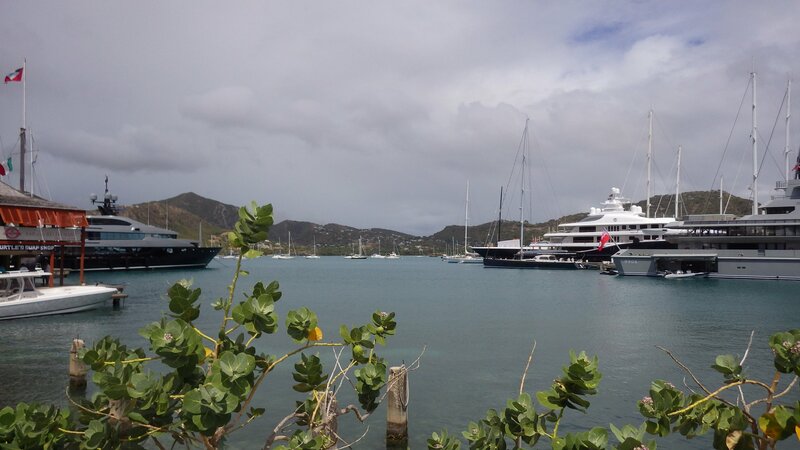 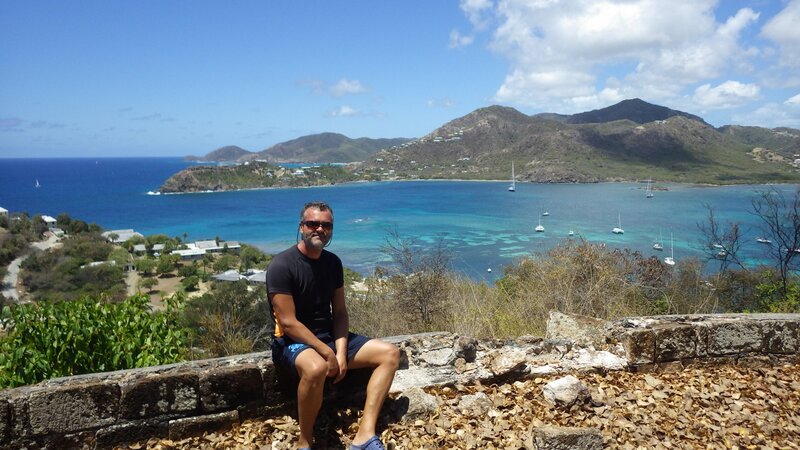 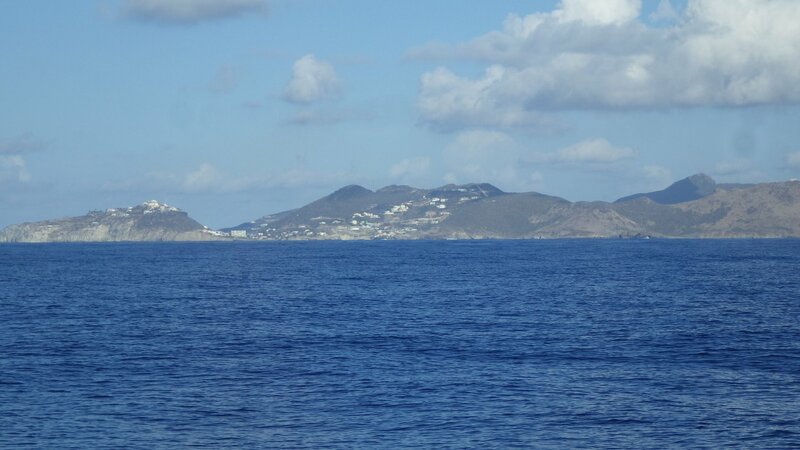 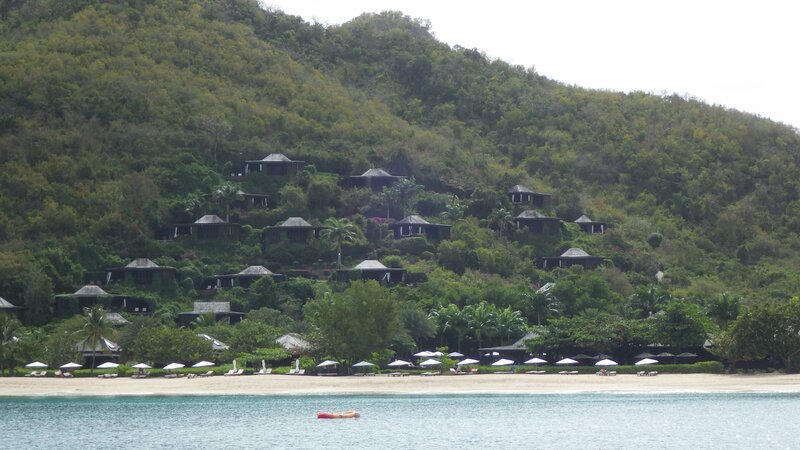 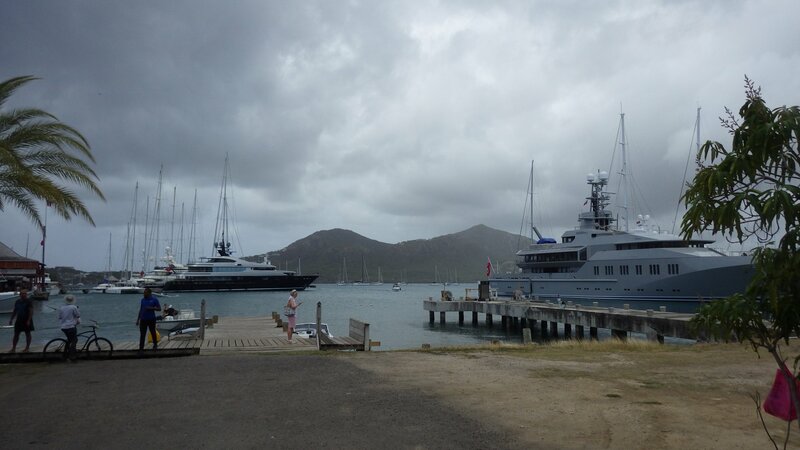 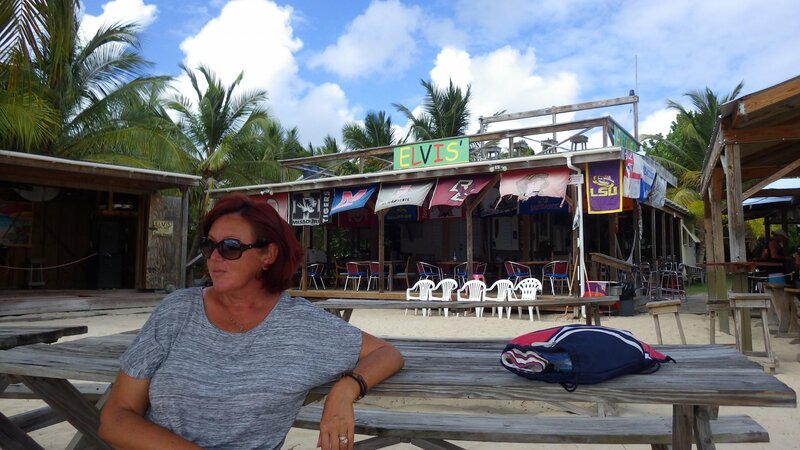 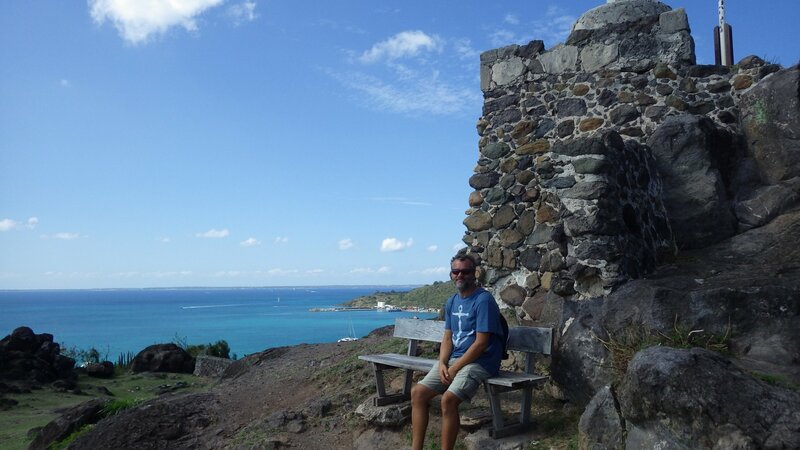 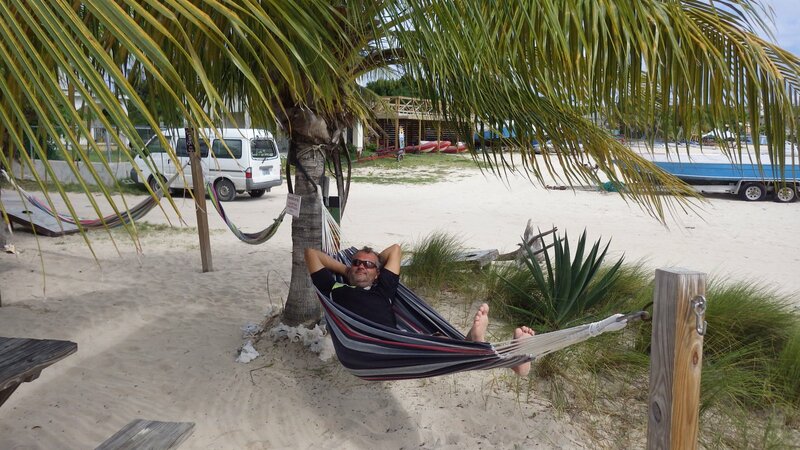 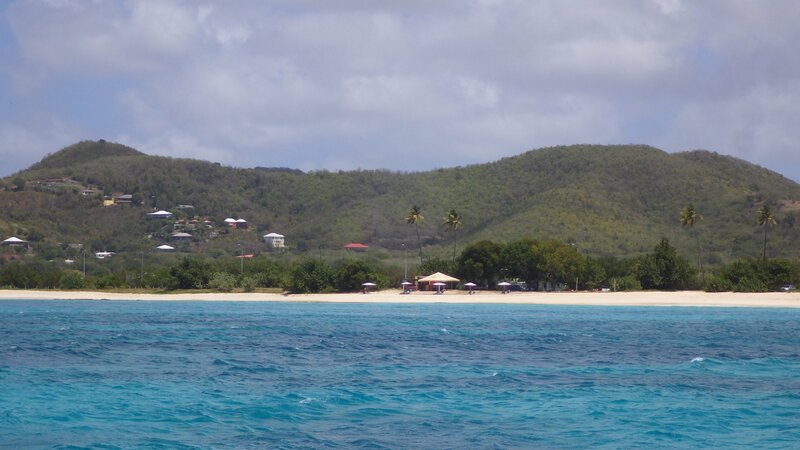 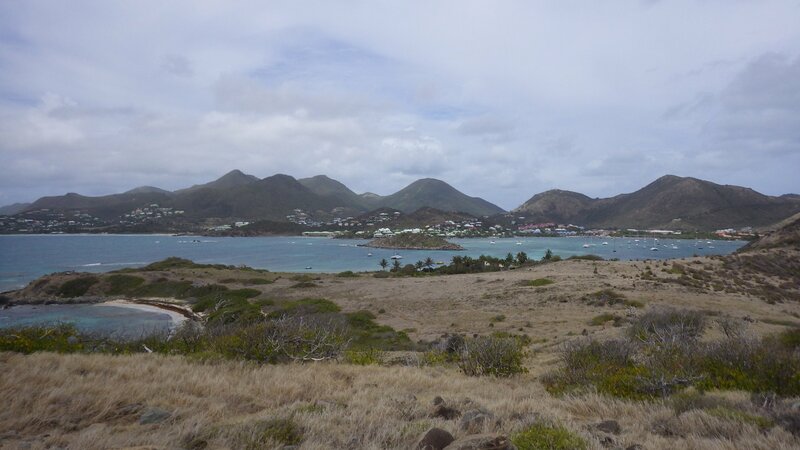 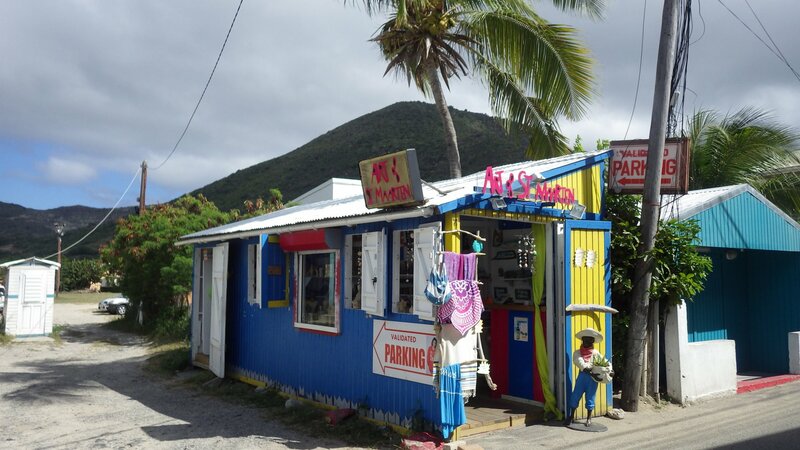 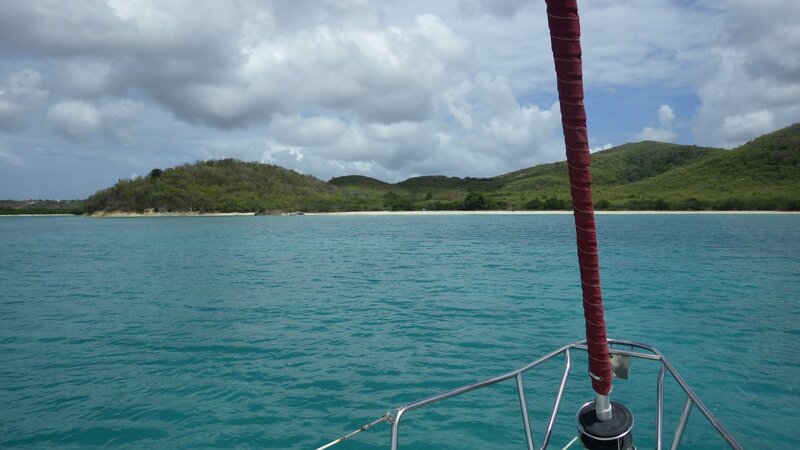 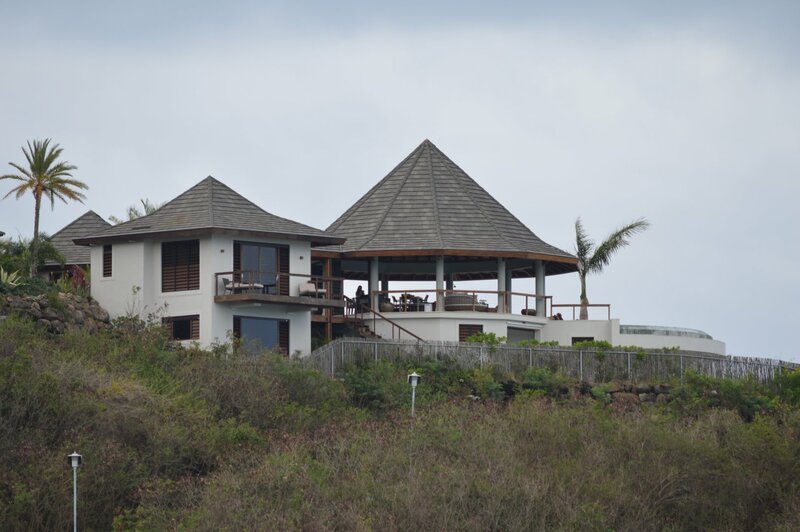 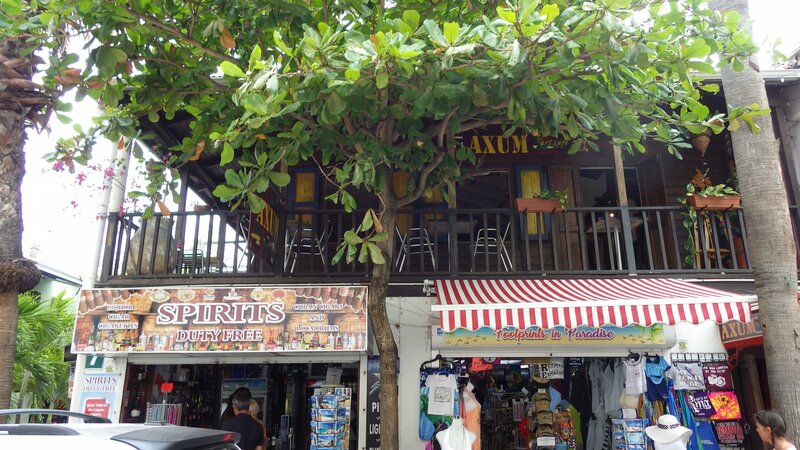 During our first visit to St. Martin last year, we stayed mostly on the Dutch side. 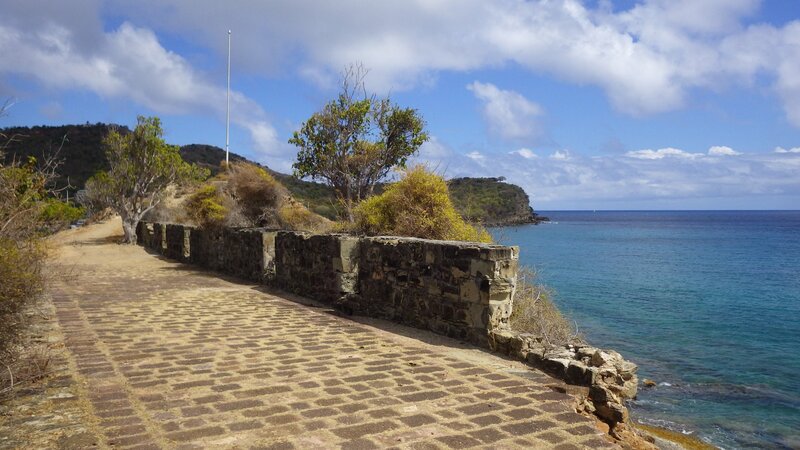 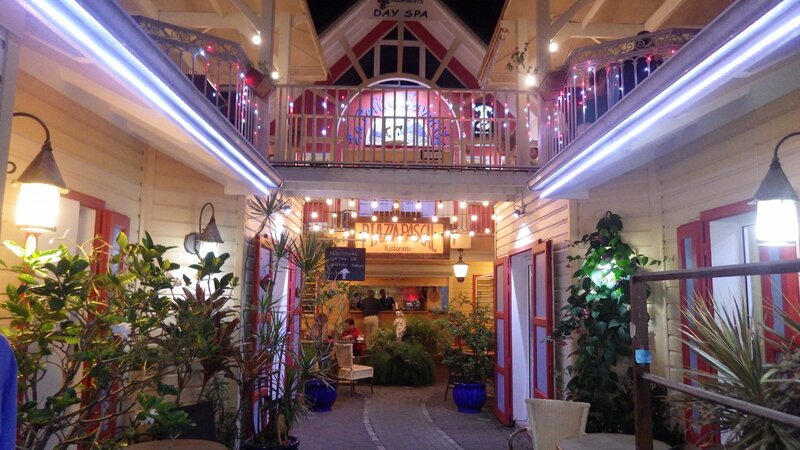 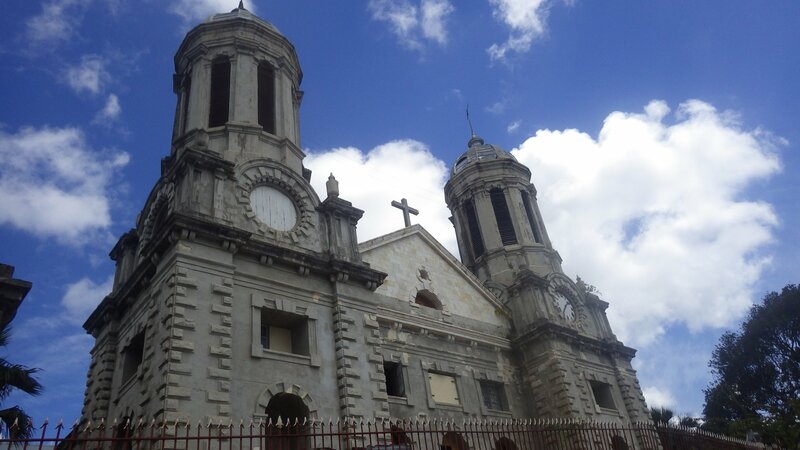 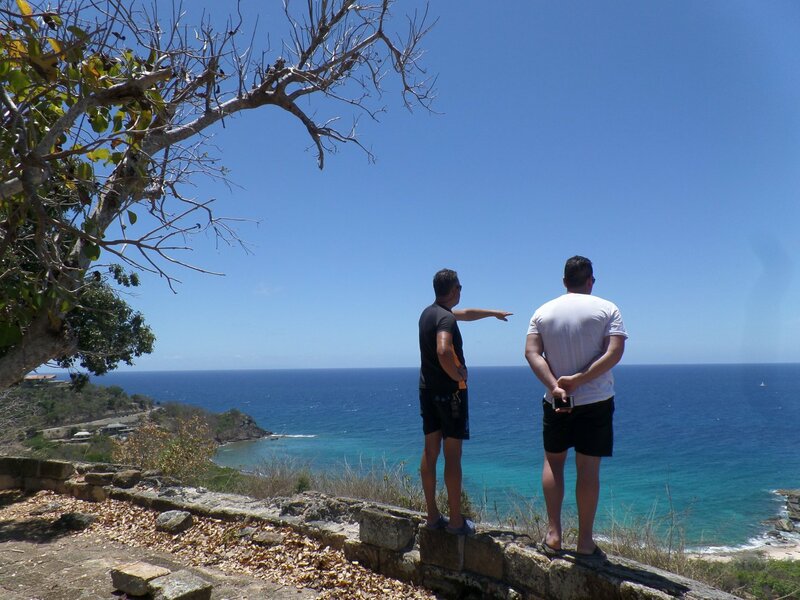 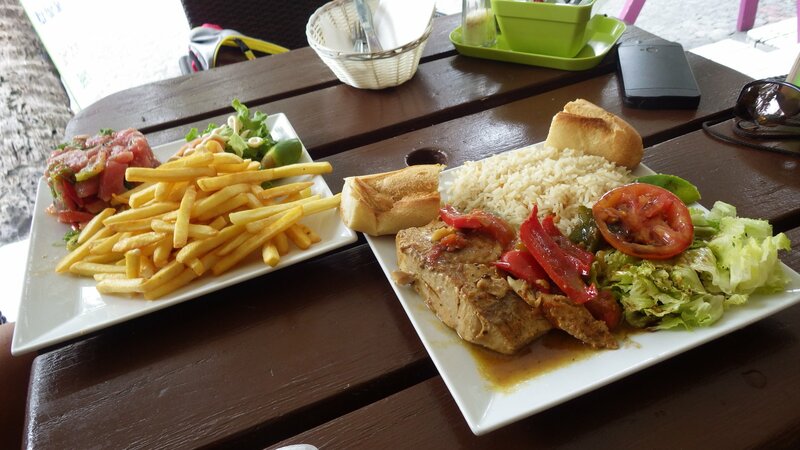 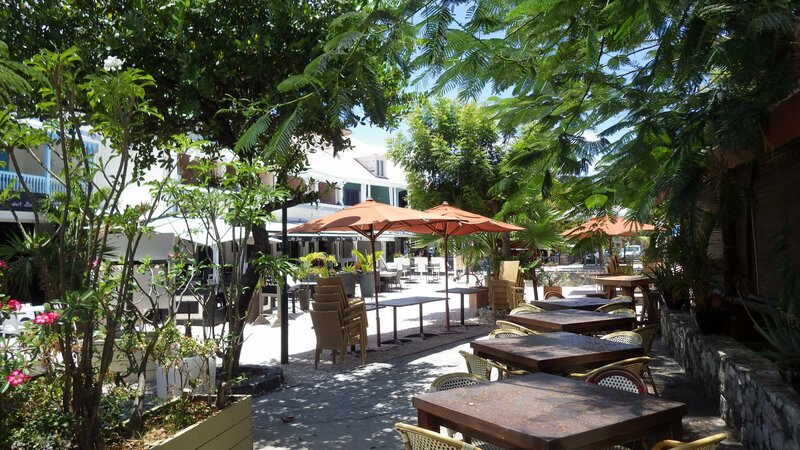 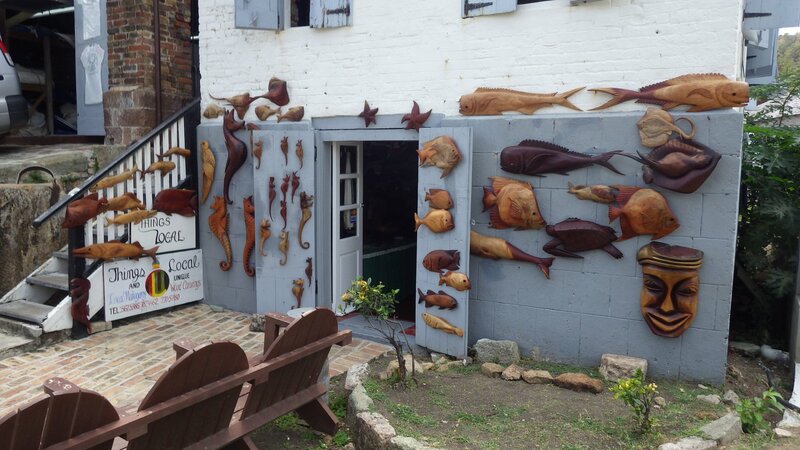 This time, we wanted to explore more the French side of the island. 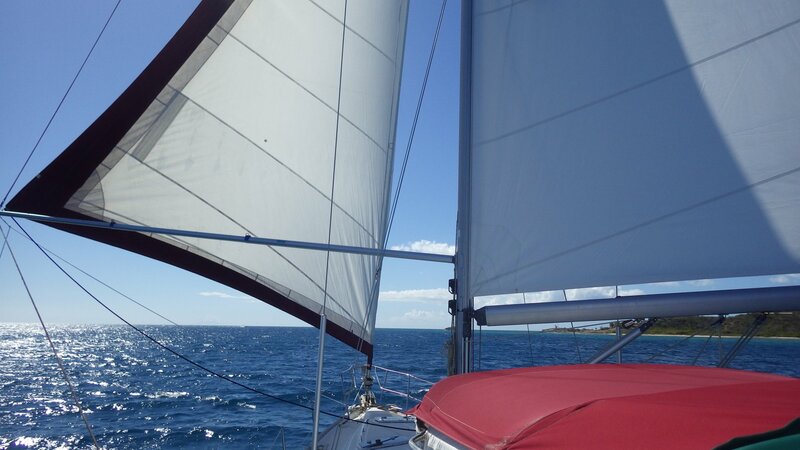 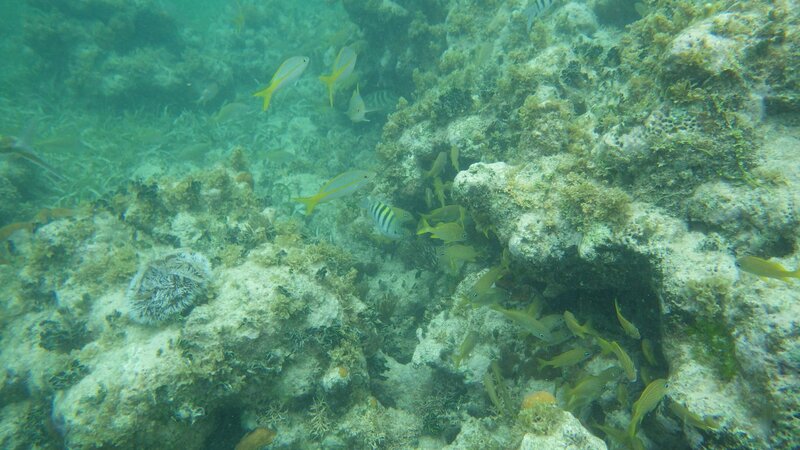 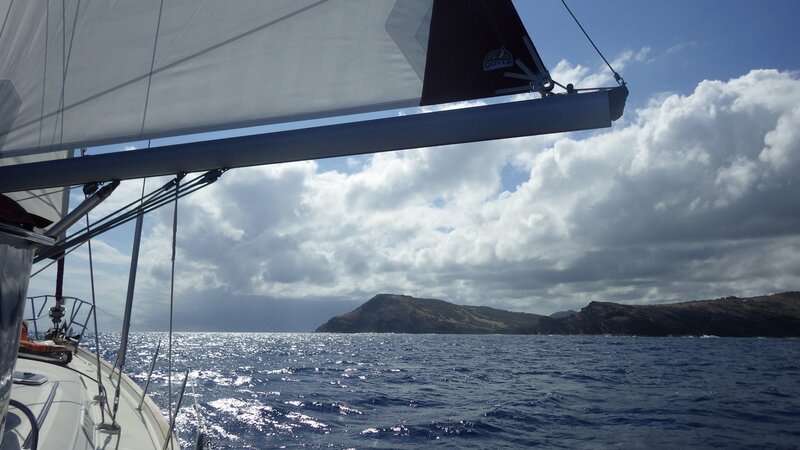 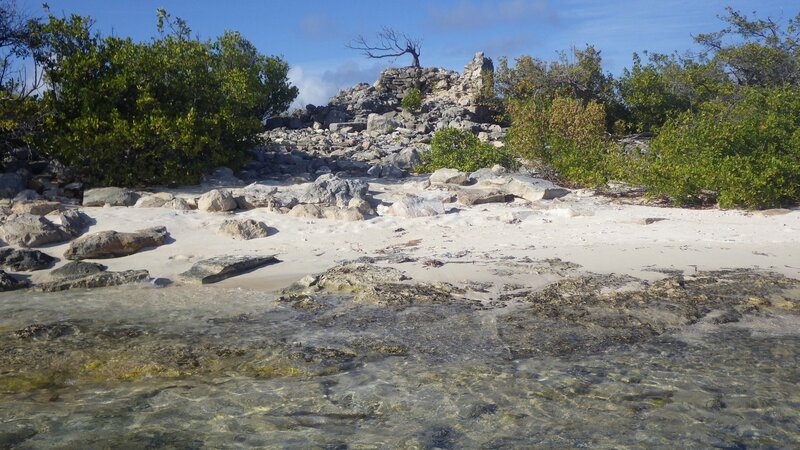 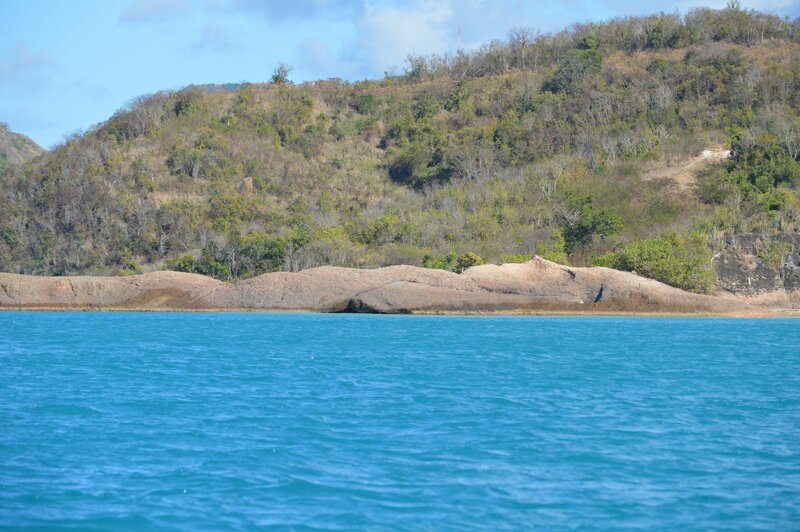 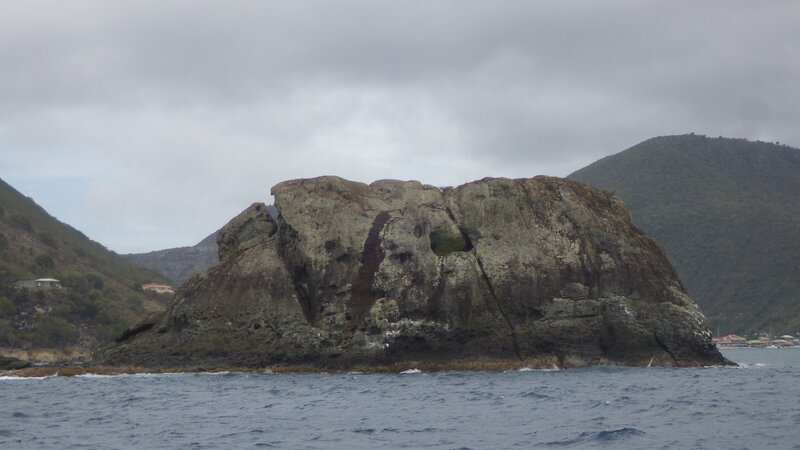 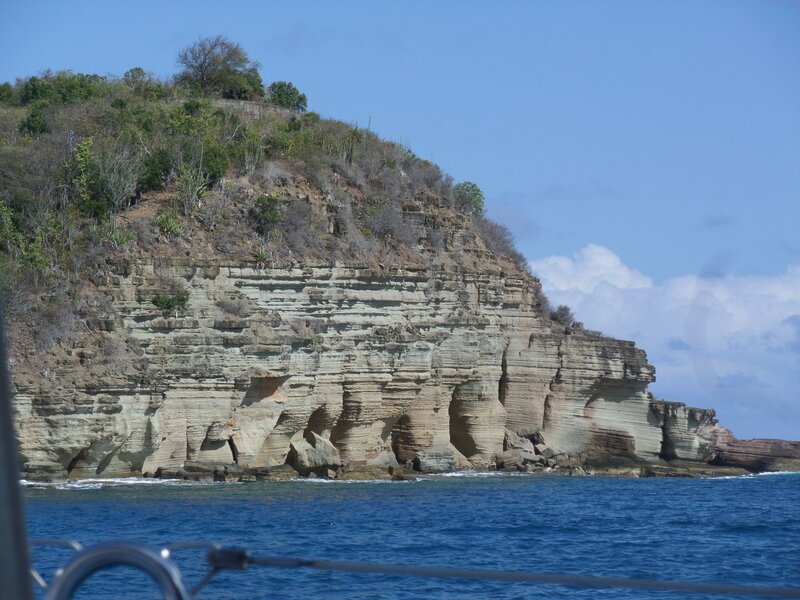 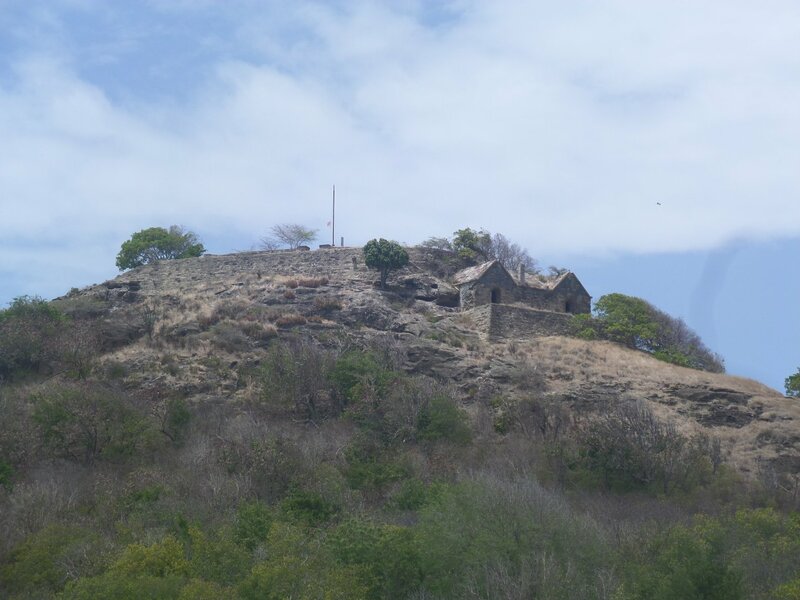 We stayed some time near Marigot, and then sailed along the shore around the north of the island, visiting interesting places. 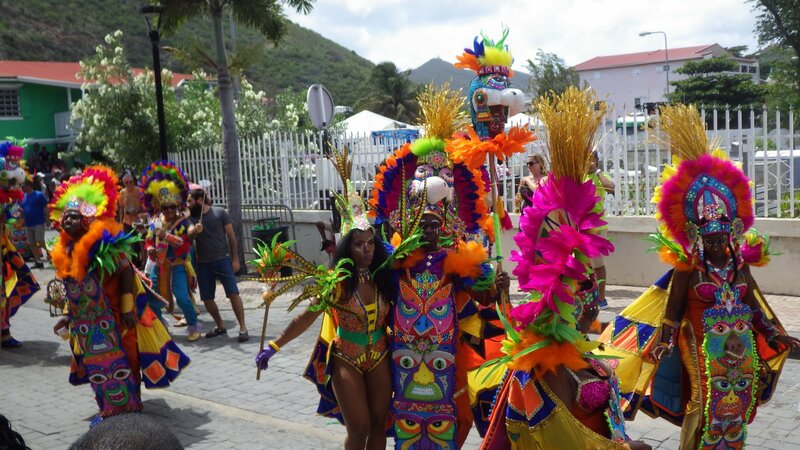 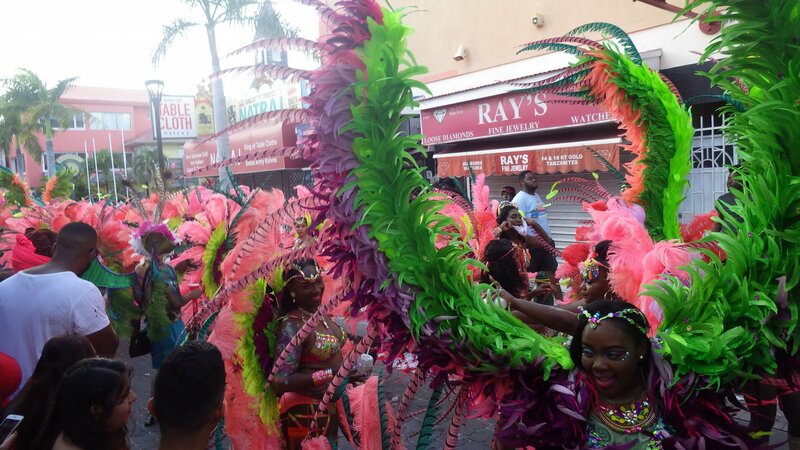 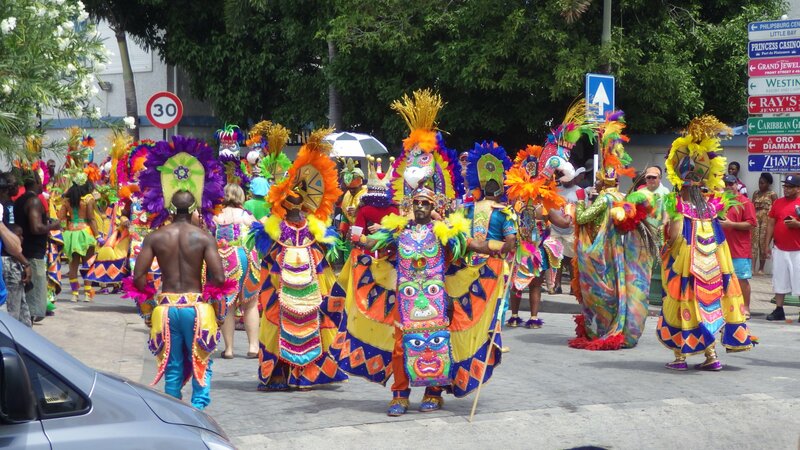 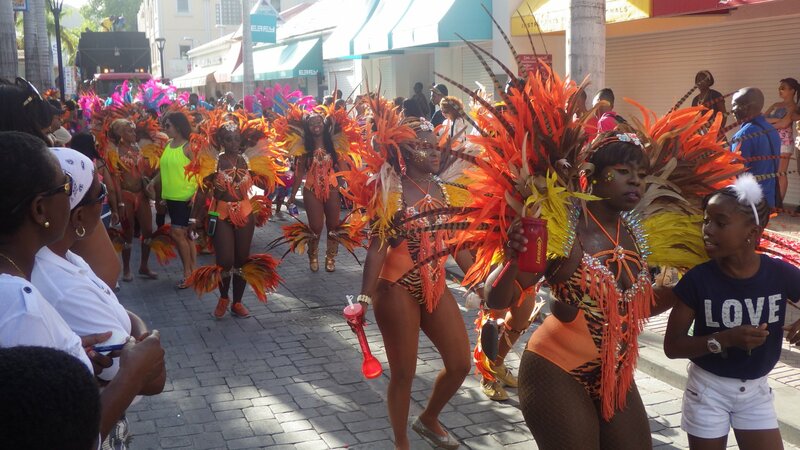 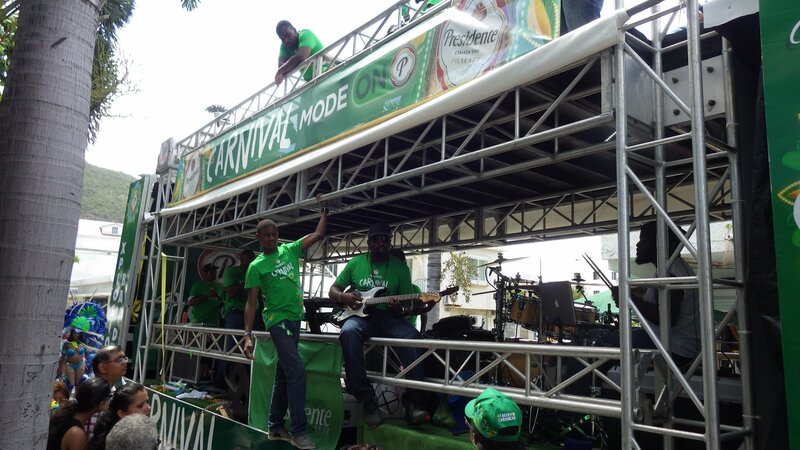 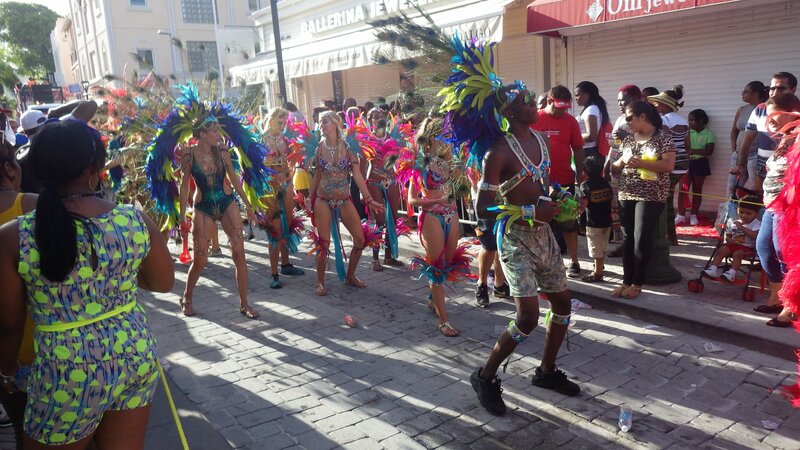 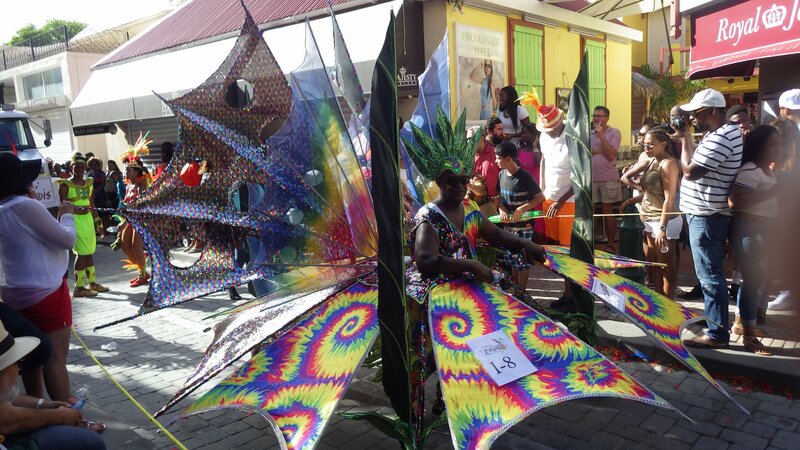 We also had a chance to visit a Caribbean Carnival in Phillipsburg. 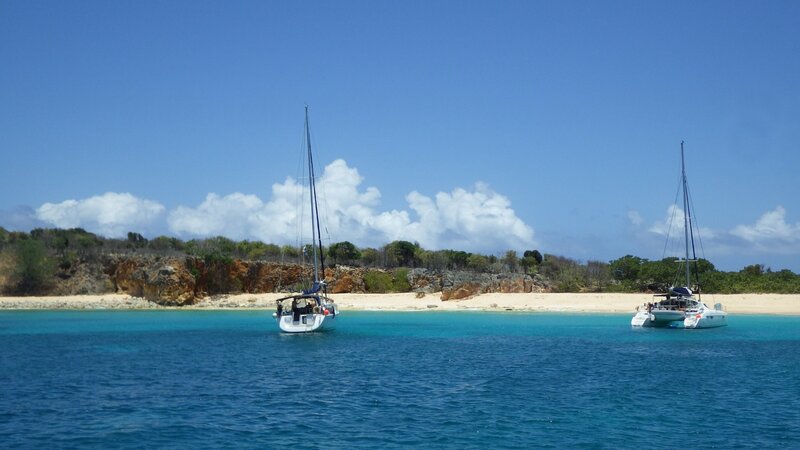 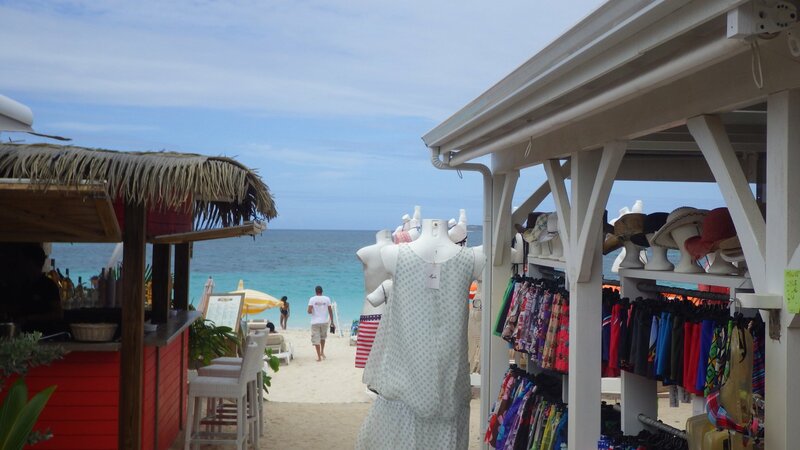 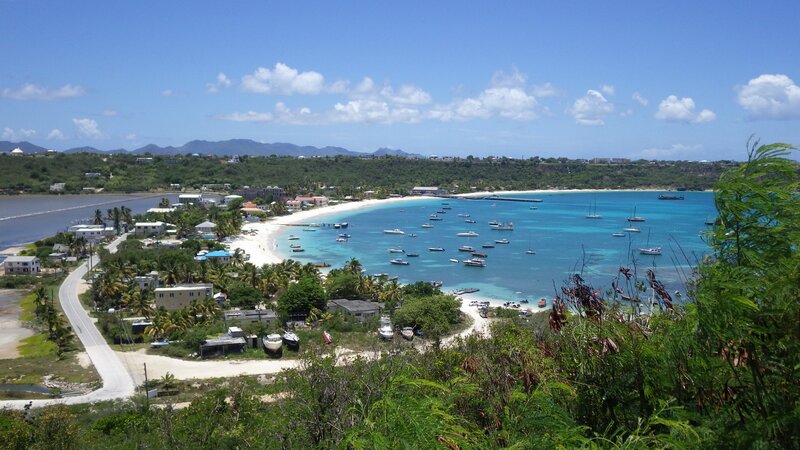 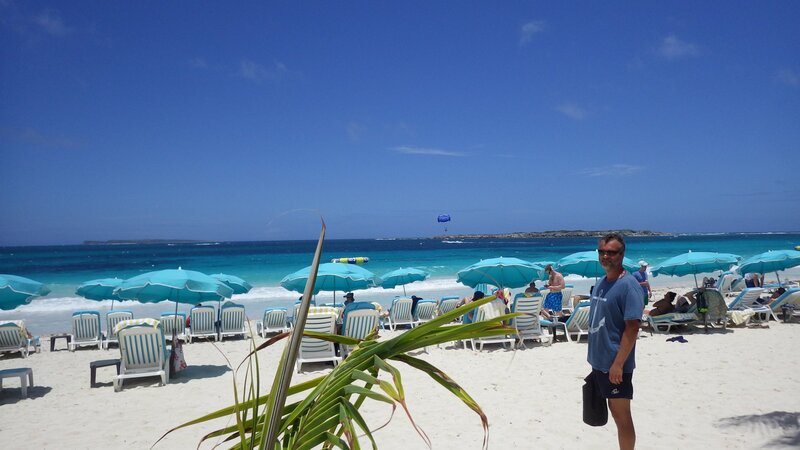 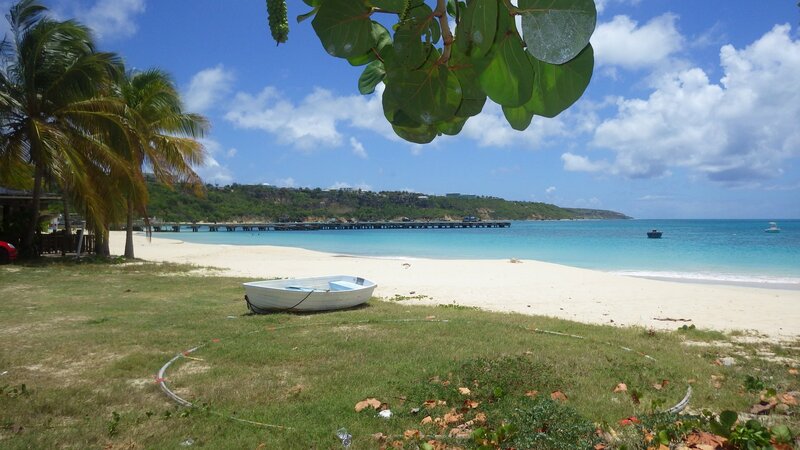 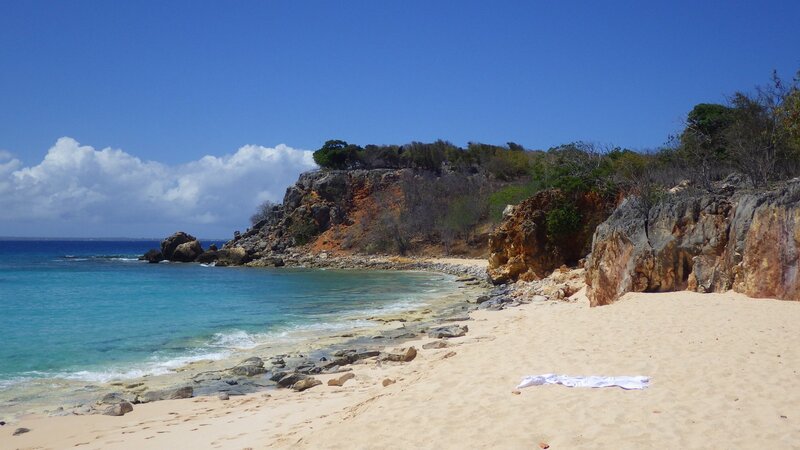 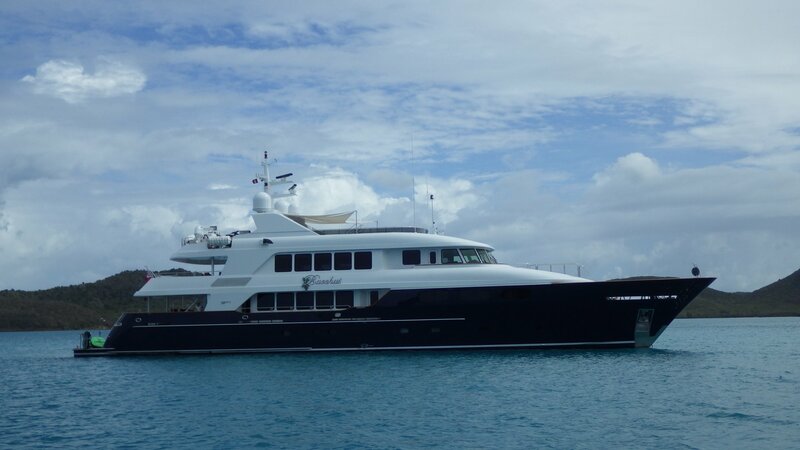 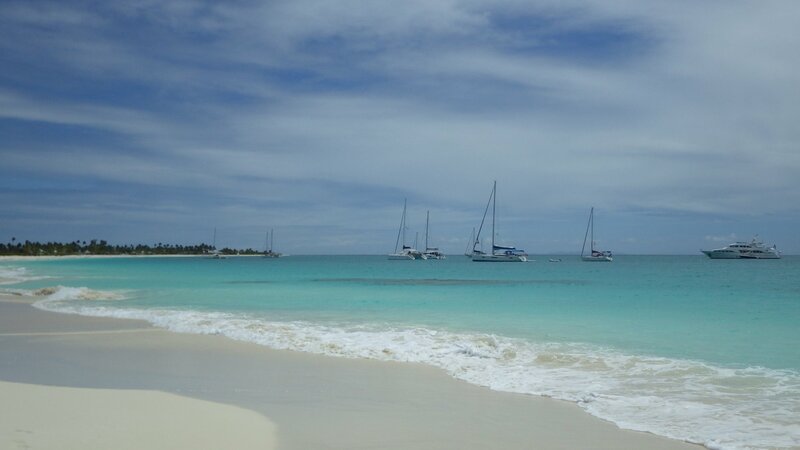 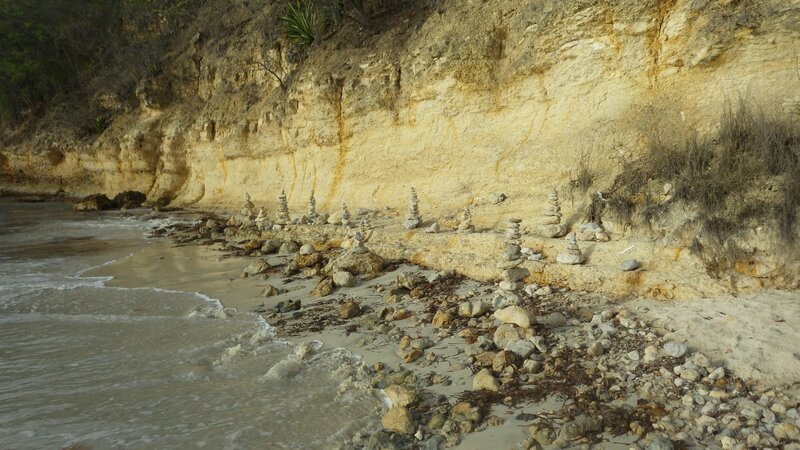 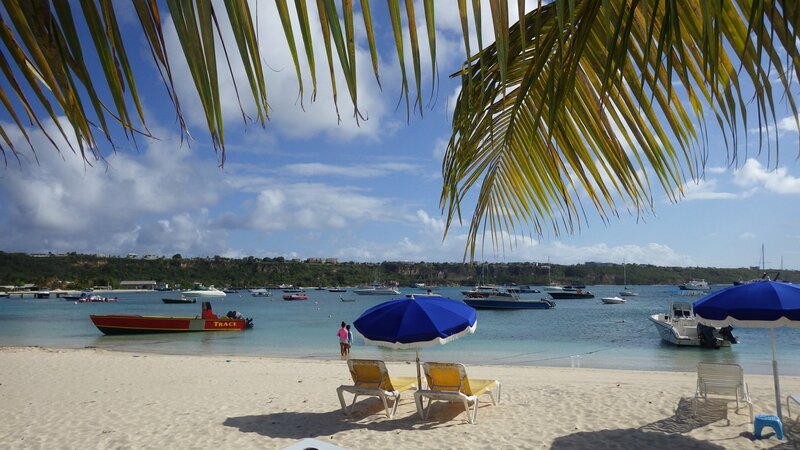 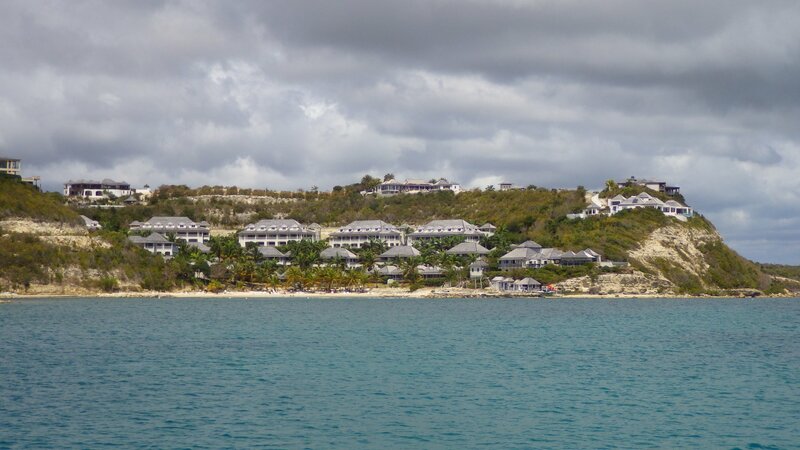 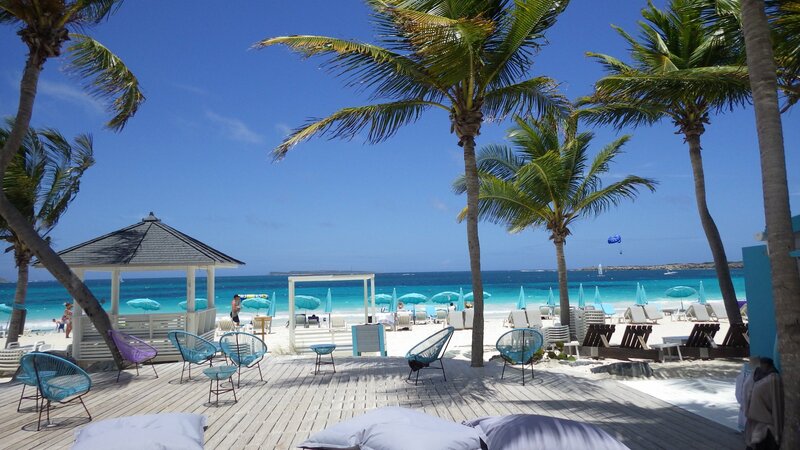 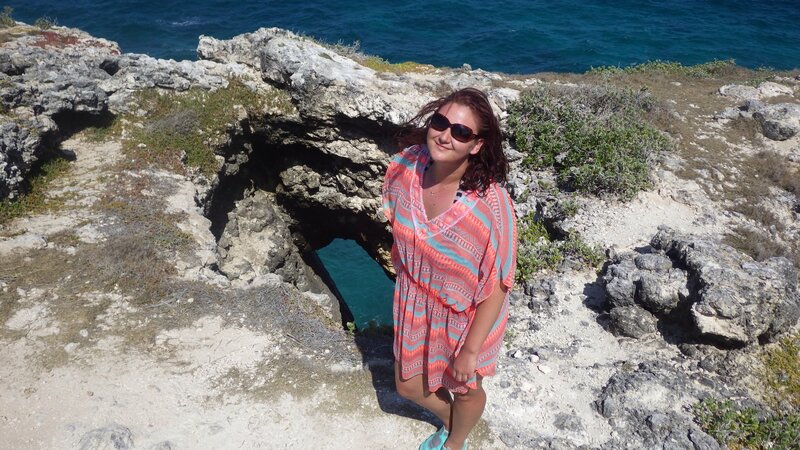 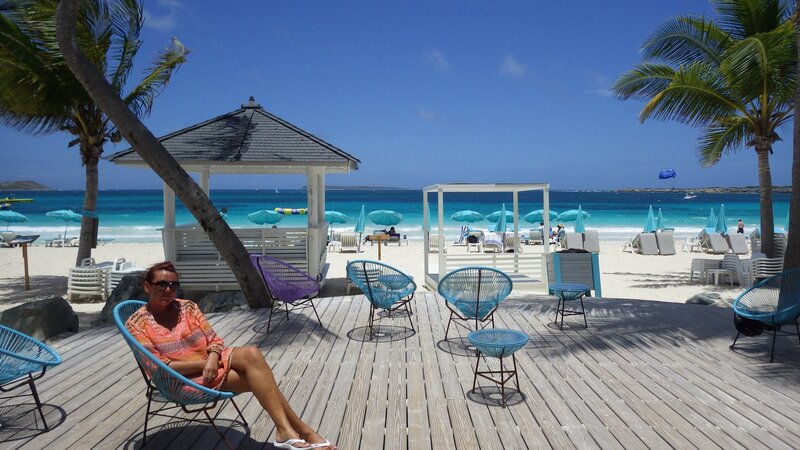 Anguilla is only few miles north of St. Martin, so we decided to visit it before leaving for Virgin Islands. 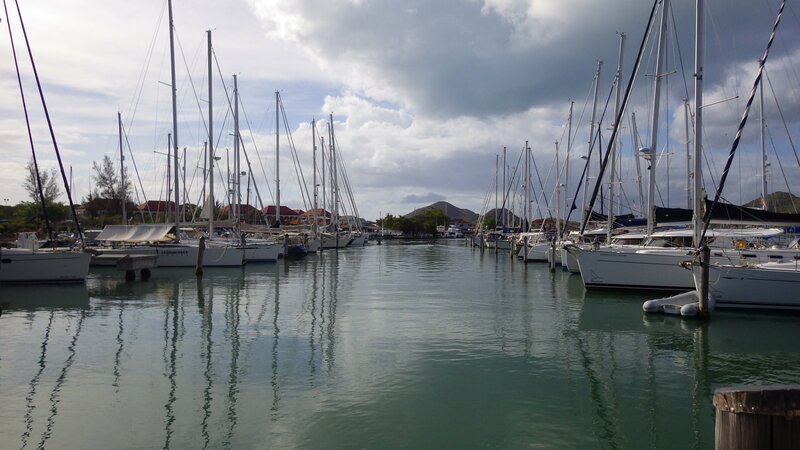 There are few nice anchorages around the island, however there are also restrictions and fairly steep daily charges to use many of them, so we stayed here only few days.